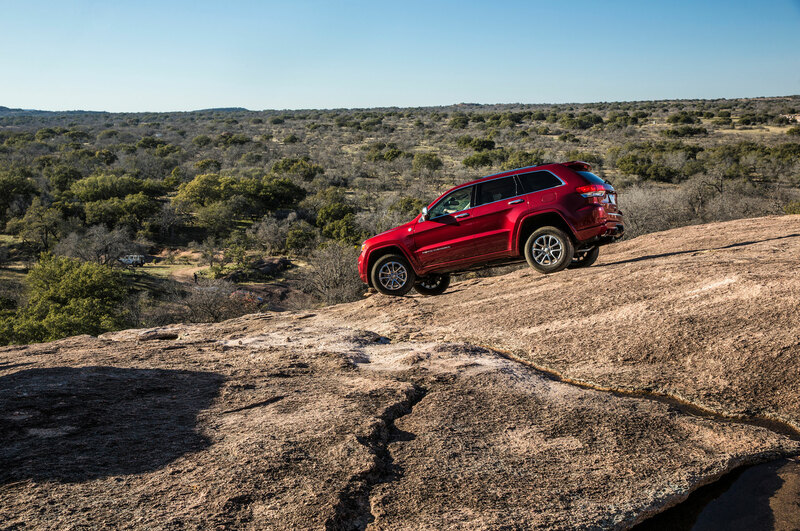 AUSTIN, Texas — Think of the Jeep Grand Cherokee as an ant. 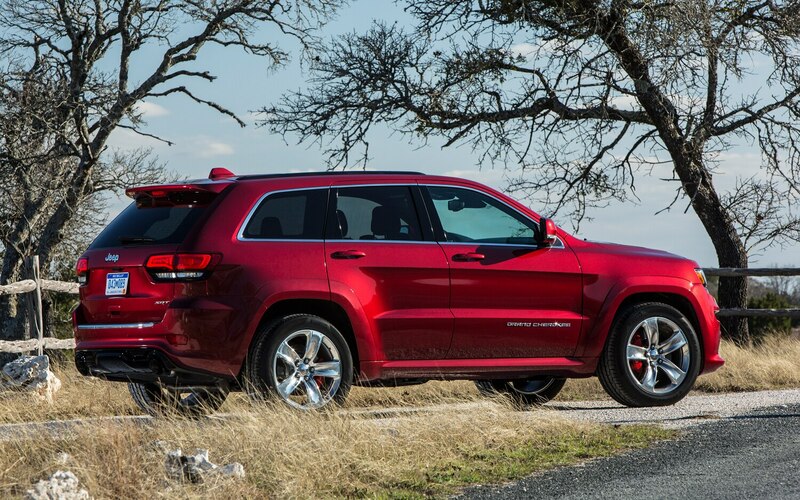 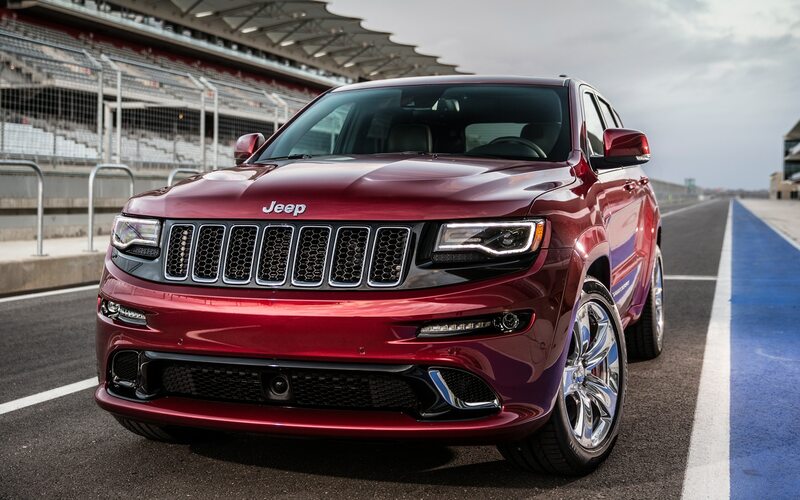 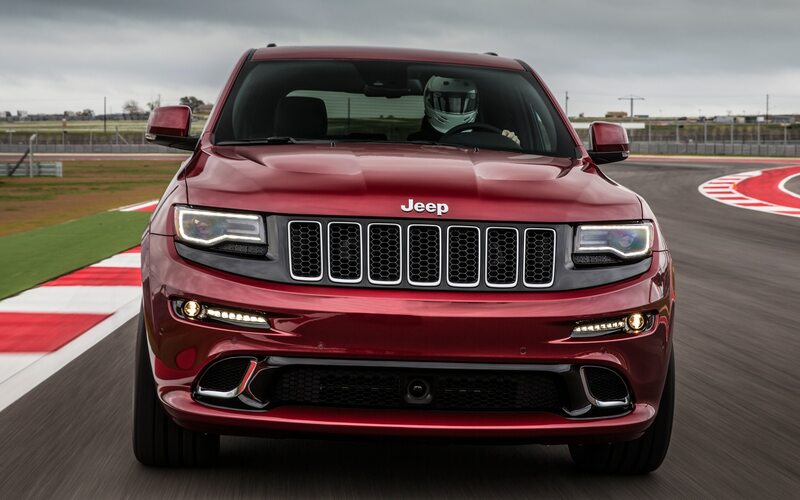 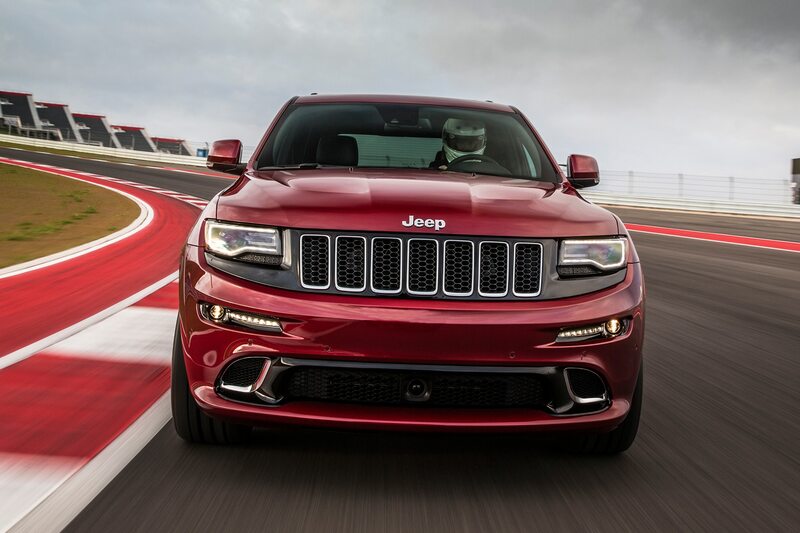 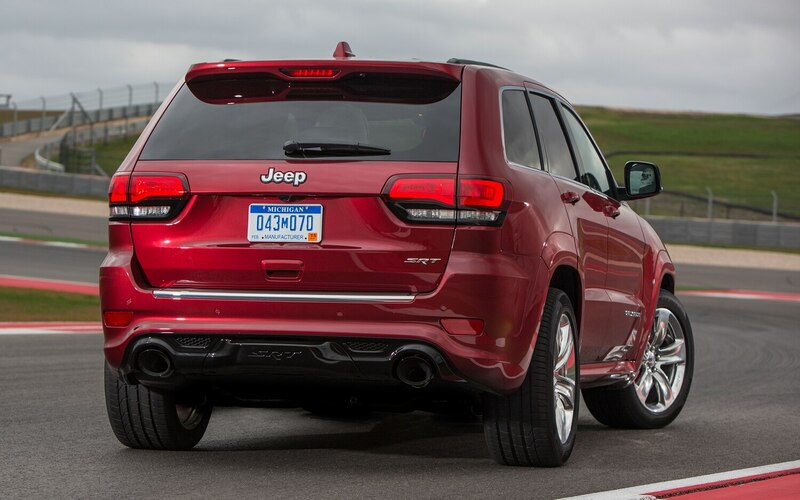 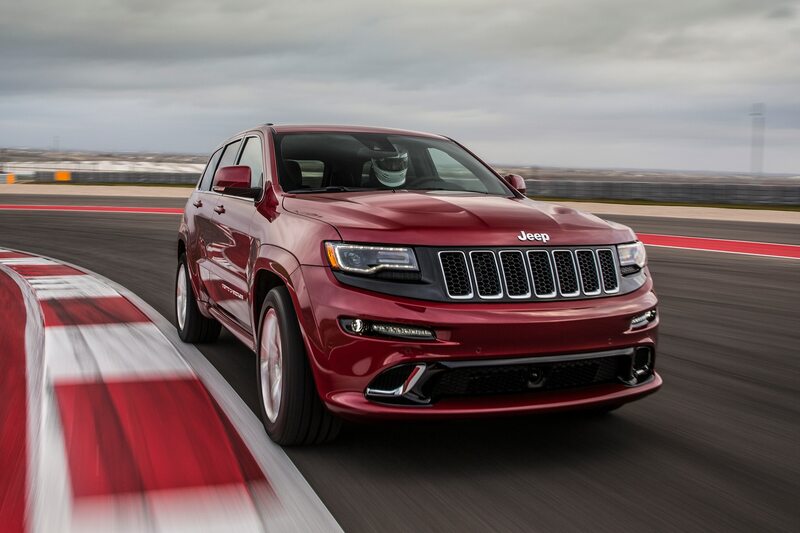 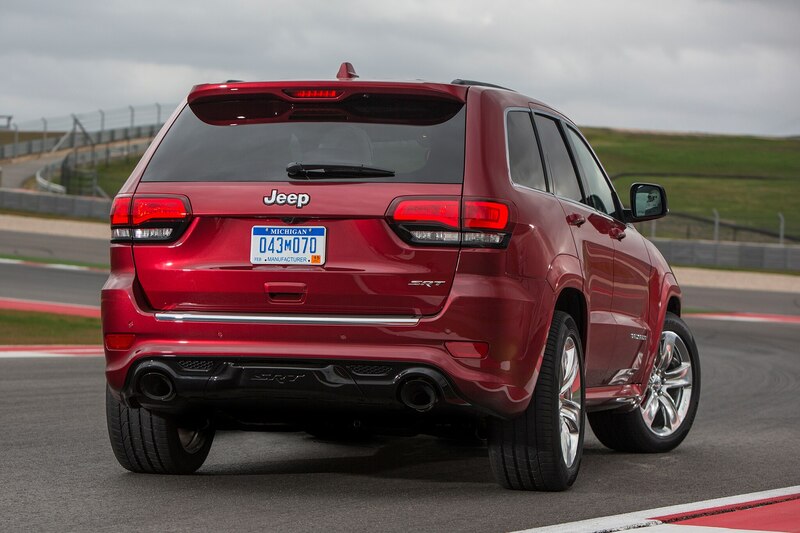 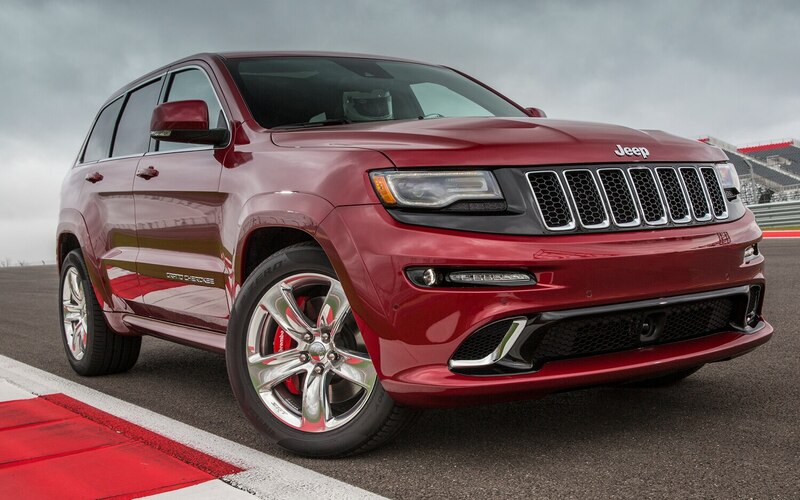 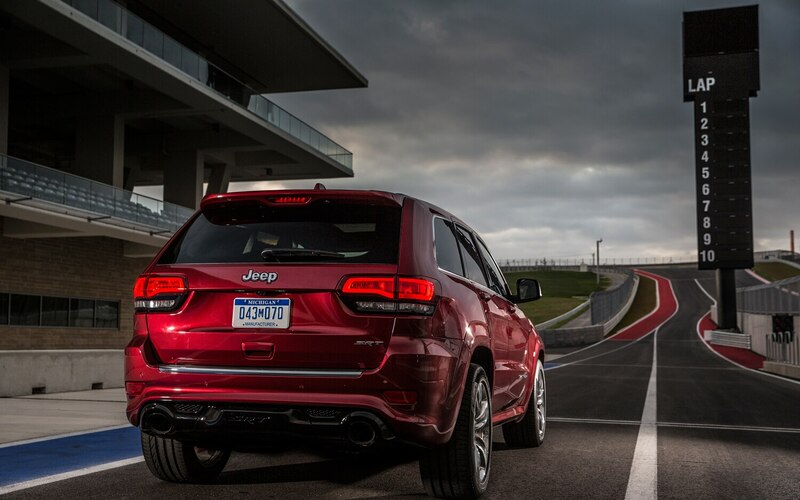 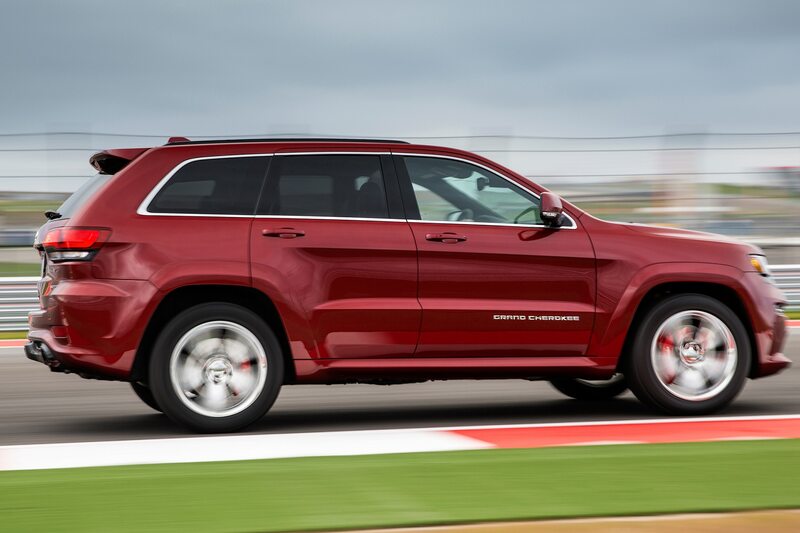 As ant species extend from innocent little pismires in your yard to hellacious fire ants that plague ranches in central Texas, the Grand Cherokee family extends from the bargain-priced Laredo to the ravenous SRT that has now devoured the Circuit of the Americas. 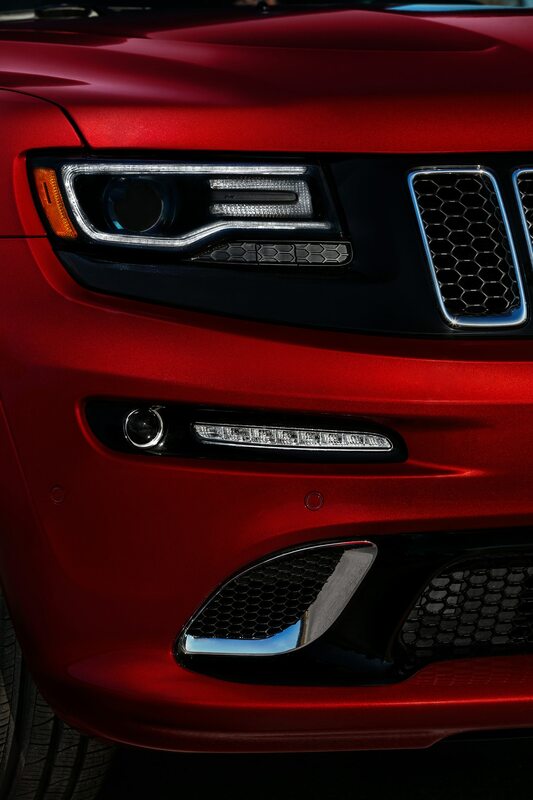 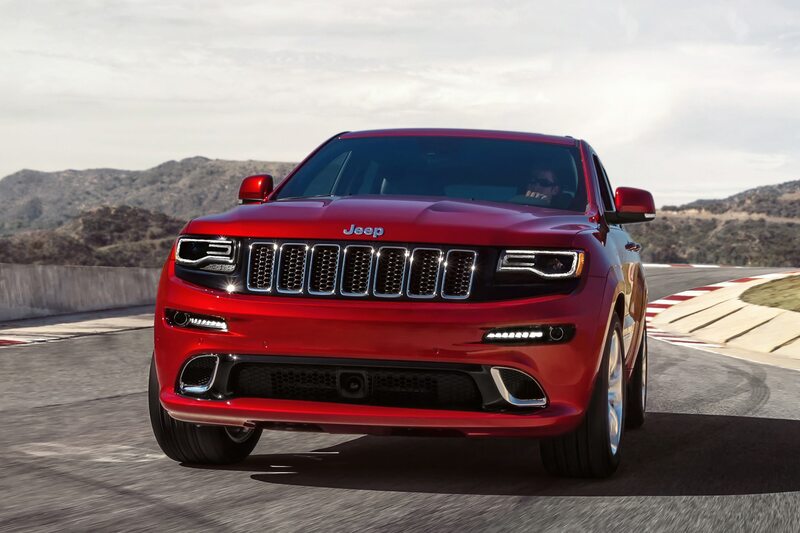 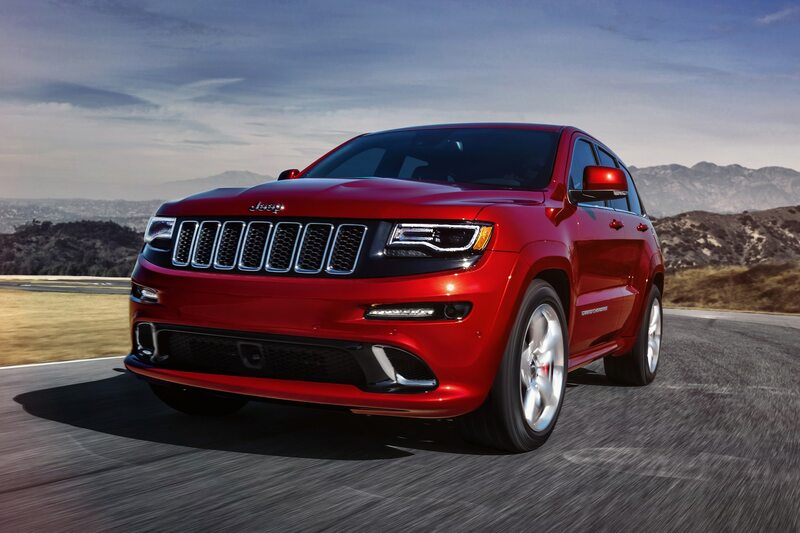 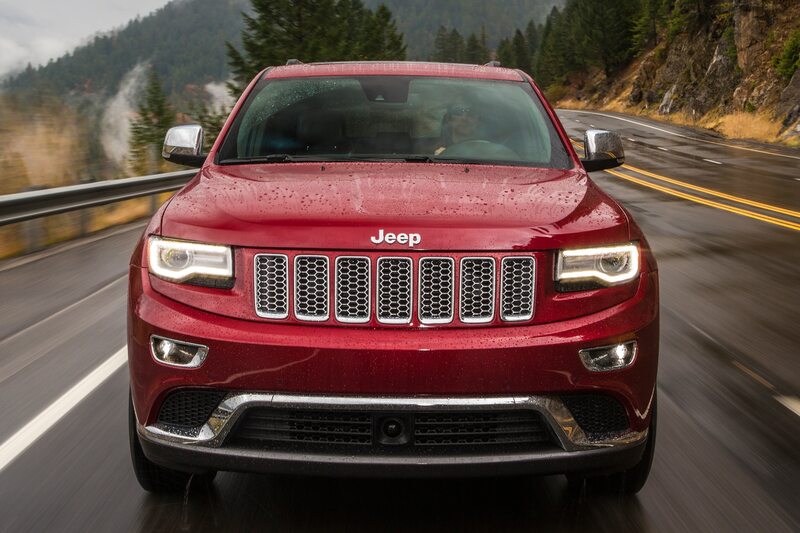 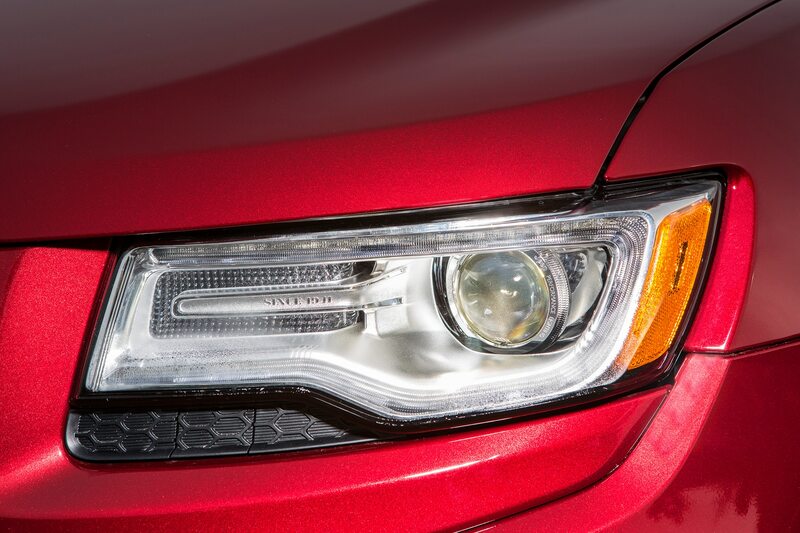 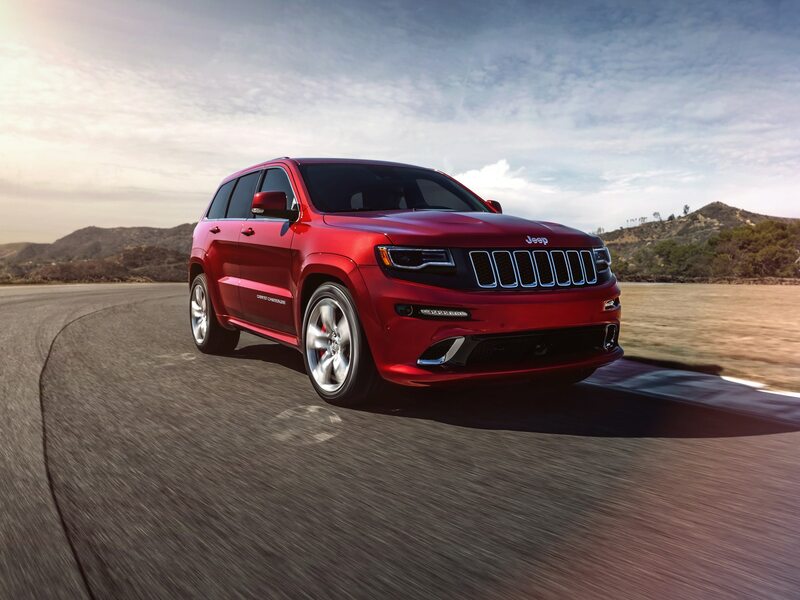 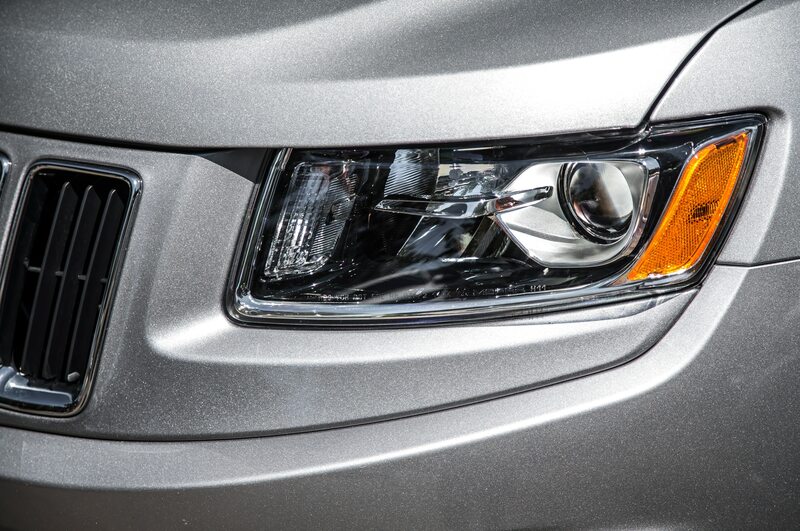 With its compound eyes roving on prey, from the hapless Toyota Highlander to the BMW X5 M, the refreshed Grand Cherokee shows impressive adaptivity. 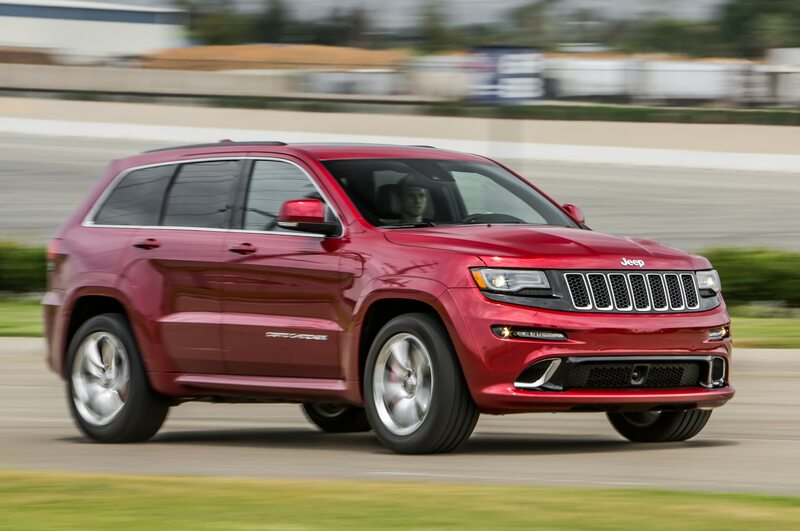 Of the gamut of changes for 2014, a few in particular stand out. 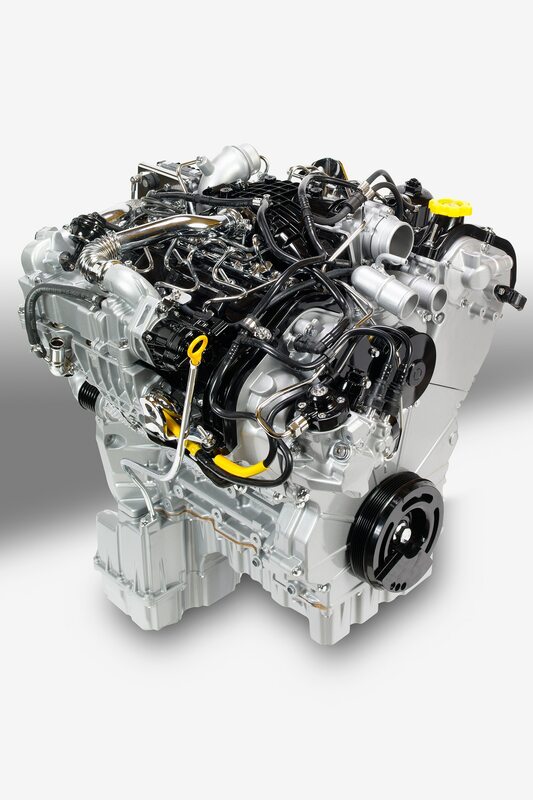 One is the available DOHC 3.0-liter turbo-diesel V-6. 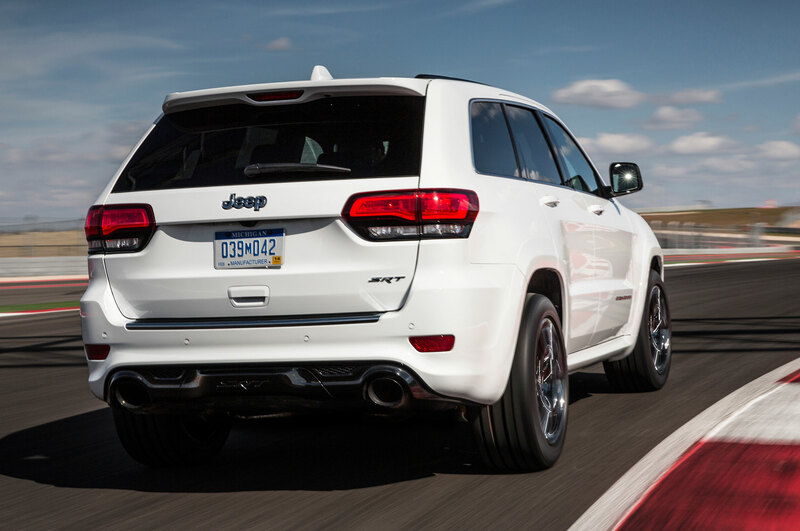 Joining its gasoline-inhaling teammates, namely, the DOHC 3.6-liter V-6 and 5.7-liter V-8, this oil-burner is available for a $2300 premium. 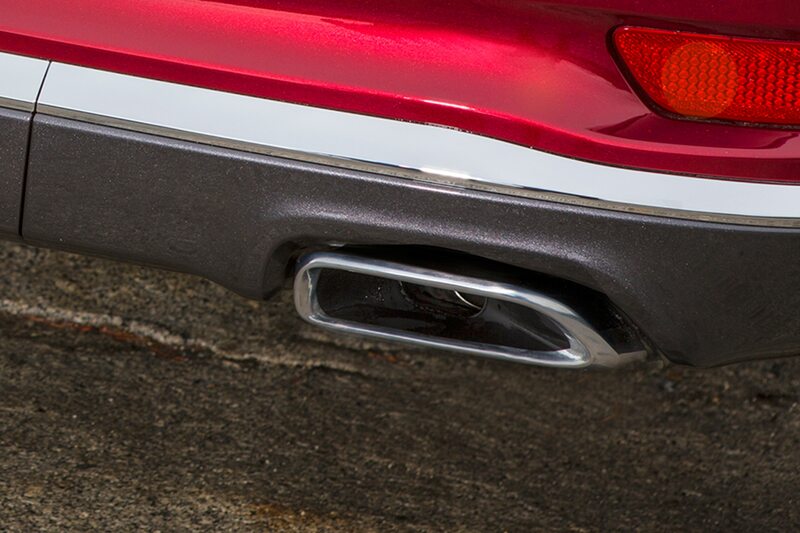 Generating 240 hp and 420 lb-ft, it announces itself with a grumble and a tangy whiff from the tailpipe. 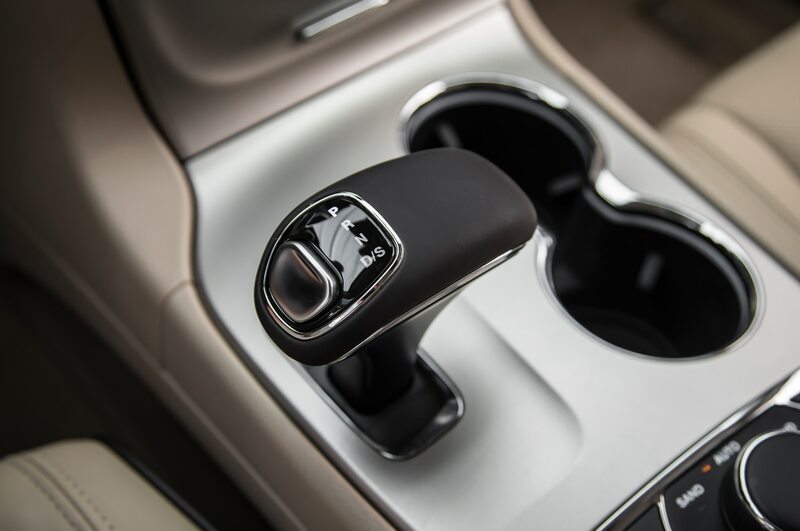 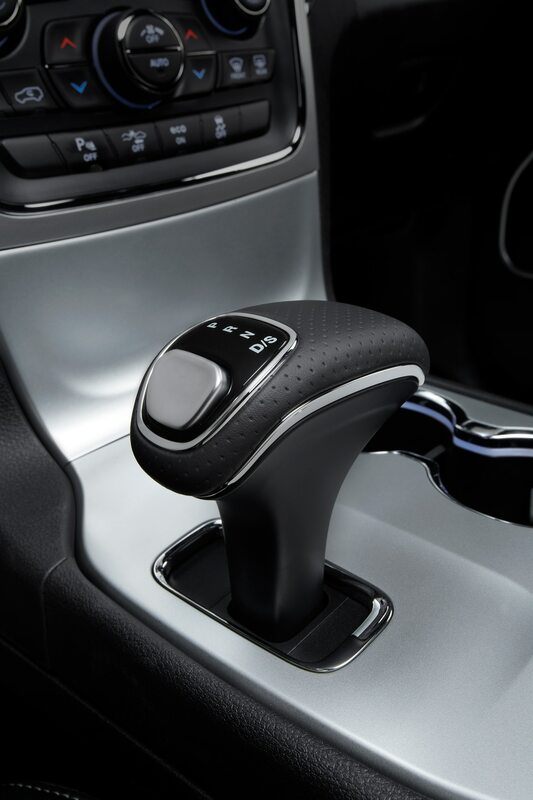 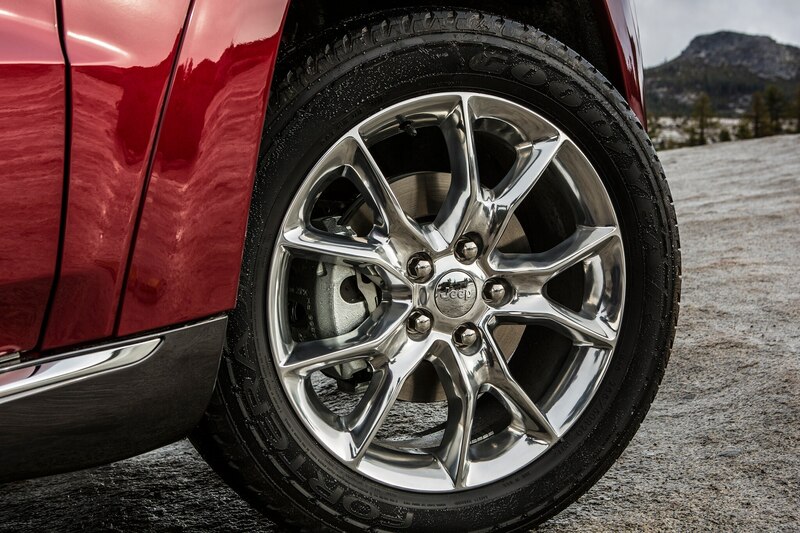 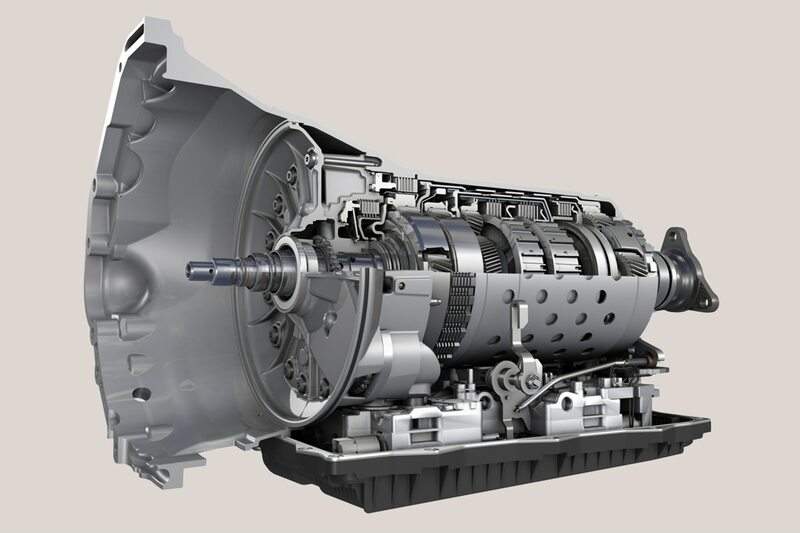 Another change is the eight-speed automatic transmission that’s now applied across the lineup. 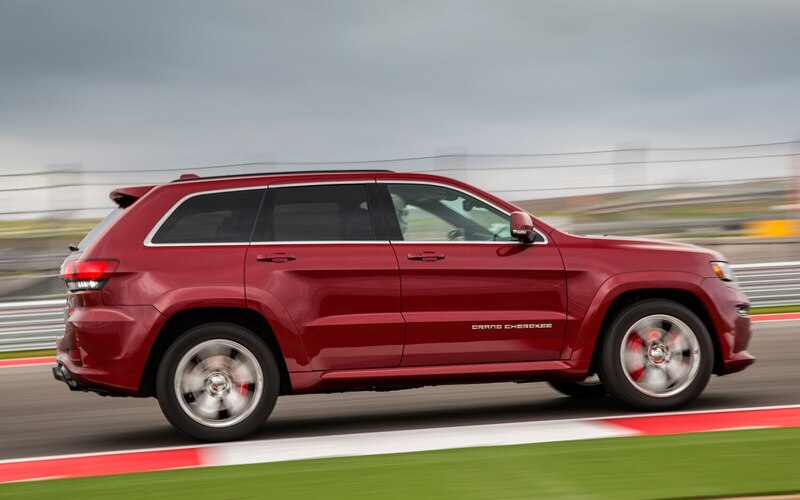 Mated with the diesel, it helps to produce a driving experience marked by bust-your-chops acceleration and midrange body punches that lead to TKOs in the passing zone. 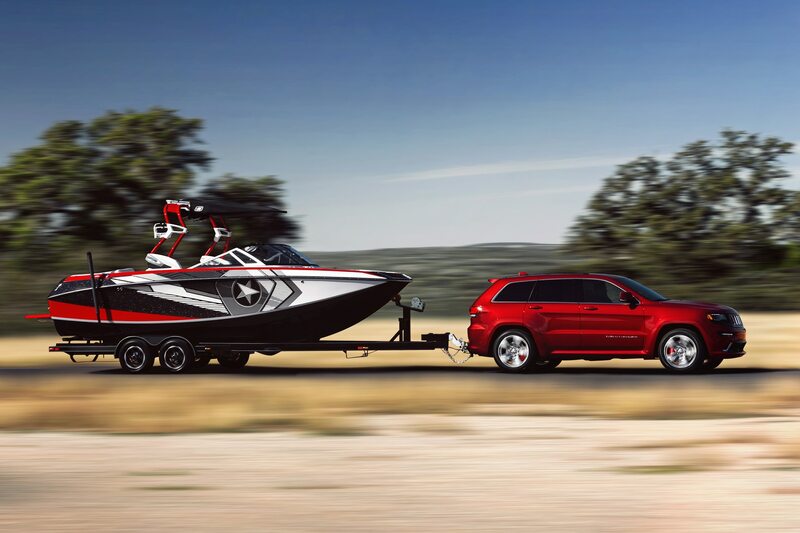 Tow up to 7400 pounds if you like. 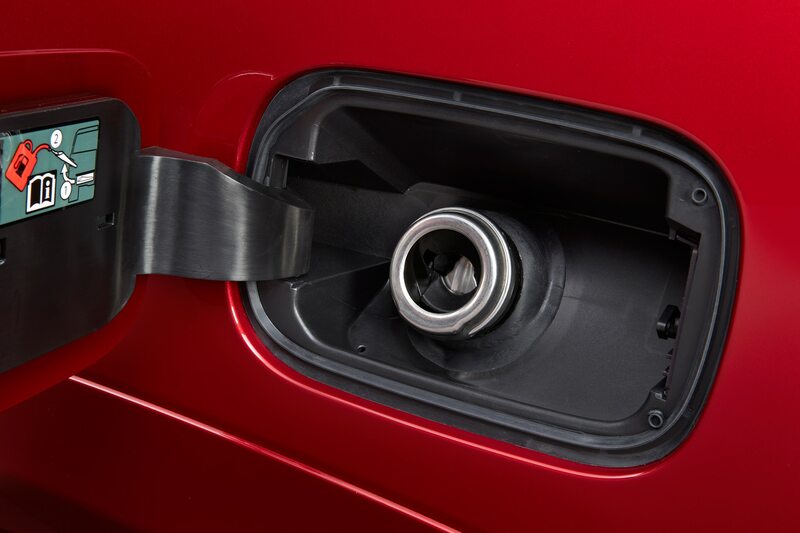 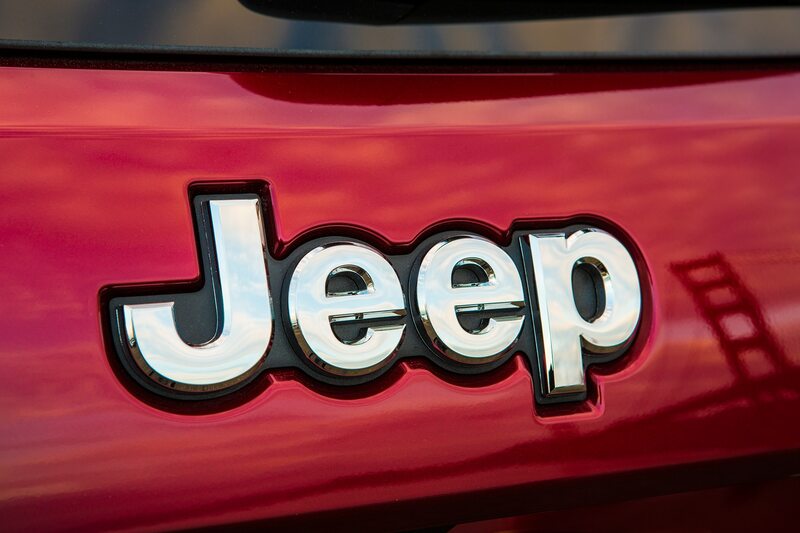 Meanwhile, fuel economy improves by around 20 percent, with a top result of 30 mpg, according to Jeep’s latest estimates. 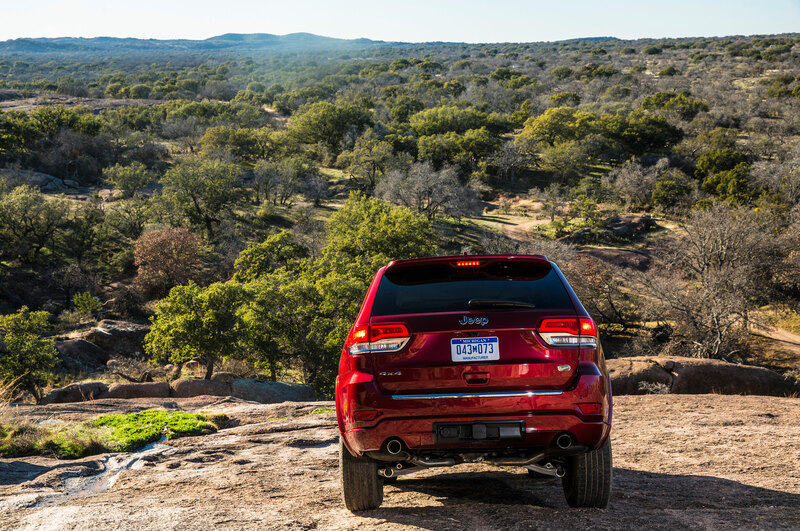 Range approaches 730 miles. 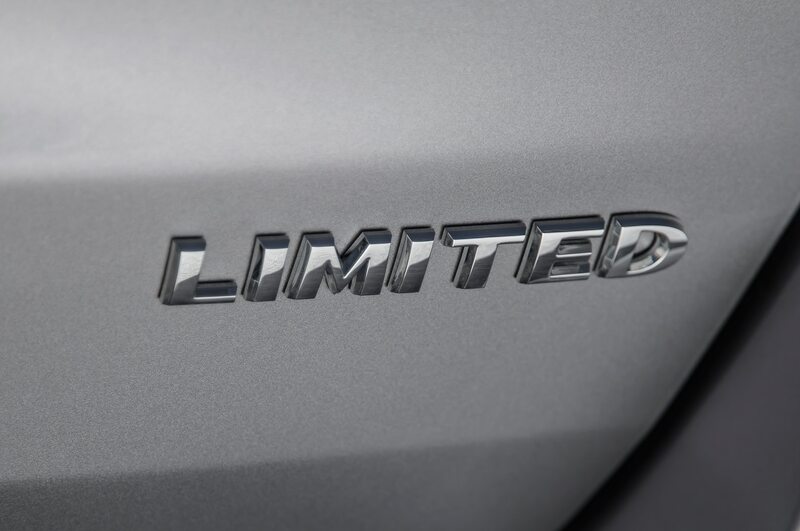 We experienced a feeling of invincibility when driving the diesel-powered Summit, which is the luxurious new model that presides over the Laredo, Limited, and Overland. 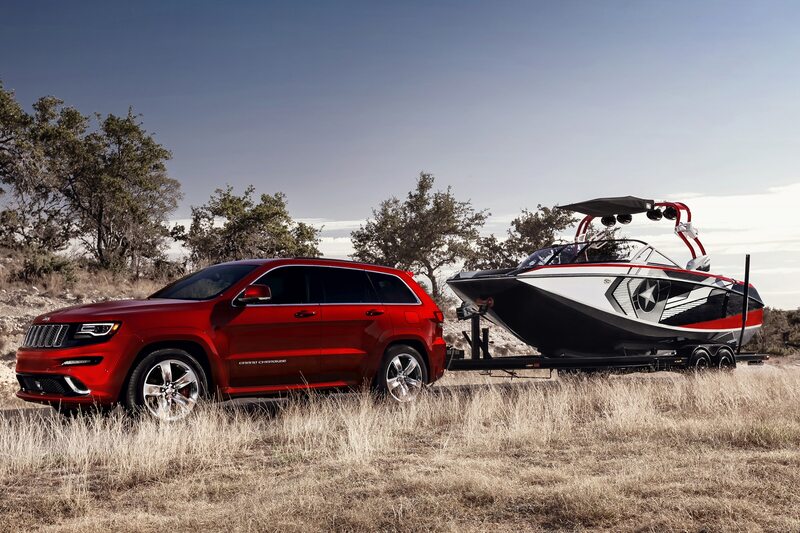 (All reach showrooms in March, while the diesel, offered in all but the Laredo trim, come out this summer.) 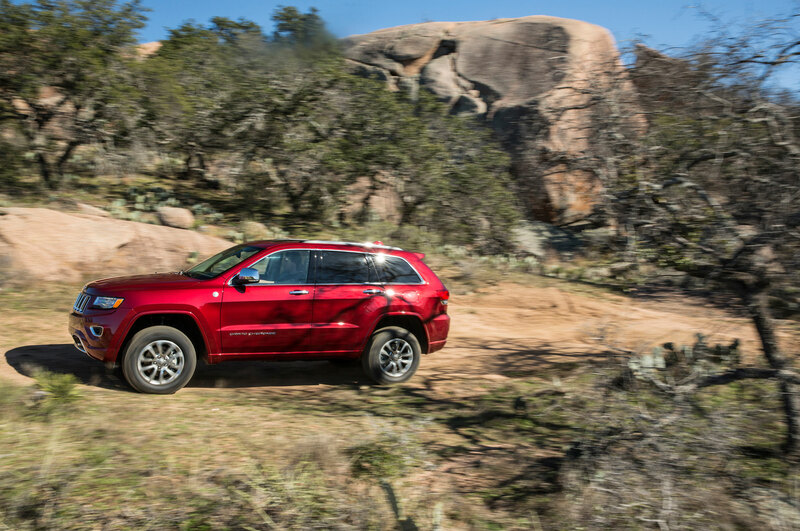 A feline rumble emanated from under the oil-burner’s hood, but the structure of this big Jeep was so solid that we wafted through the Hill Country in splendid isolation. 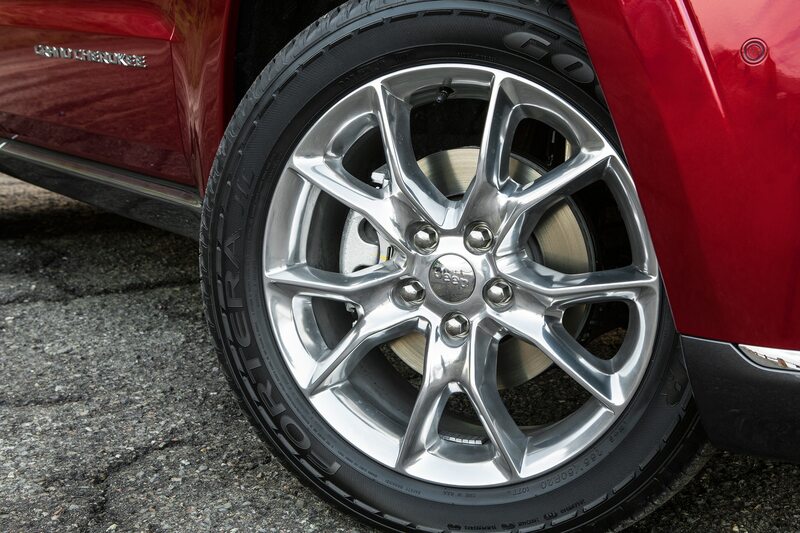 Ride quality was excellent; the motions of the Summit’s standard 20-inch wheels were beautifully well controlled, trivializing patched sections of pavement. 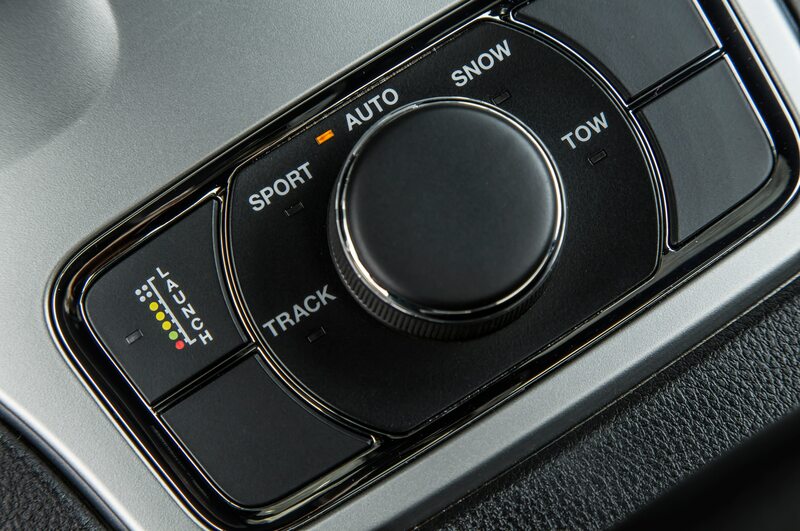 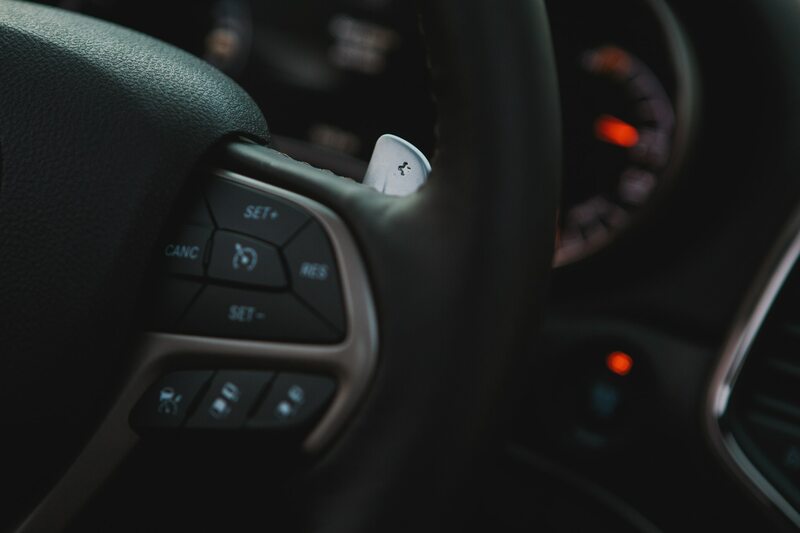 Meanwhile, on steep climbs or while overtaking slower vehicles, a flick of the paddle shifter seamlessly introduced a lower gear, and an increase of 500 rpm delivered the needed surge. 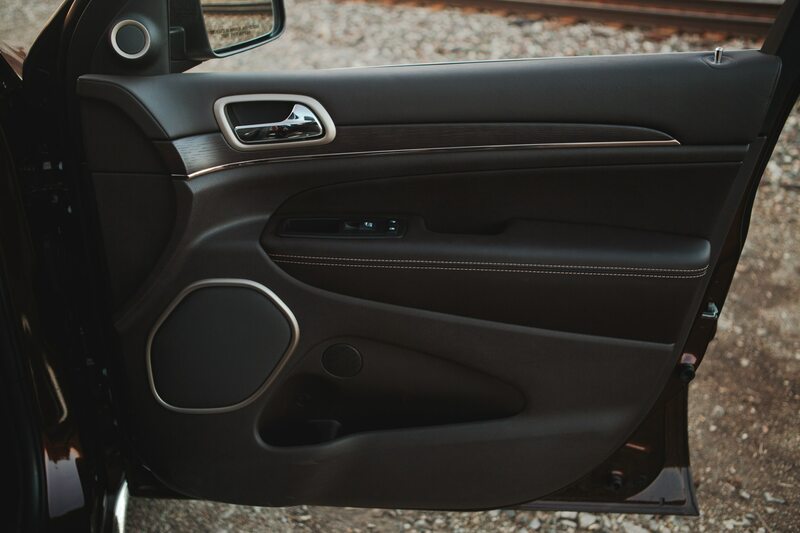 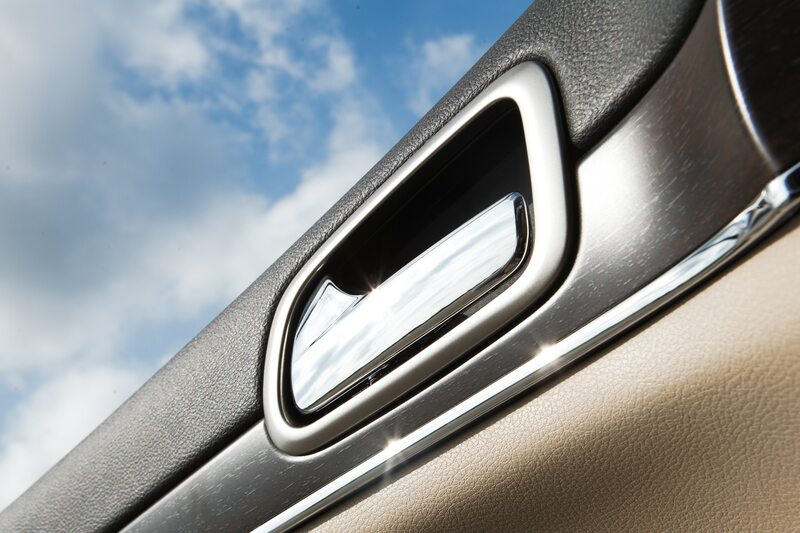 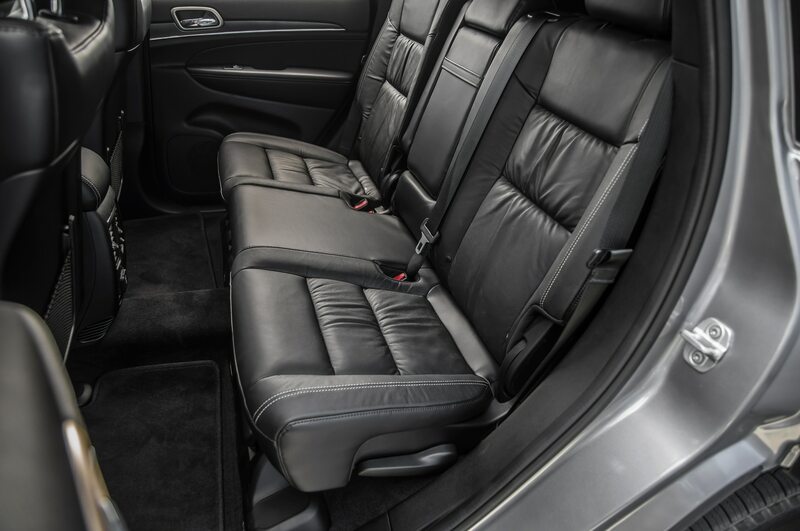 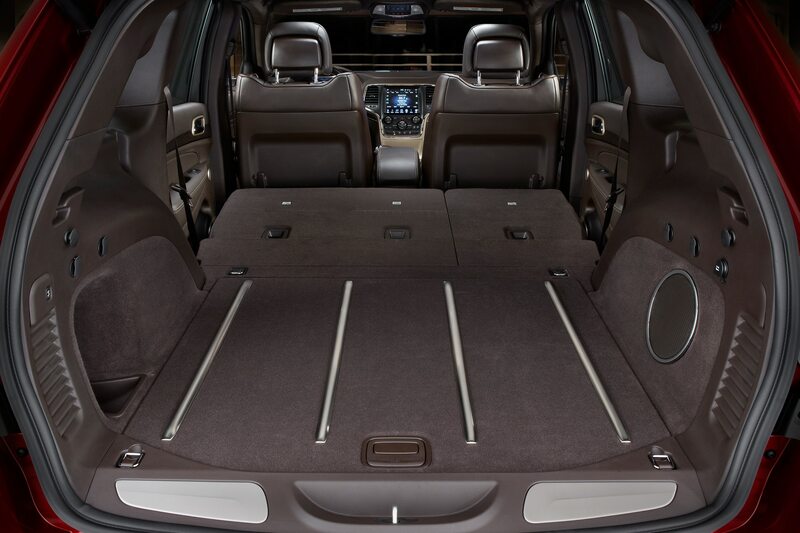 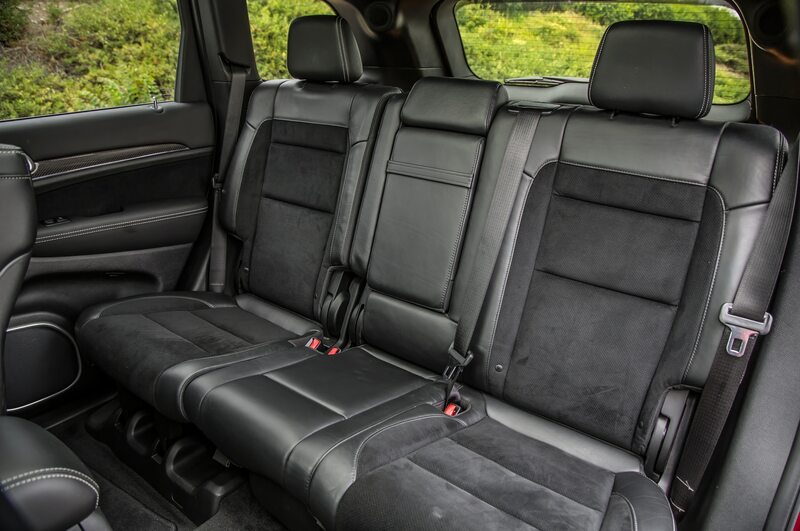 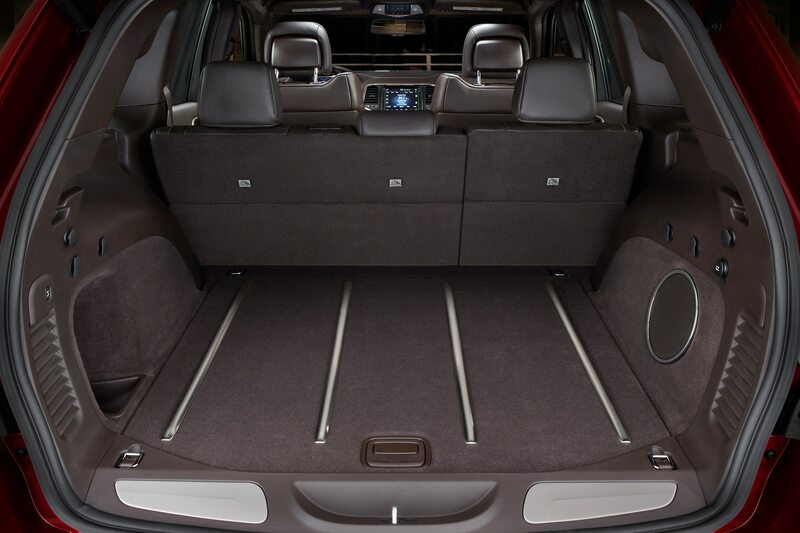 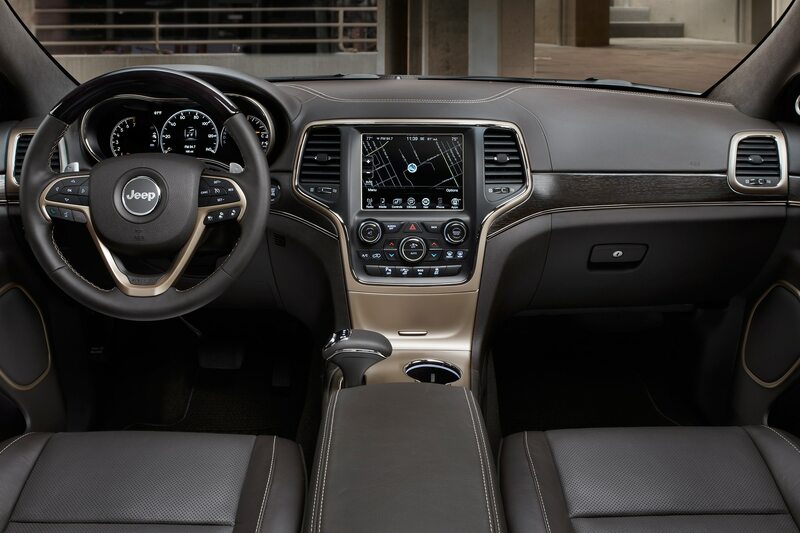 Adding in the 19-speaker audio system and leather-trimmed cabin made for a truly remarkable experience. 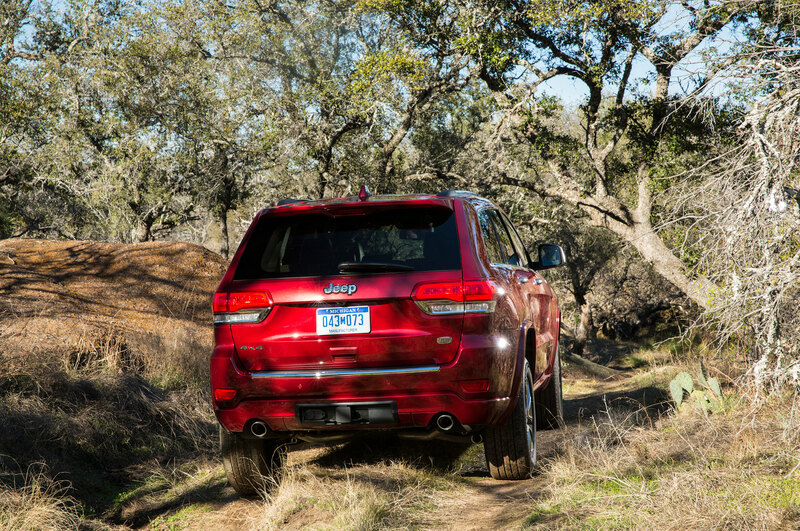 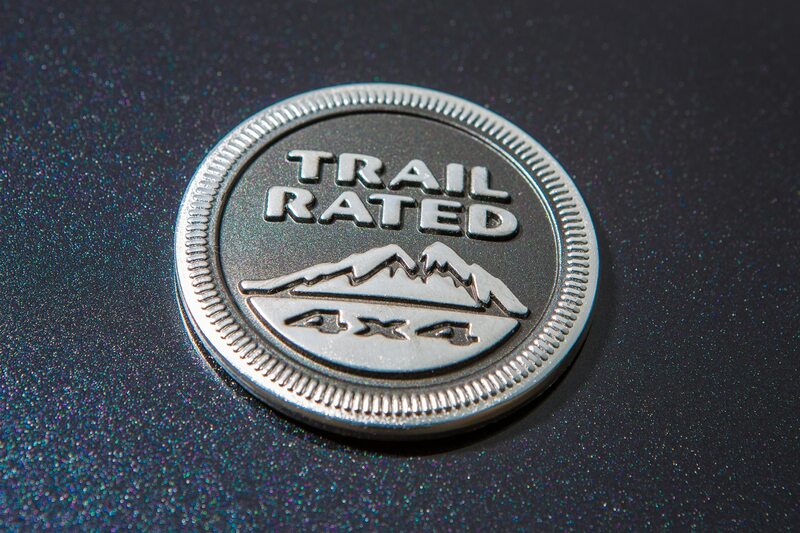 Yet this is a Jeep, so we sampled the gasoline V-8 and latest off-road features on trails over the Llano Uplift, an area of granite inclines and streambeds choked with coarse and soggy sand. 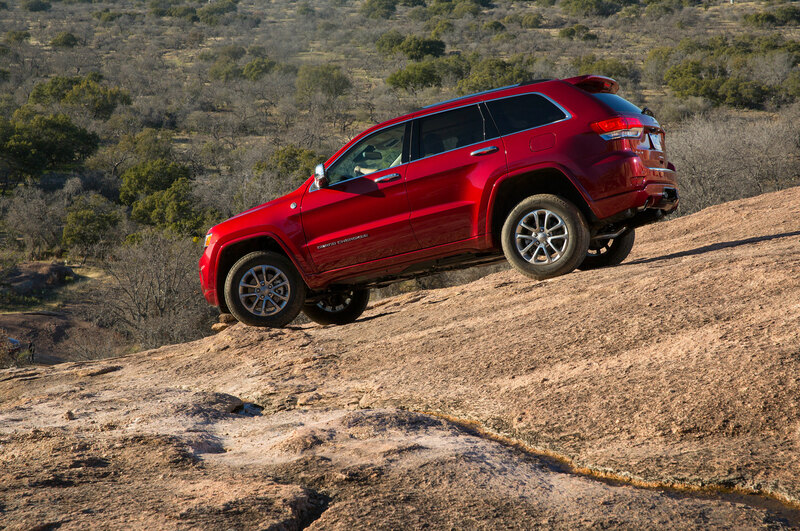 With a selection of five dynamic modes for obstacles from snow to rock, the ability to lift itself on air springs and create eleven inches of clearance, and selectable crawling speeds for uphill and downhill sections, the Summit made short work of the obstacles. 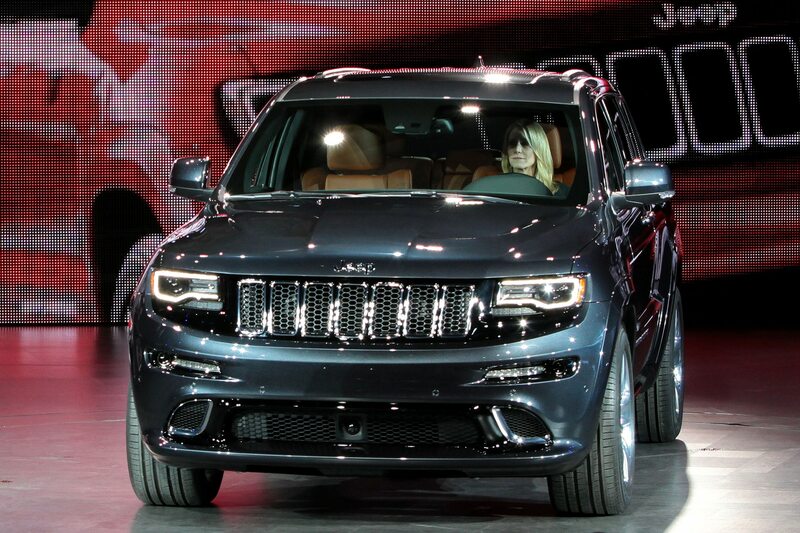 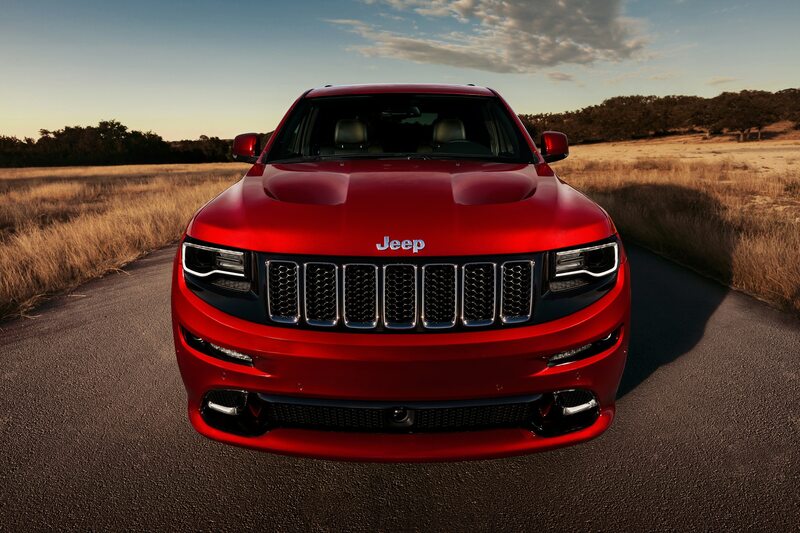 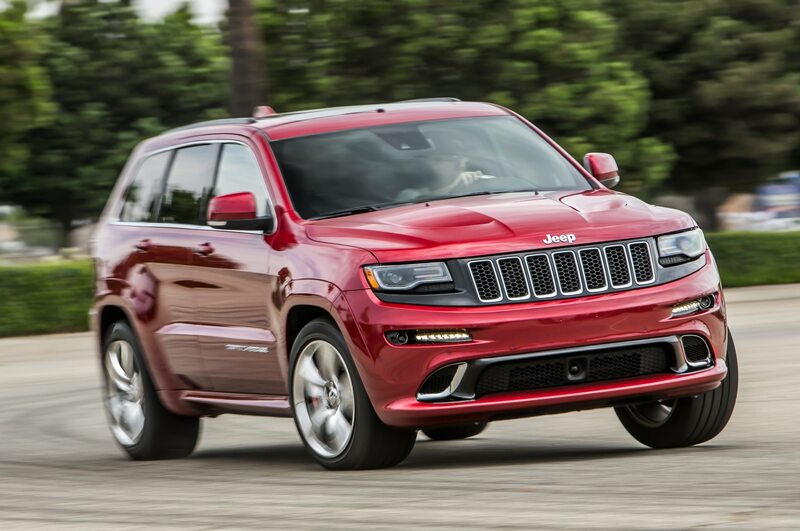 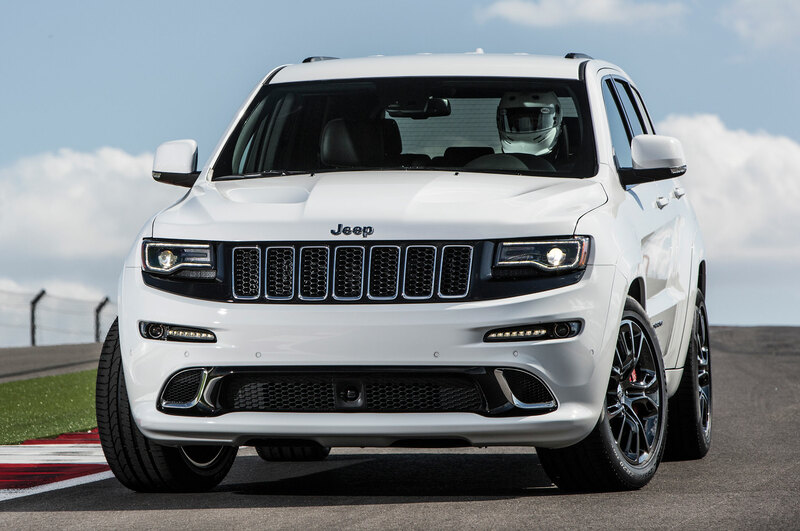 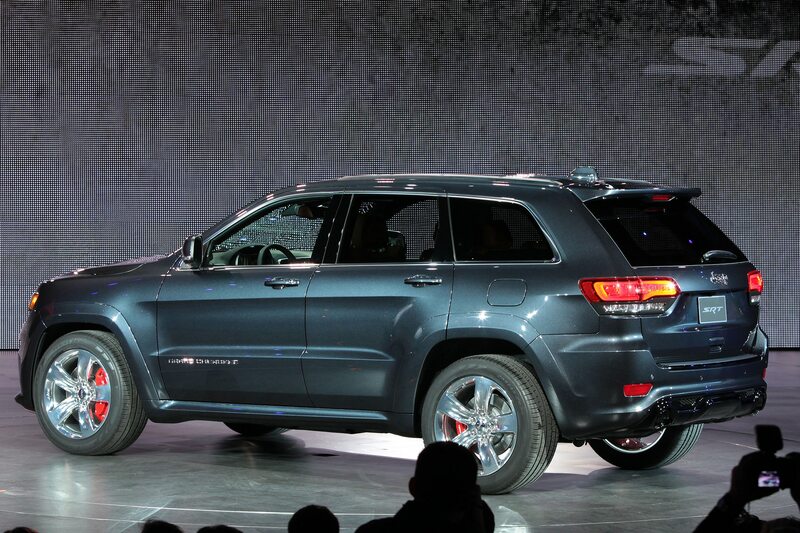 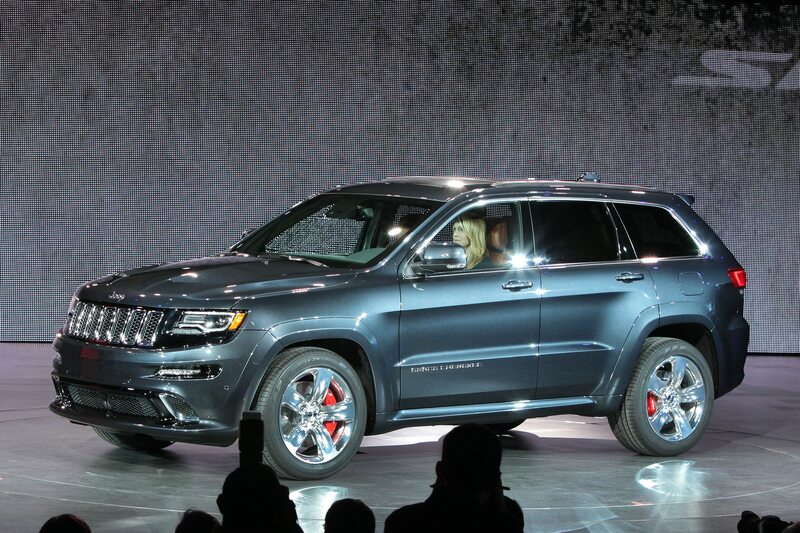 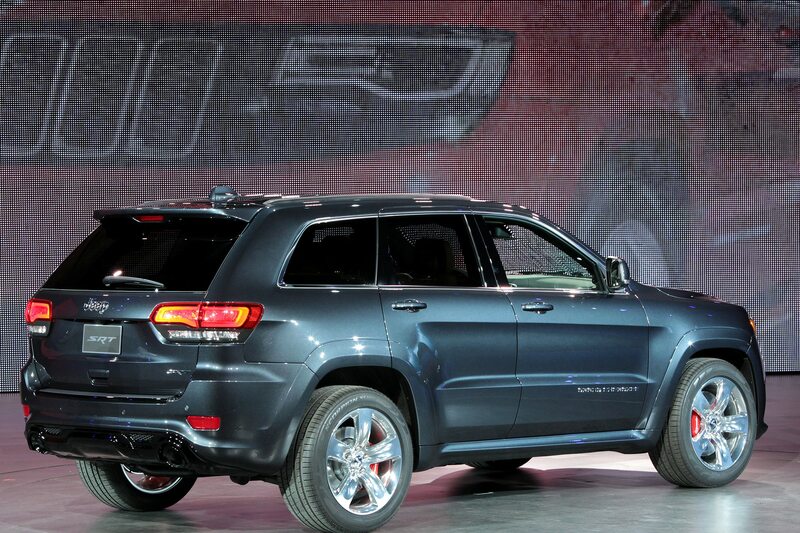 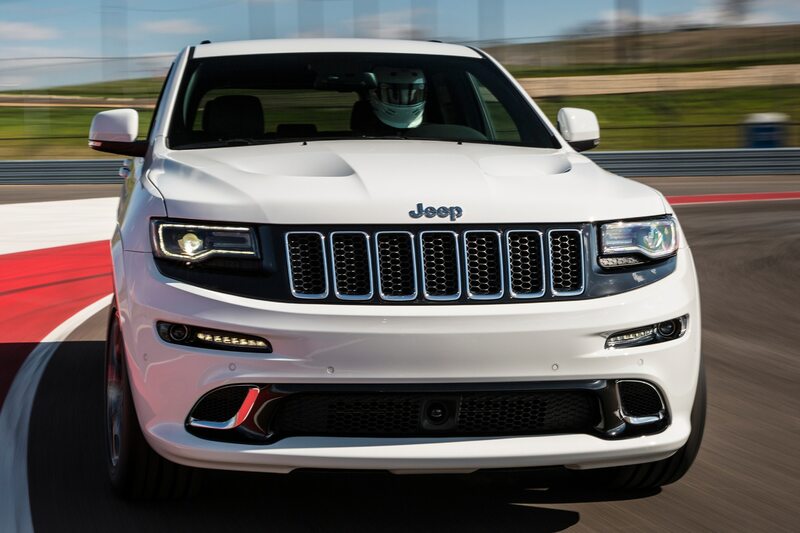 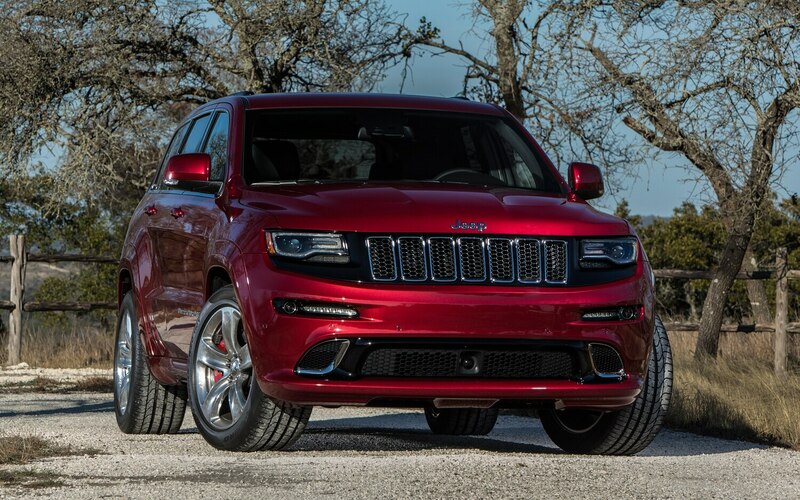 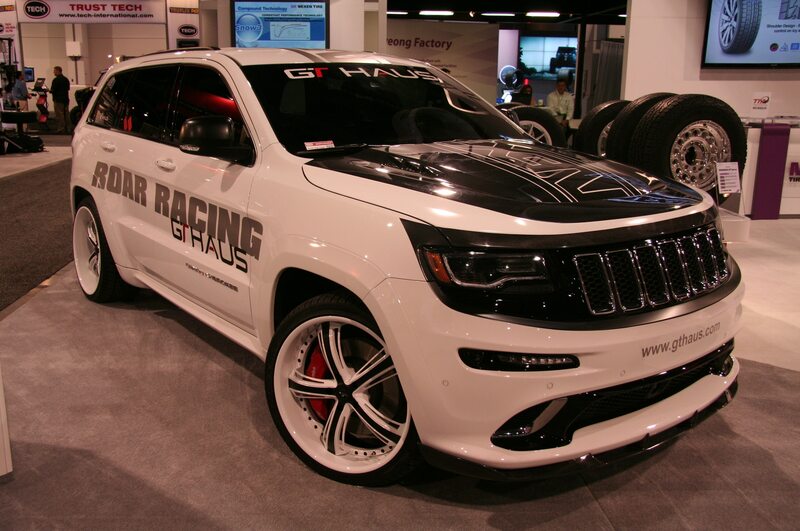 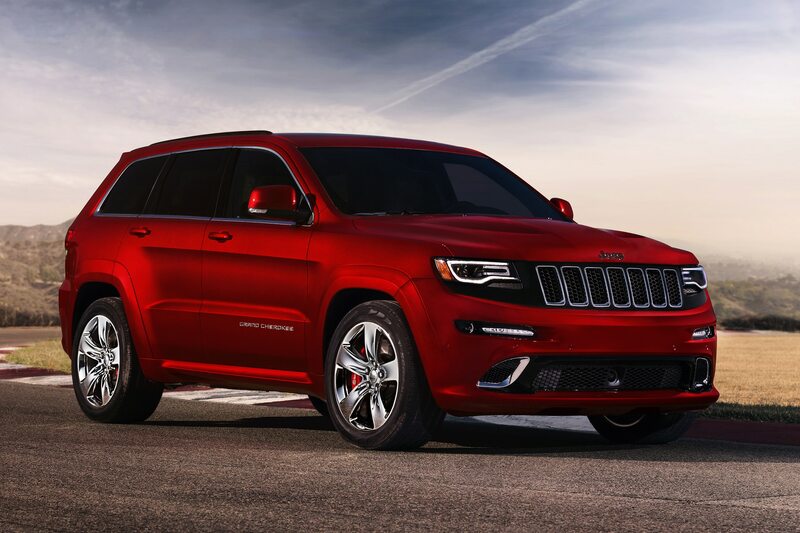 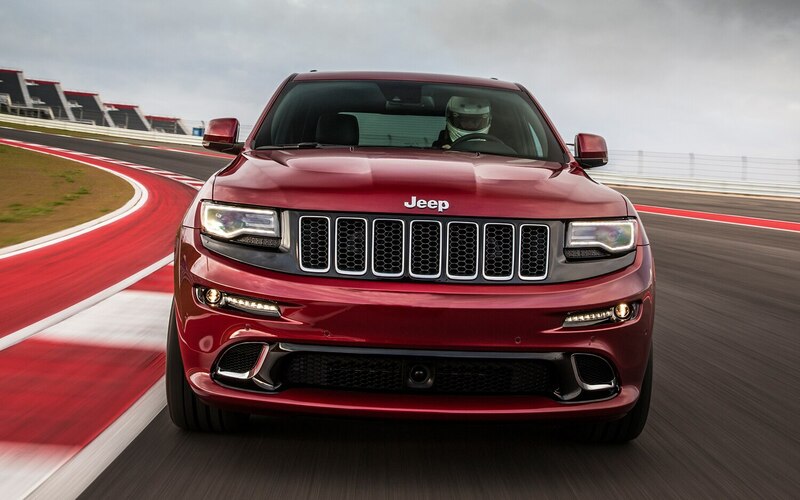 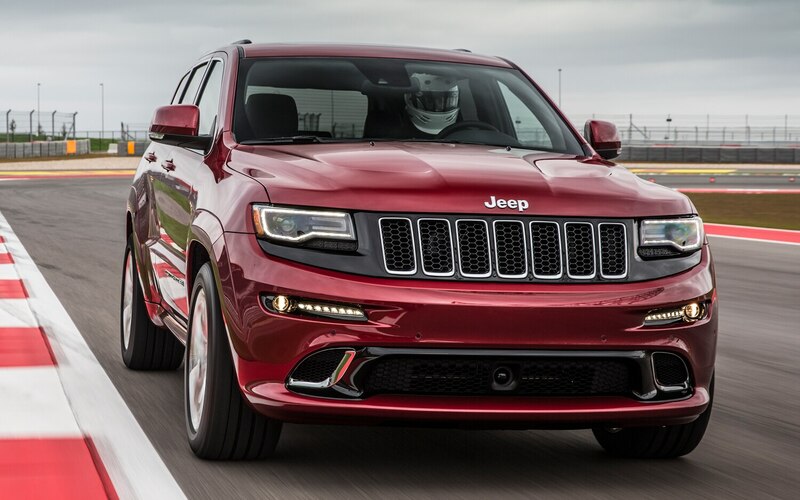 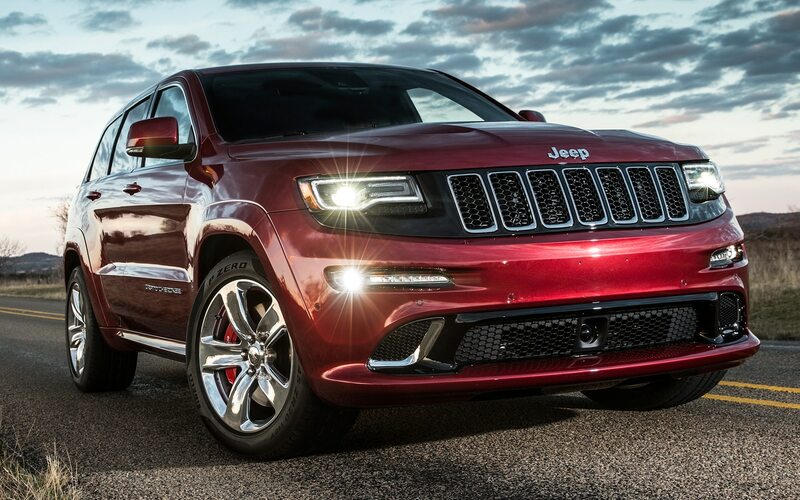 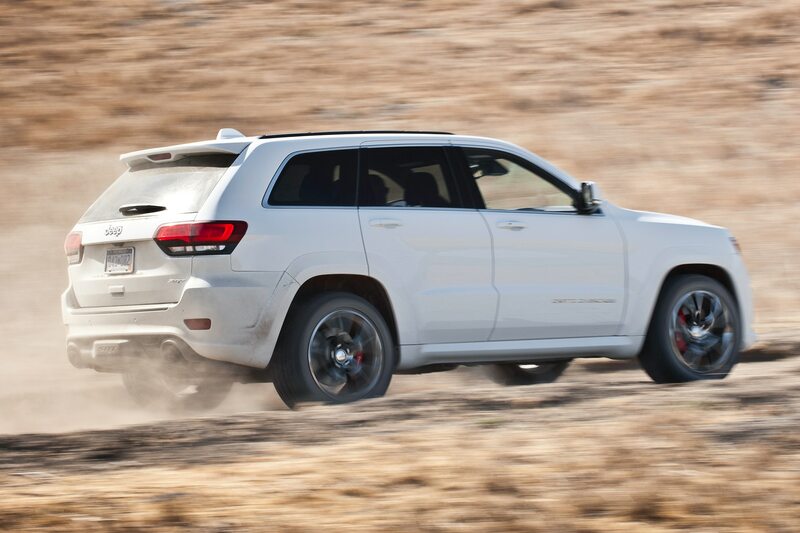 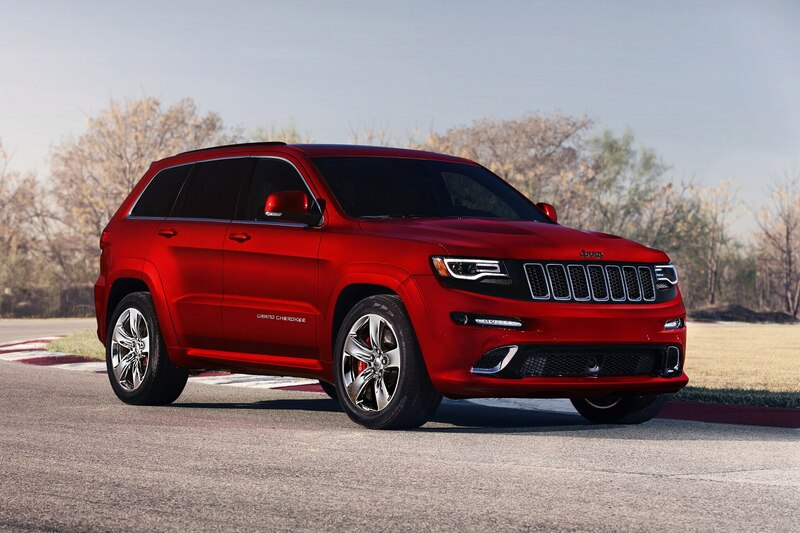 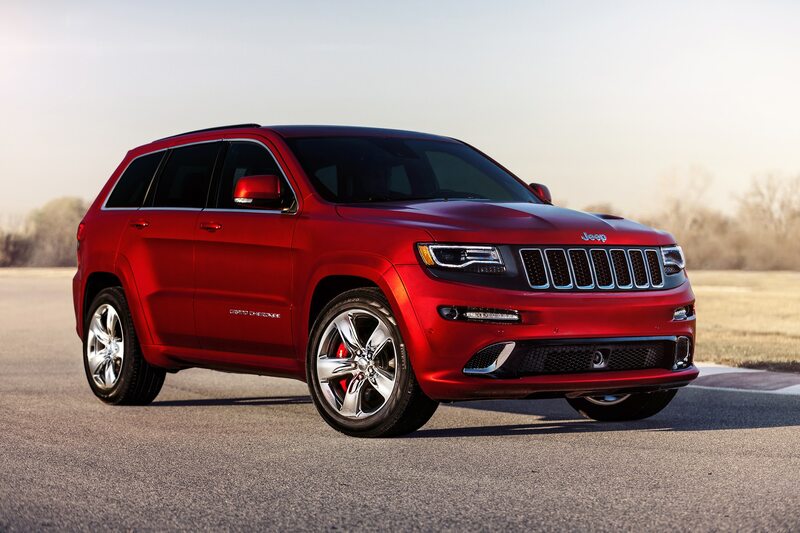 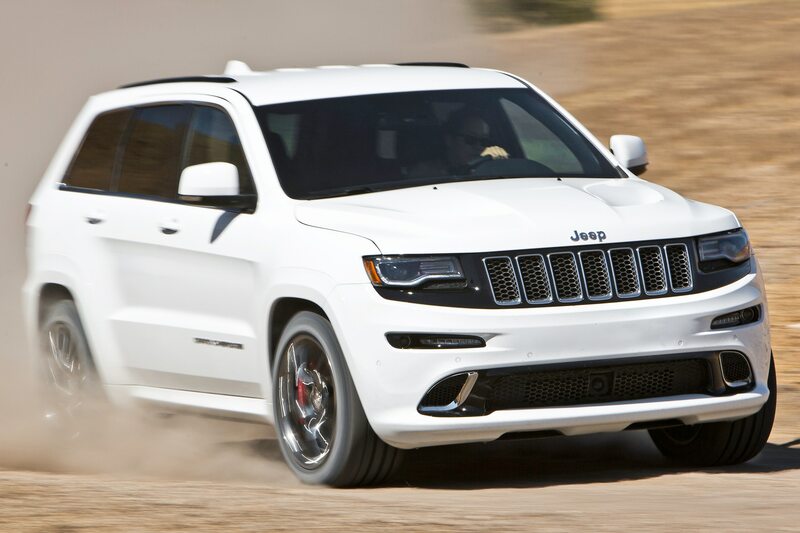 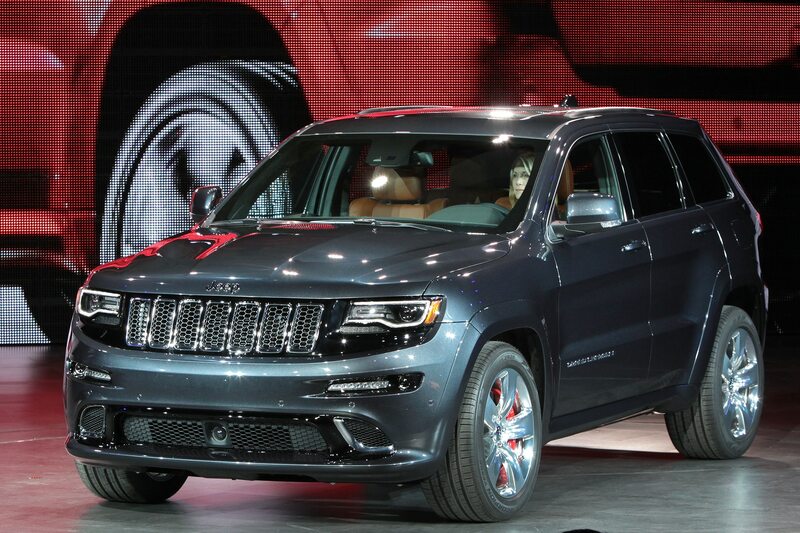 Meanwhile, over on the Jeep ant farm’s venomous side, the 2014 Grand Cherokee SRT goes on sale in April. 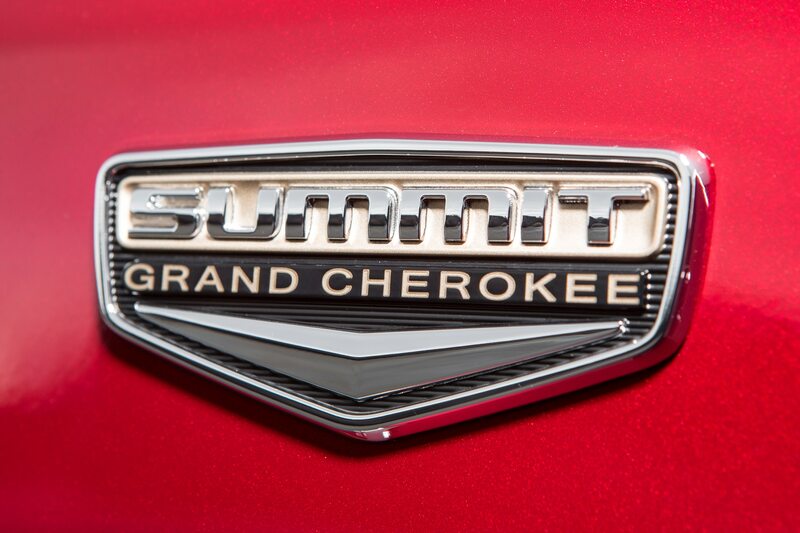 For the first time, its arrival coincides with the refreshed model’s launch. 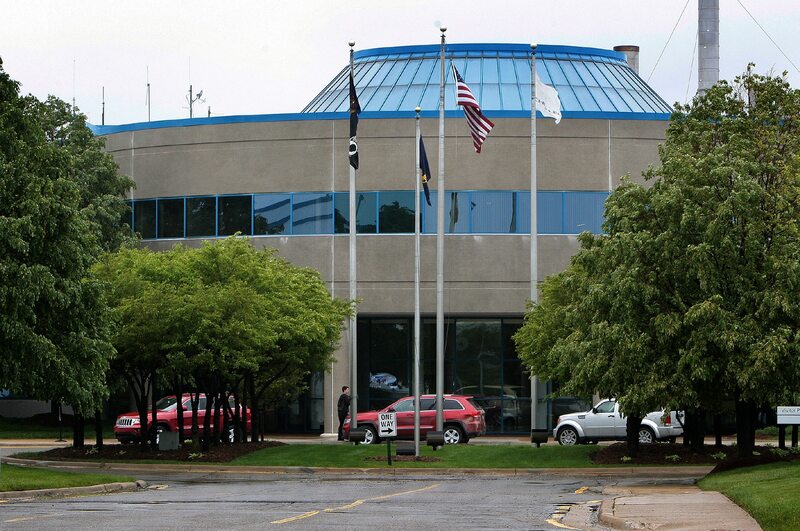 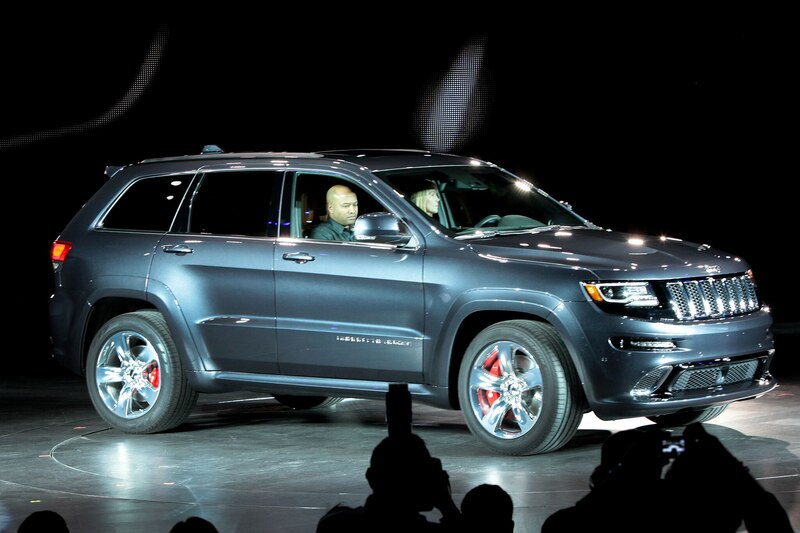 “As times progress and we become our own brand, it joins the base program,” said SRT brand chief Ralph Gilles. 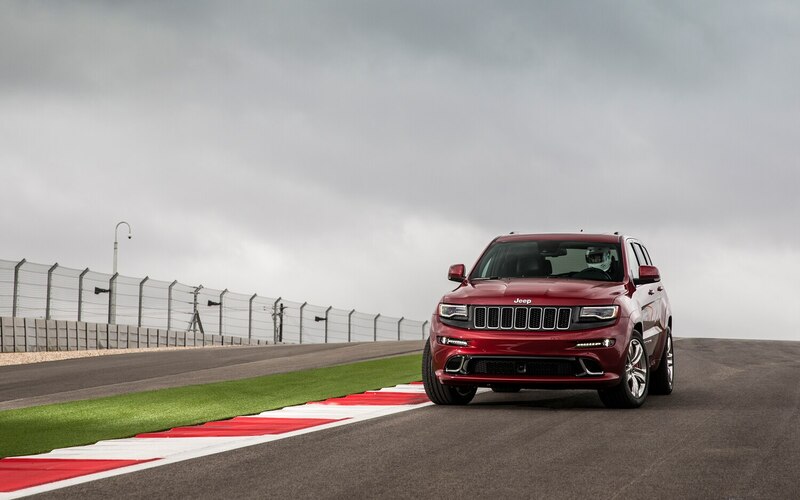 Engorged with the 6.4-liter V-8 rated at 470 hp and 465 lb-ft, the SRT, which shares the other models’ eight-speed transmission, is “so delicious and so awesome” that you’ll want to use the new shift paddles, Gilles correctly predicted. 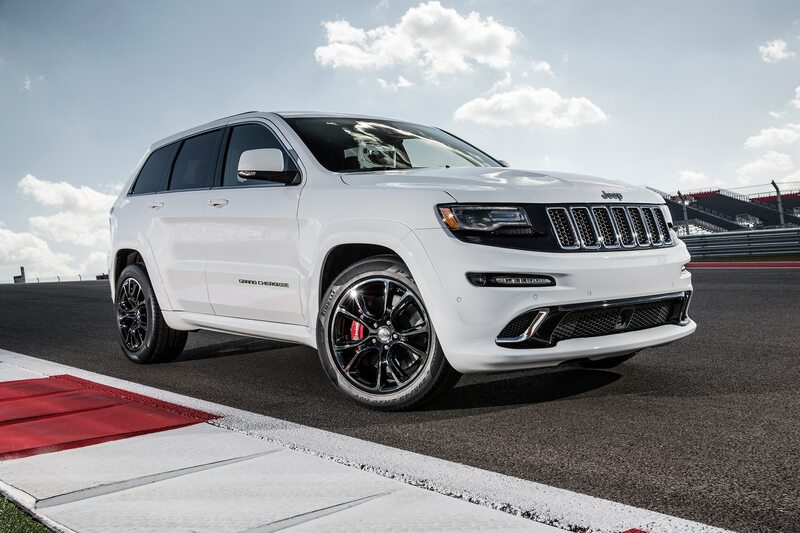 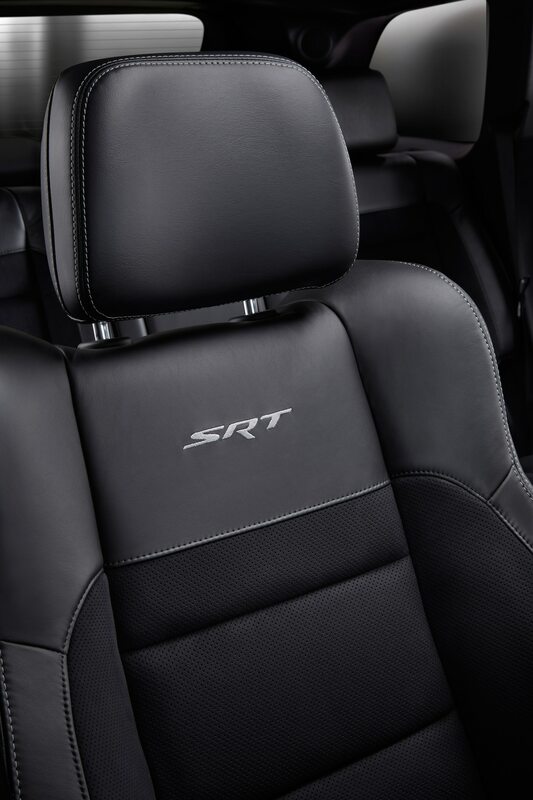 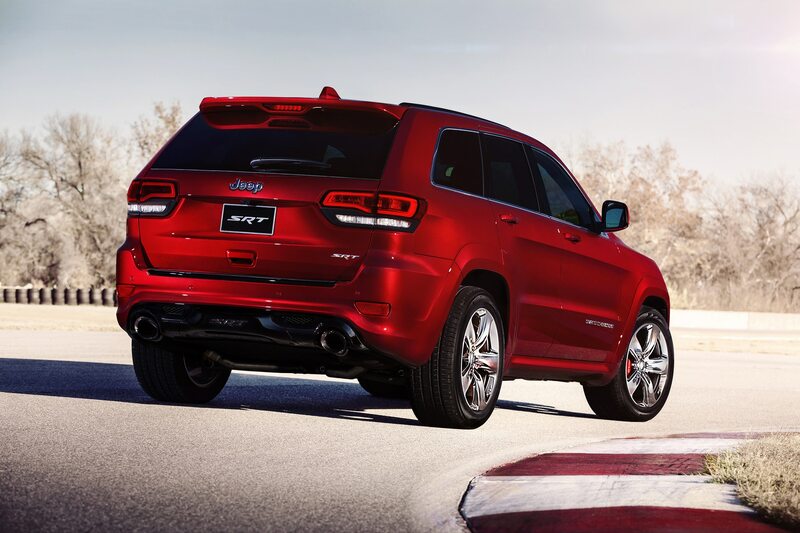 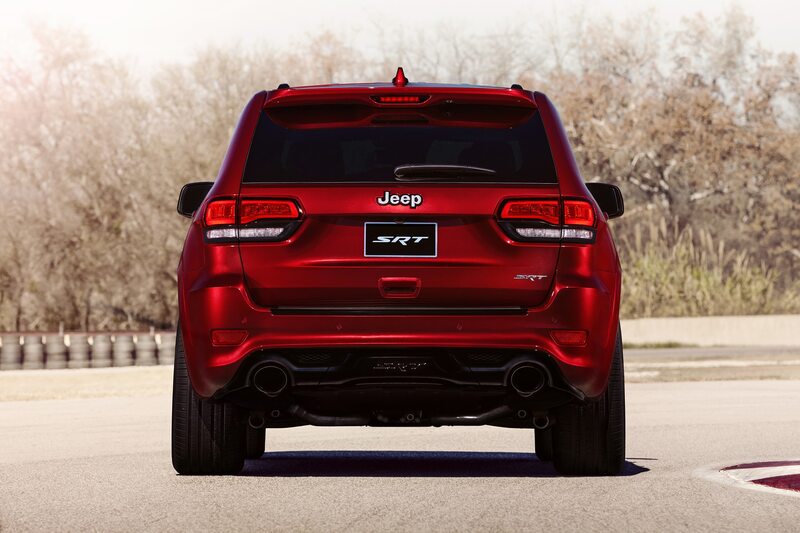 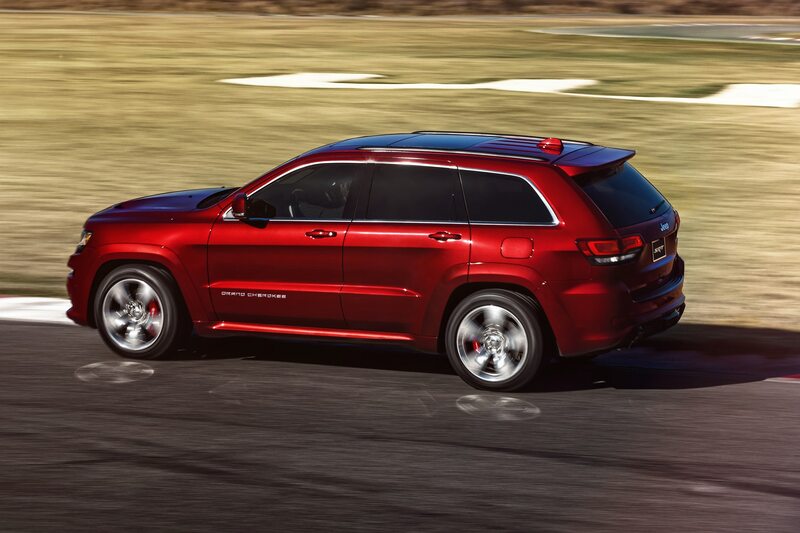 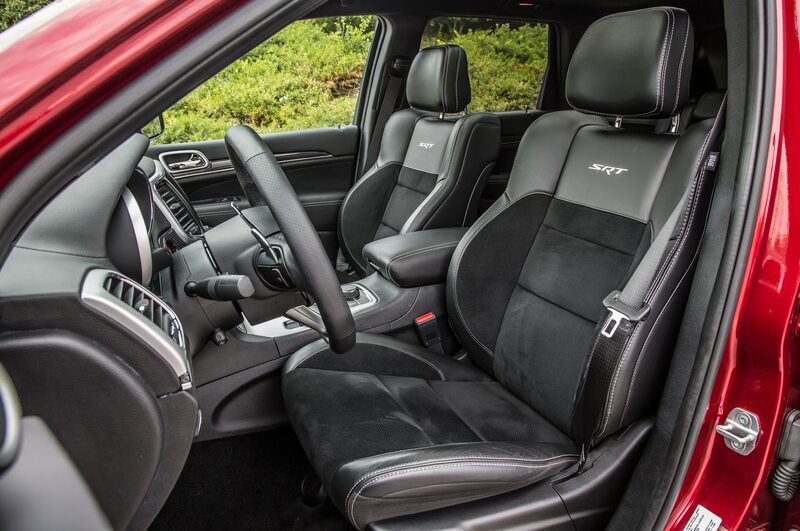 Even with an extra gear change along the way, the SRT does 0 to 60 mph in 4.8 seconds. 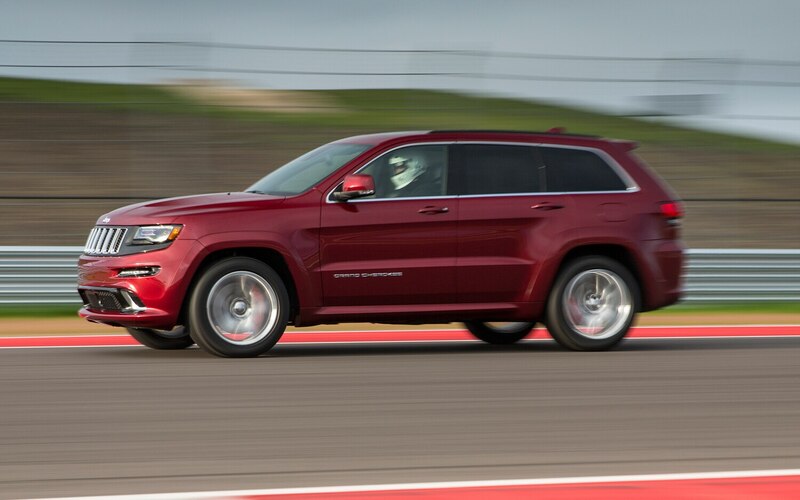 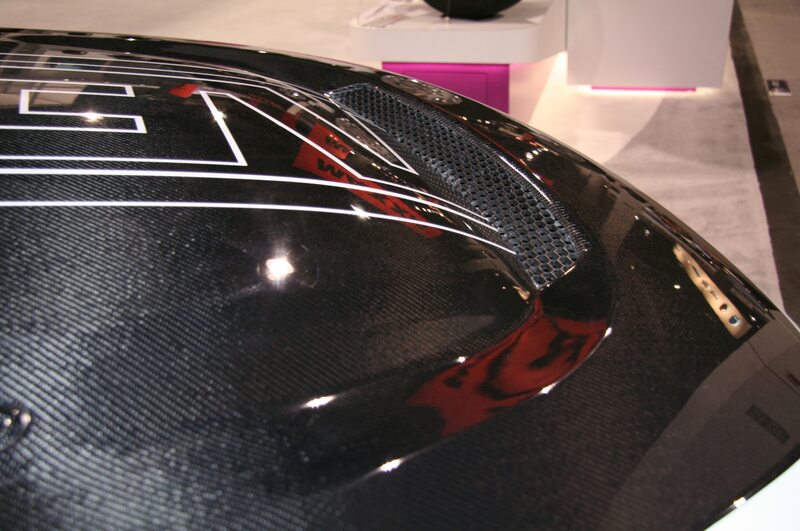 Then it tops out at 160 mph. 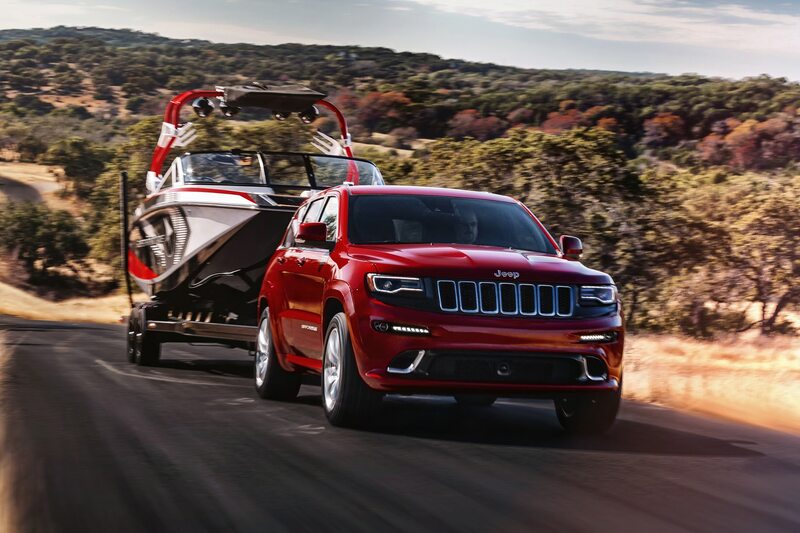 Yet towing capacity increases to 7200 pounds. 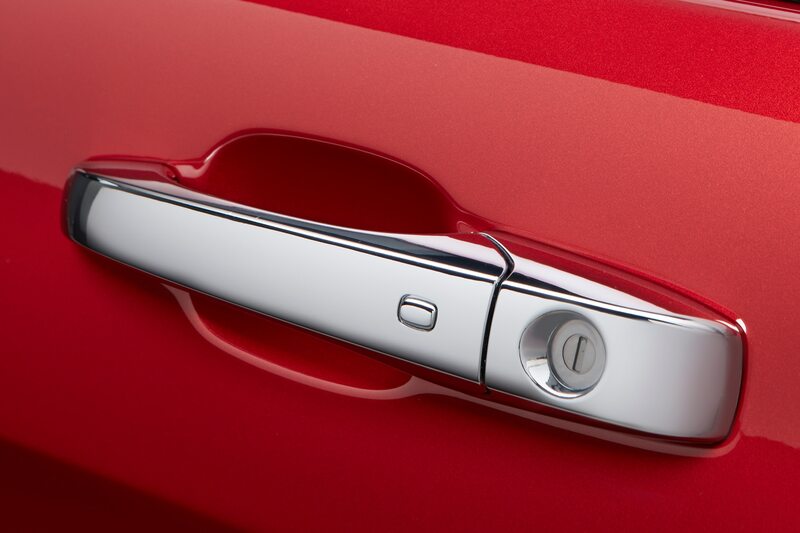 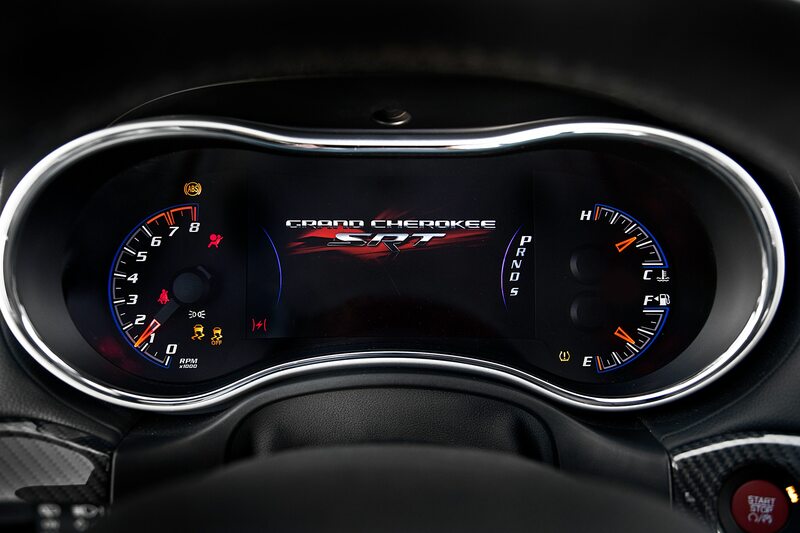 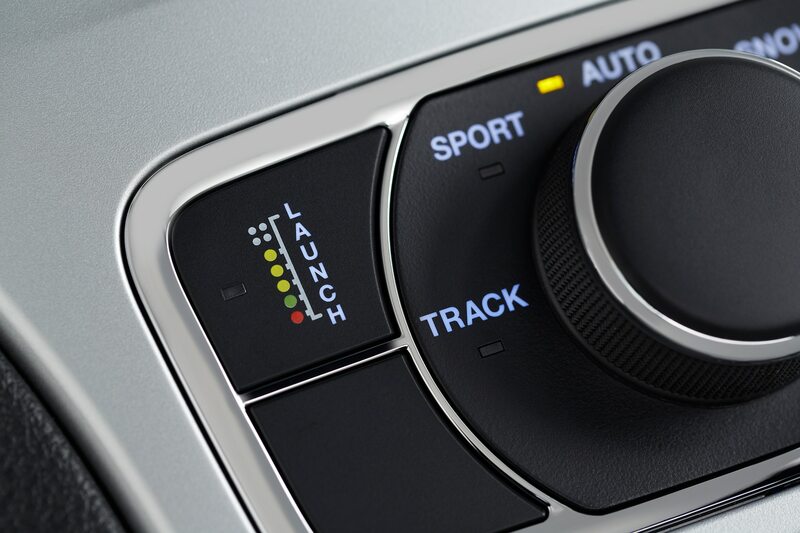 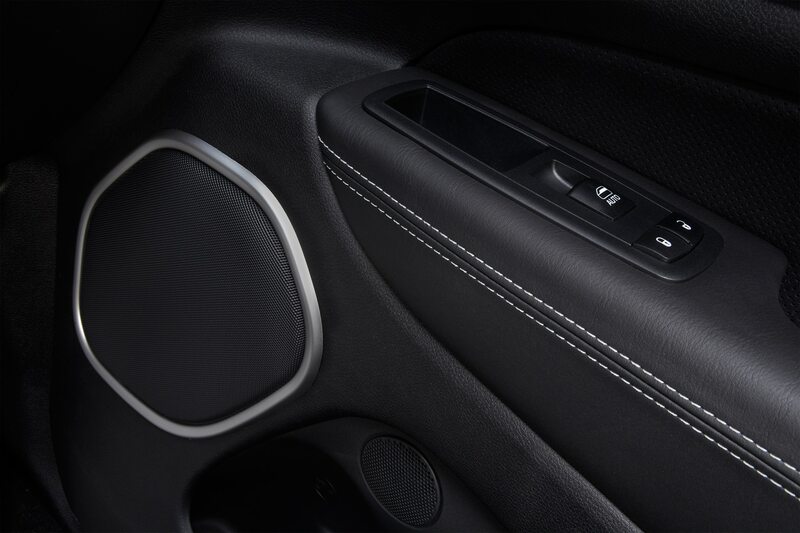 One new feature is the SRT’s launch button. 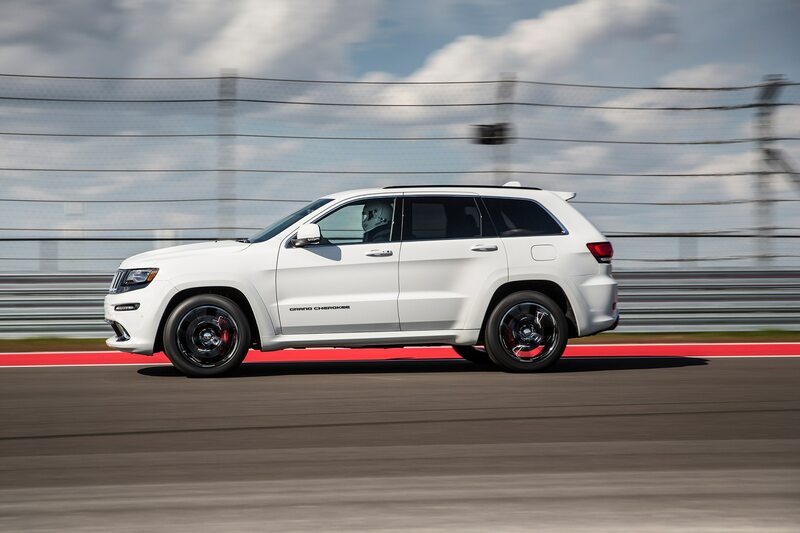 To reach the low-13-second range in the quarter mile, you can stage the vehicle, advancing the V-8’s camshaft to set its jaws fully open. 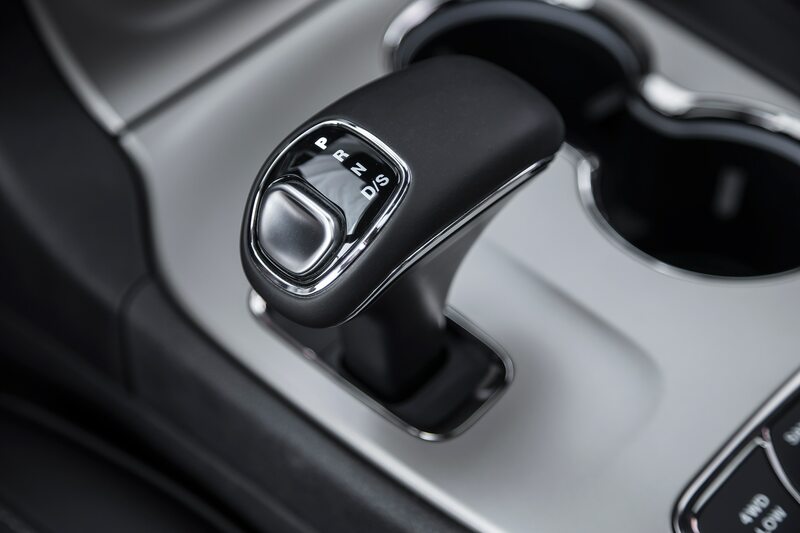 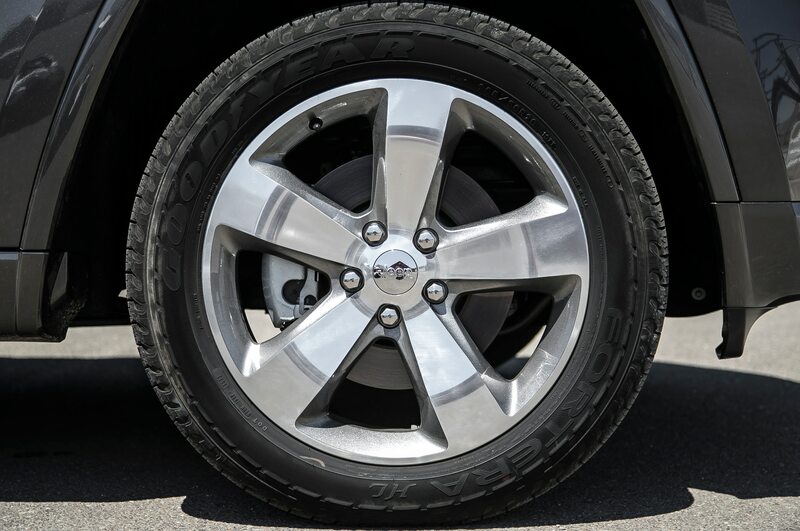 A max-shift program takes over and torque is directed mostly rearward, with the suspension set at full-firm to avoid energy loss from front or rear lifting. 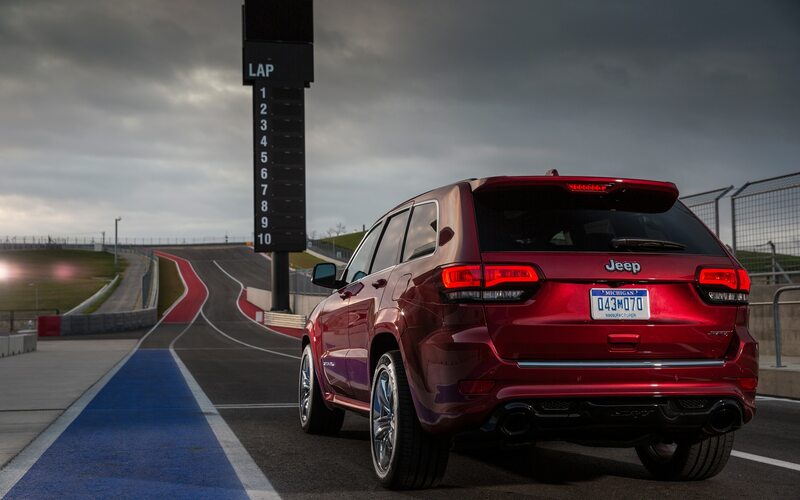 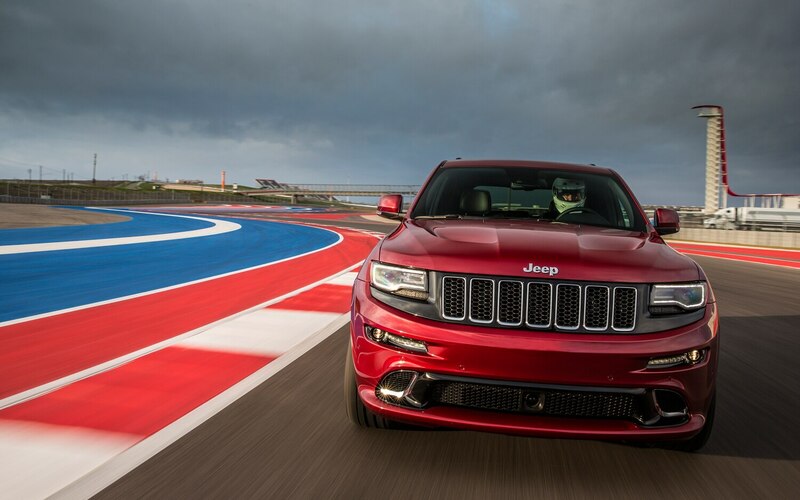 The SRT’s selectable driving modes include a track setting, which Jeep kindly arranged for us to sample at length on the Circuit of the Americas. 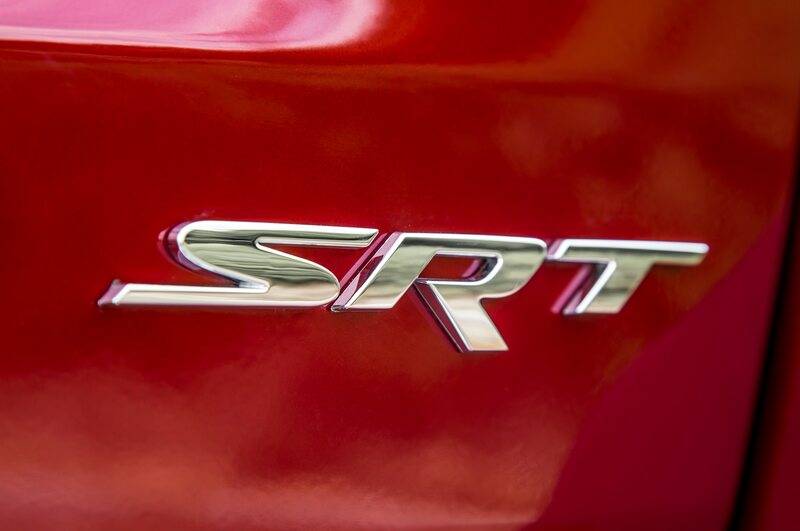 The SRT went roaring around this splendid new 3.4-mile, 20-turn circuit with impressive bellicosity. 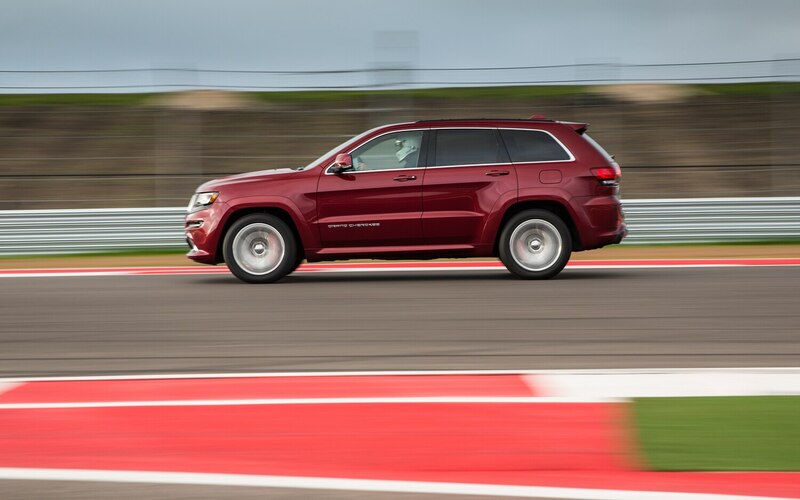 We found ourselves exiting Turn 11, a hairpin, and surpassing 120 mph on the one-kilometer-long backstretch without even thinking of wind noise but gratefully aware of the cooled sport seats with suede inserts. 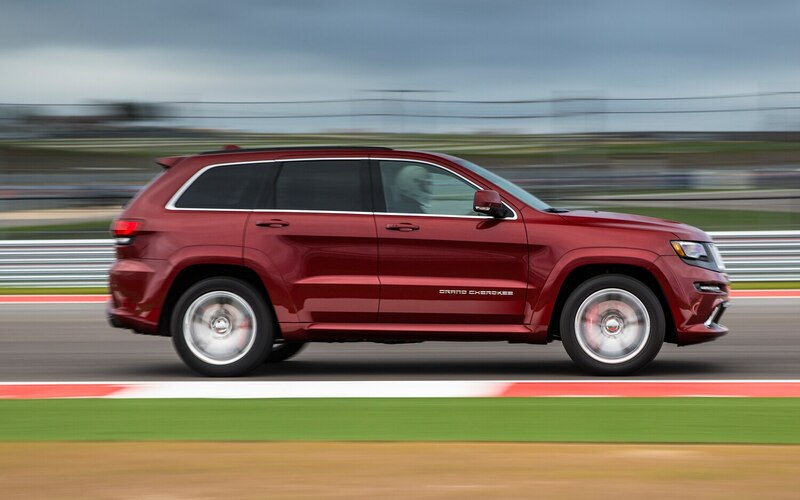 Nestled behind its unique 20-inch wheels, six-piston-caliper front and four-piston rear brakes slowed this jumbo for Turn 12, an obtuse lefthander that introduces a very technical part of the track. 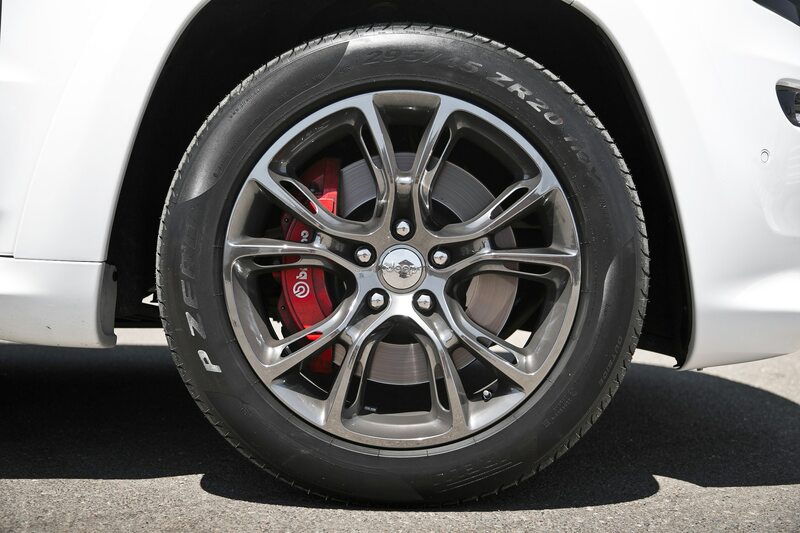 Thanks to perfectly weighted, precise, and communicative steering (the SRT has a smaller pinion gear than the other models), we knew exactly when the huge Pirellis would break loose. 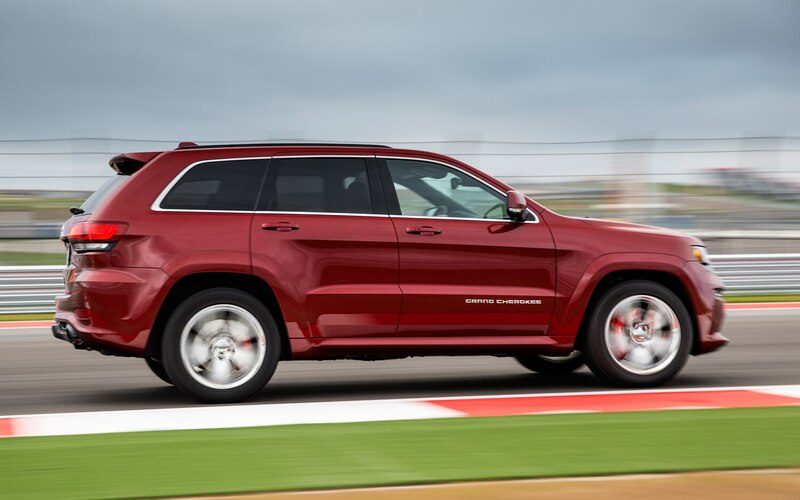 The chassis and suspension are so well developed, with just a touch of body roll at the limit, that the terrific mass of 5,150 pounds was easily placed and managed in turns. 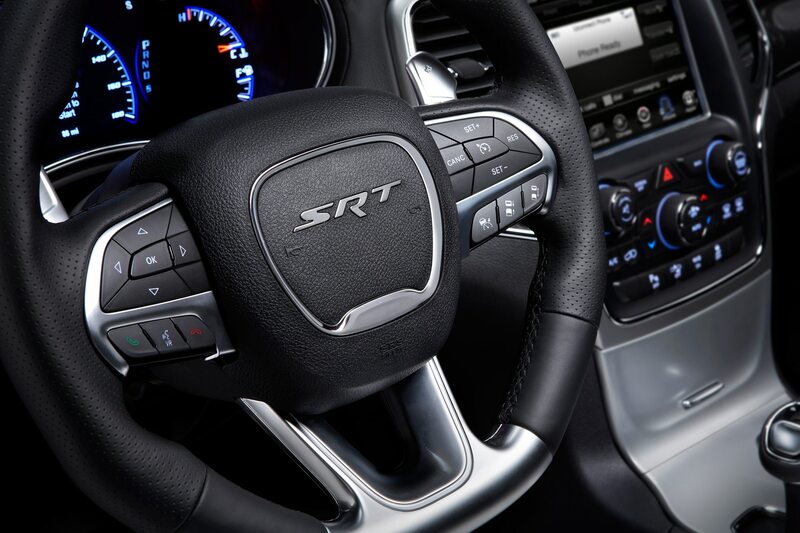 Our only regret lay in forgetting to summon up the performance pages that the 8.4-in touchscreen displays, so our lap times are unknown. 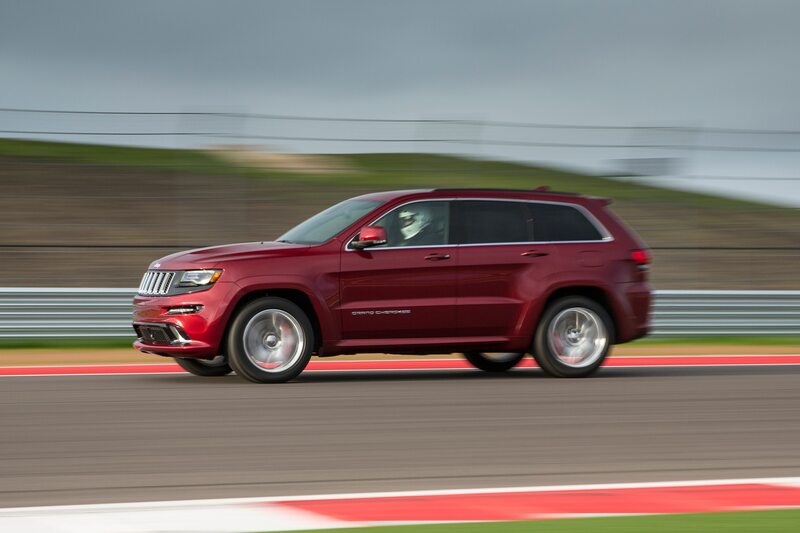 The track record was safe, however. 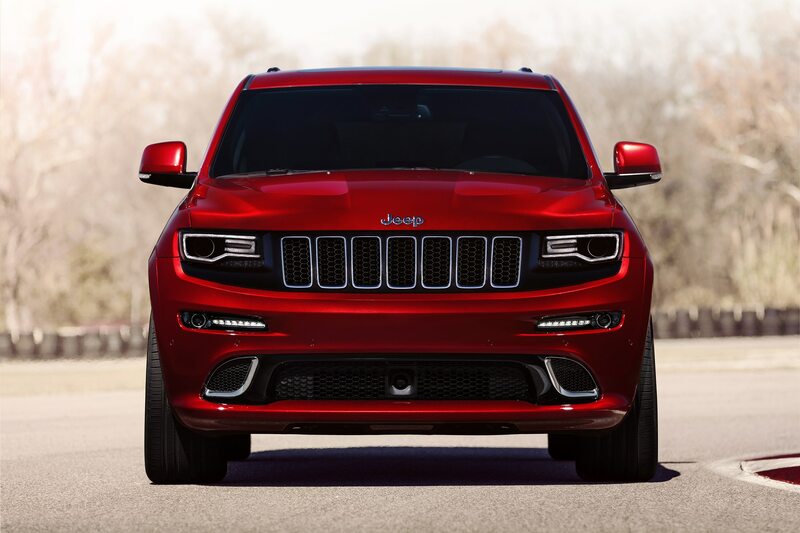 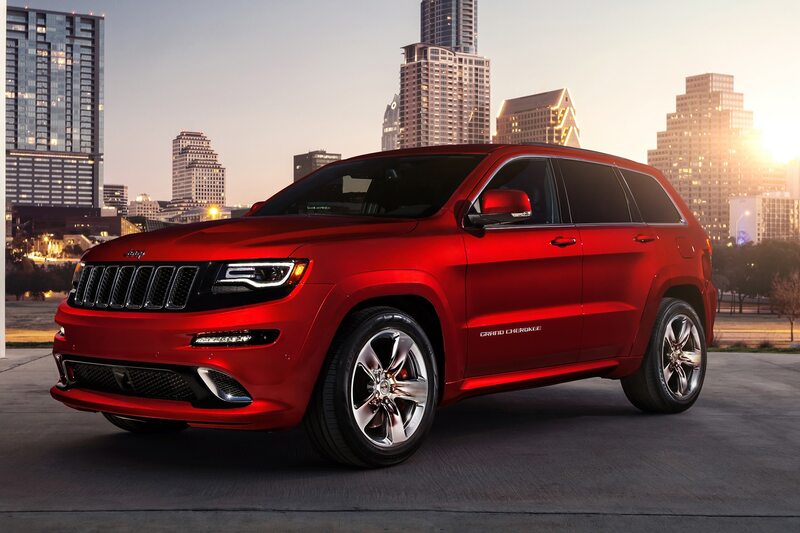 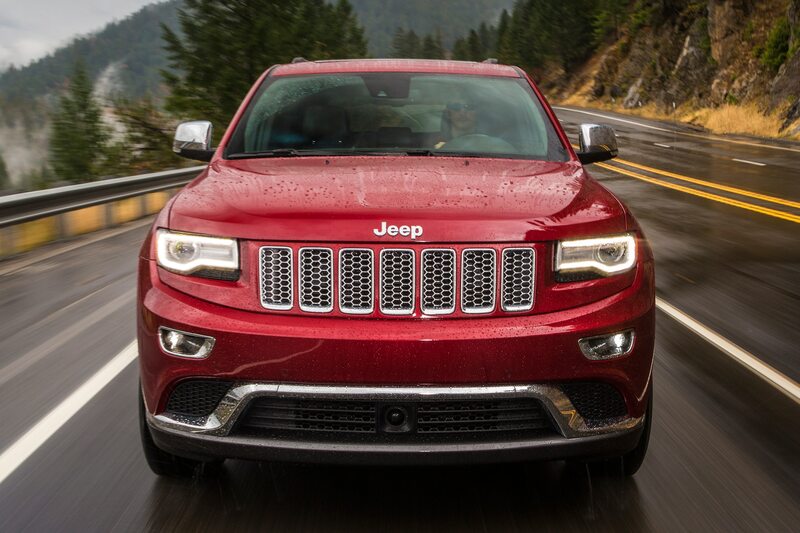 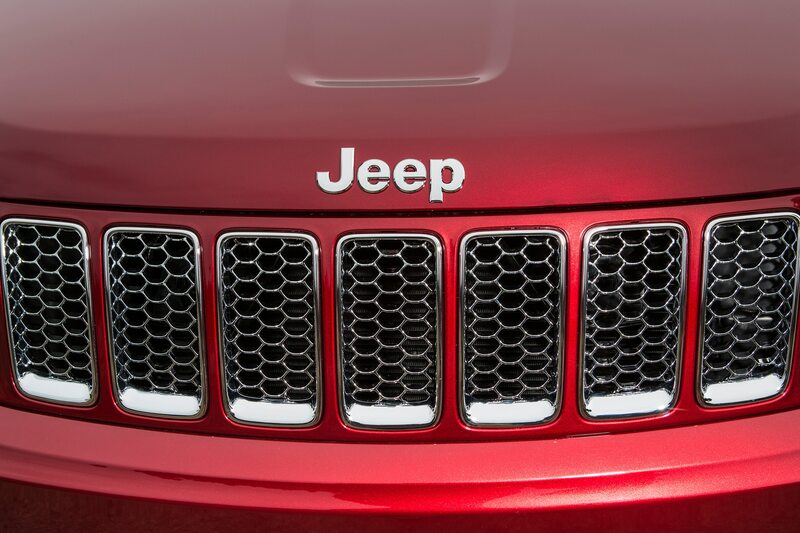 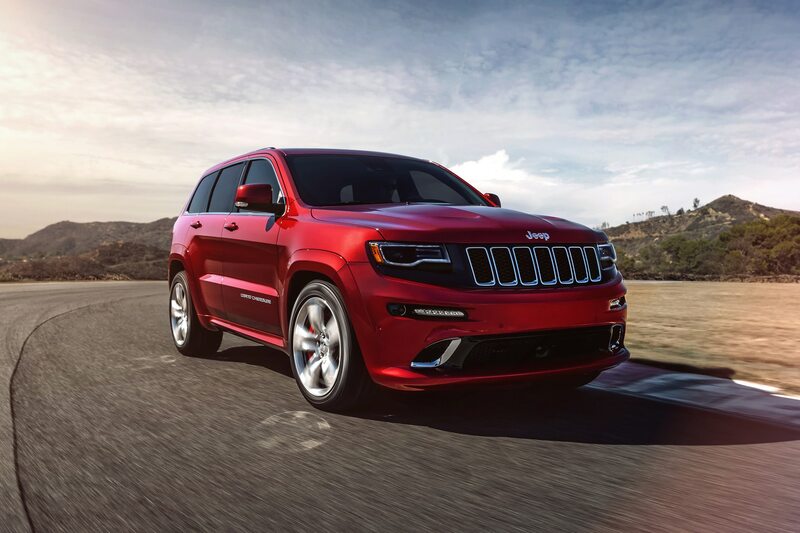 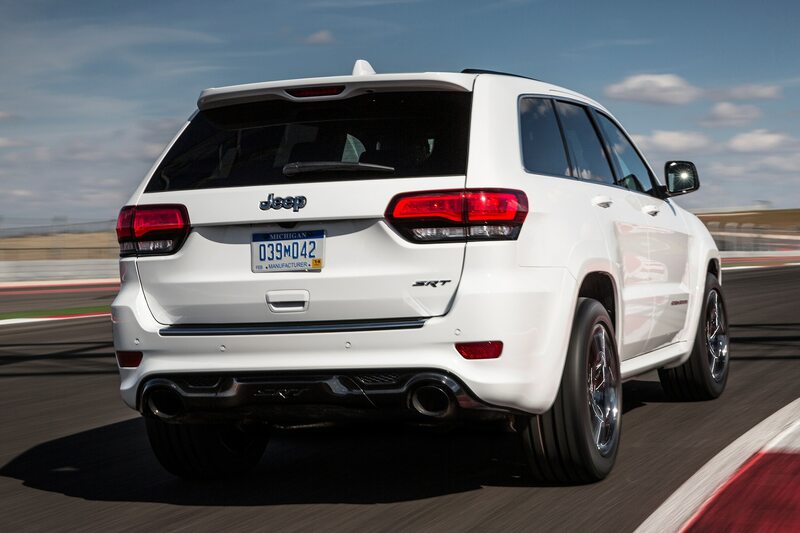 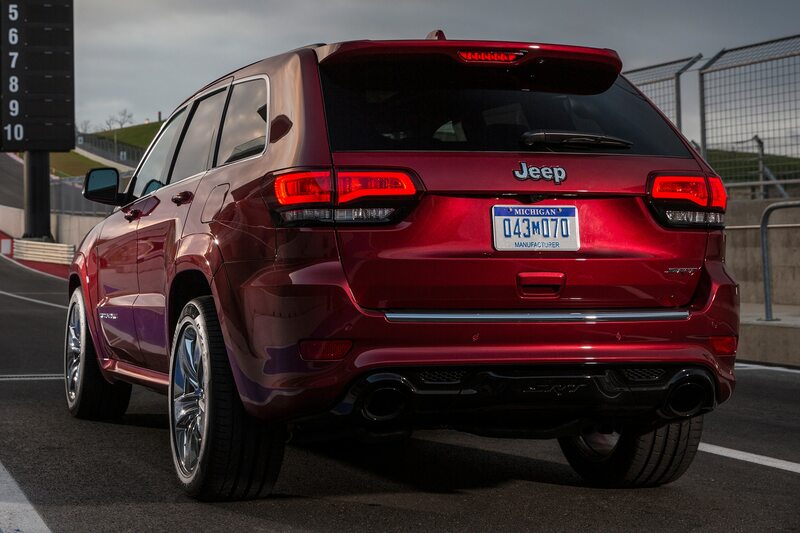 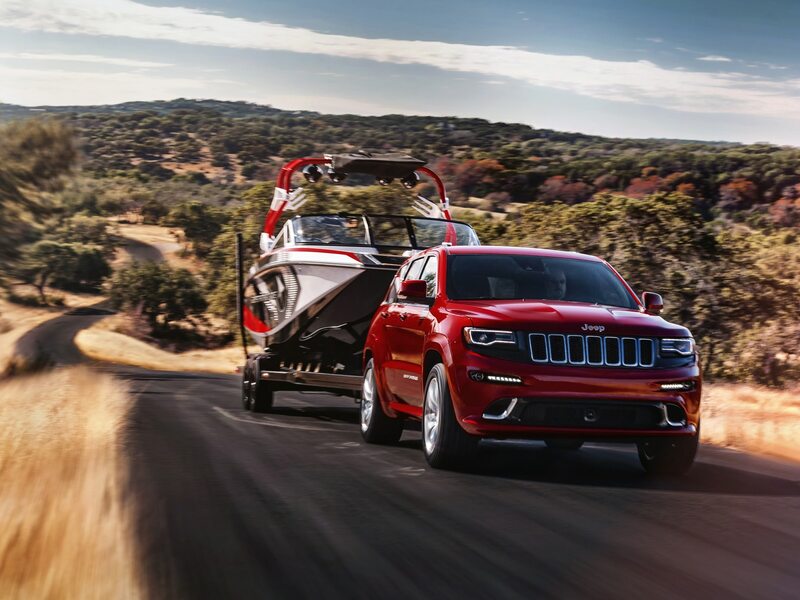 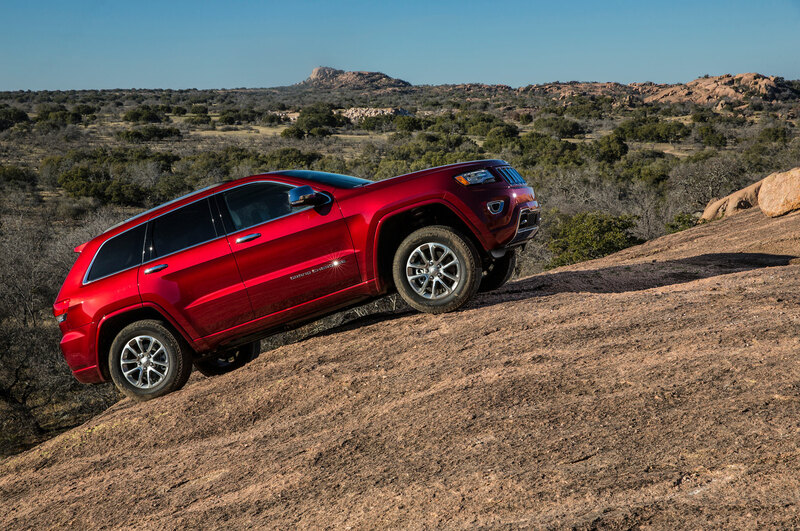 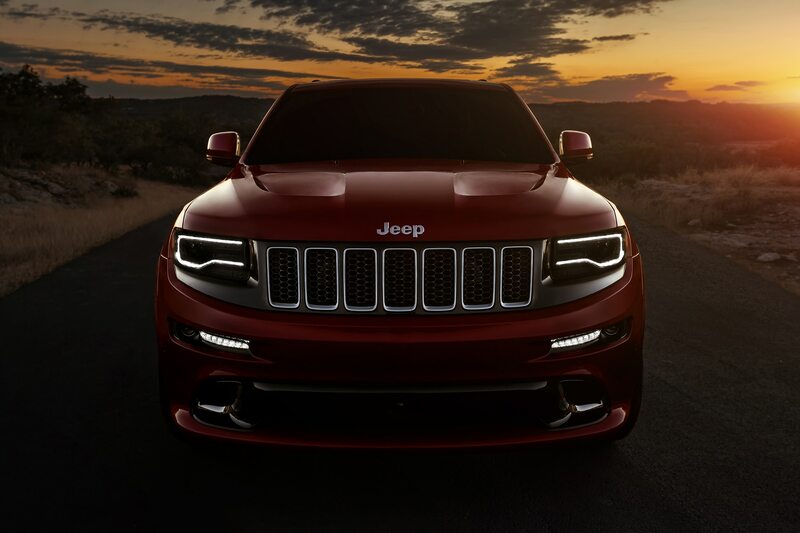 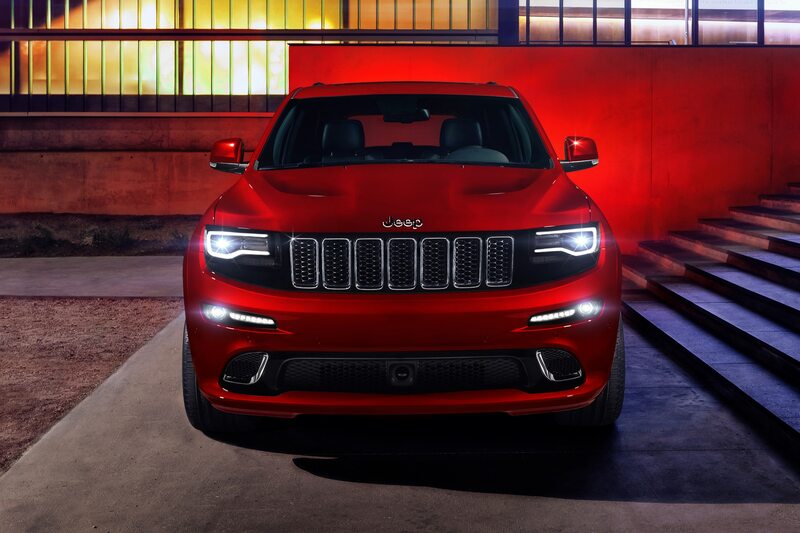 Jeep’s leader, Mike Manley, spoke of continuing to refresh the Grand Cherokee “so it stays relevant in the marketplace.” It would be hard for us to be any more impressed with his team’s effort. 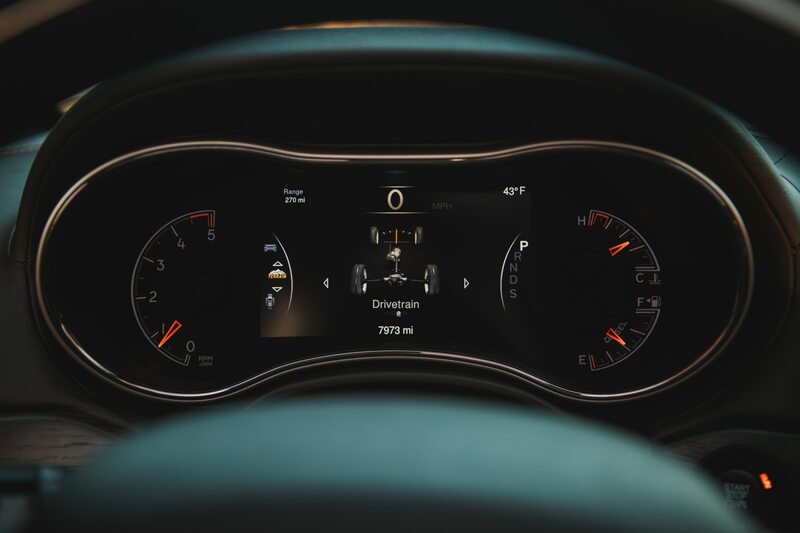 The revised exterior and interior styling is unquestionably improved, the powertrain menu is now complete, and the only safety feature that’s lacking is incoming missile detection. 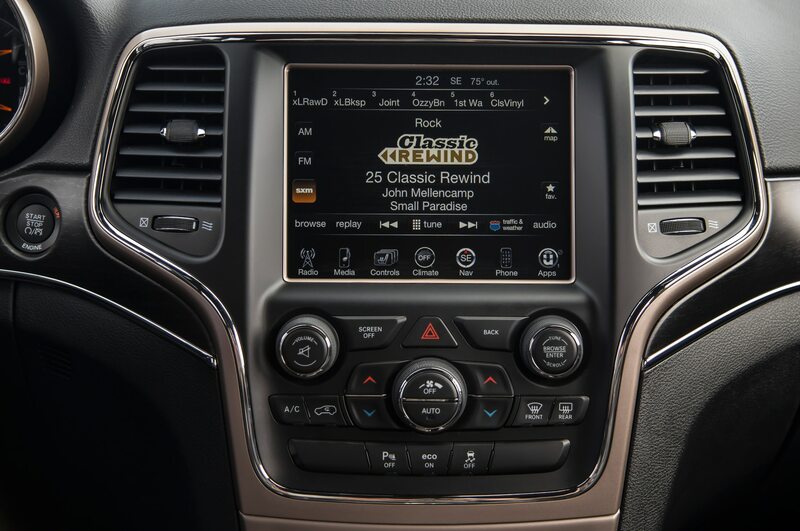 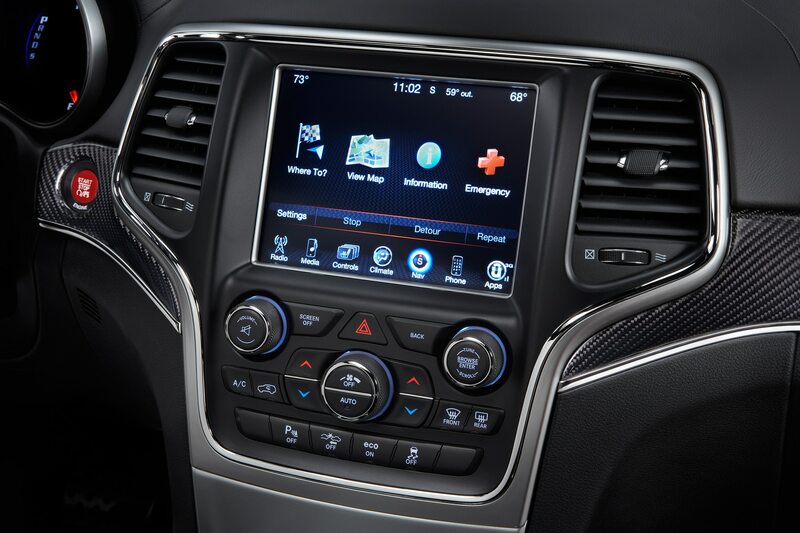 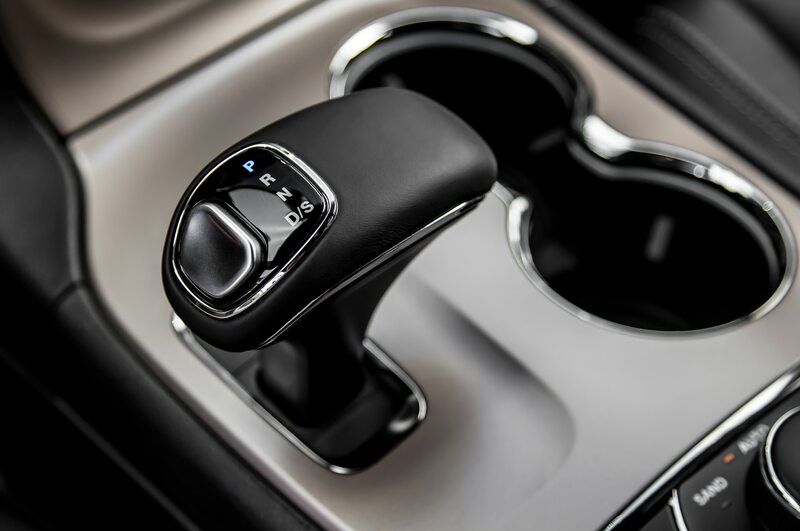 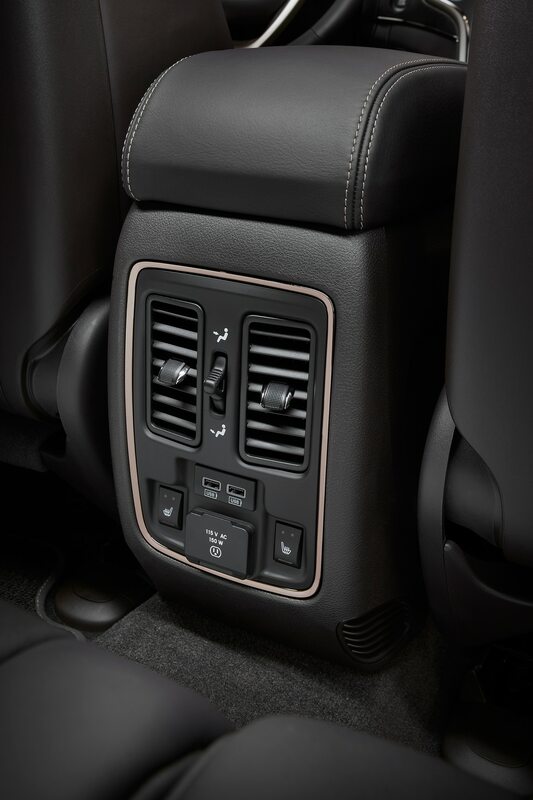 Our main struggle with the Grand Cherokee involved the electronic shifter on the center console. 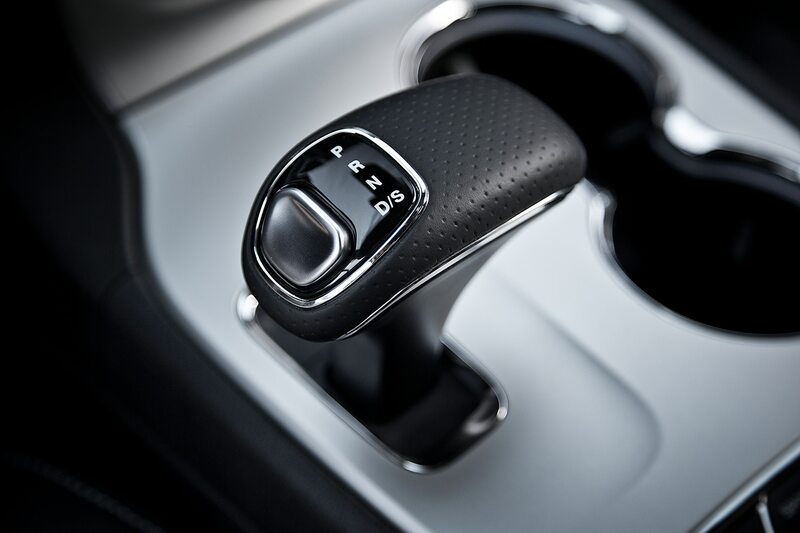 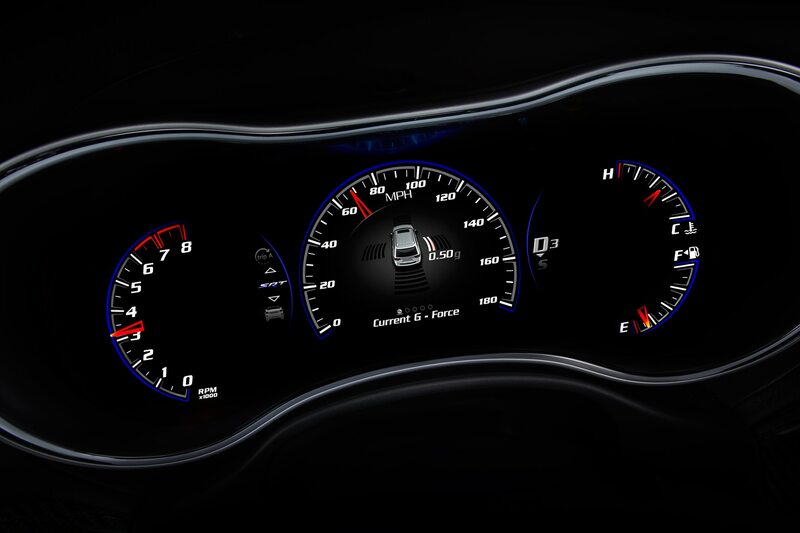 Providing a virtual link to the eight-speed gearbox, it could use more positive detents to indicate the selection. 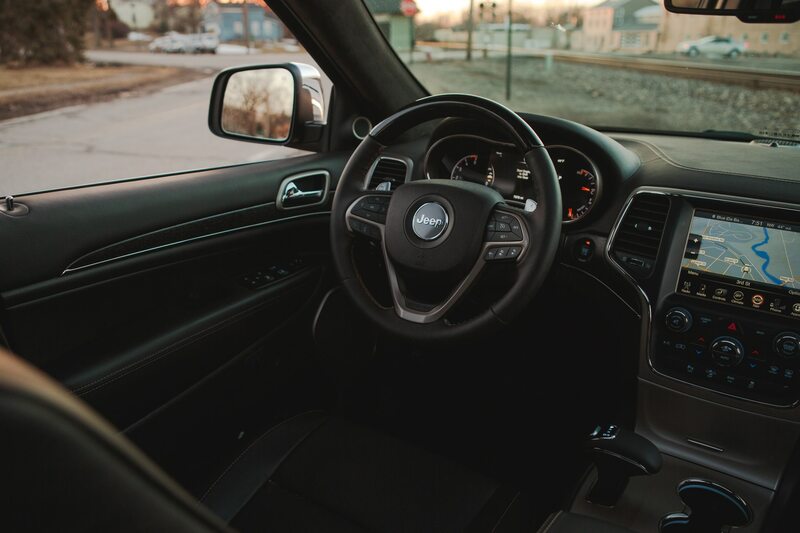 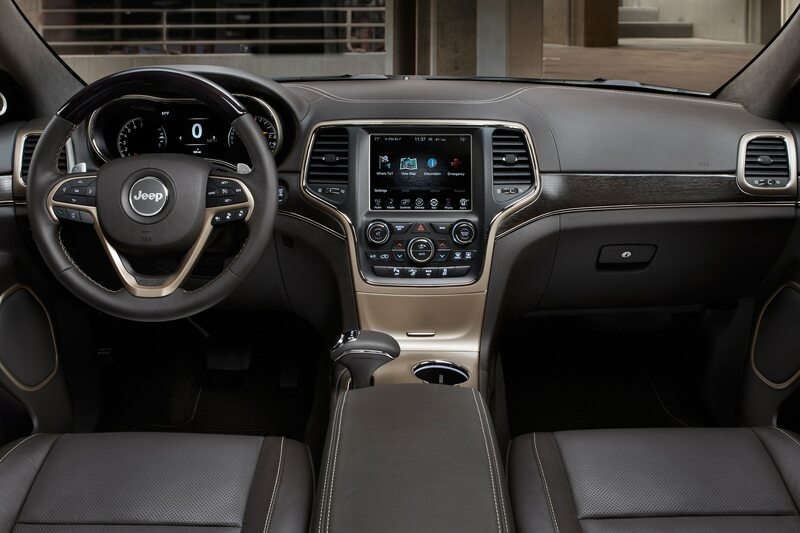 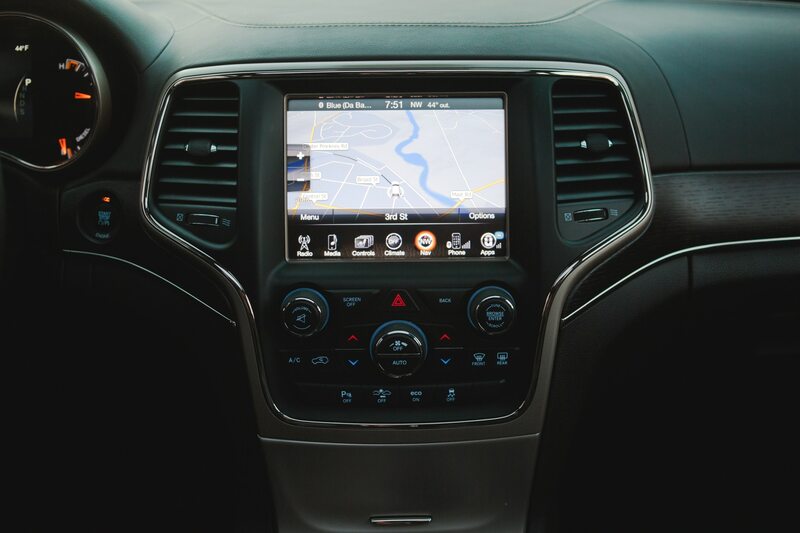 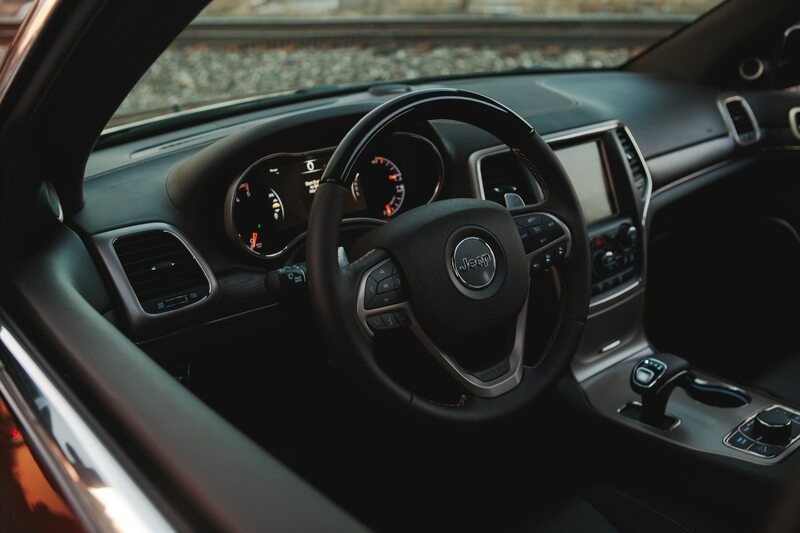 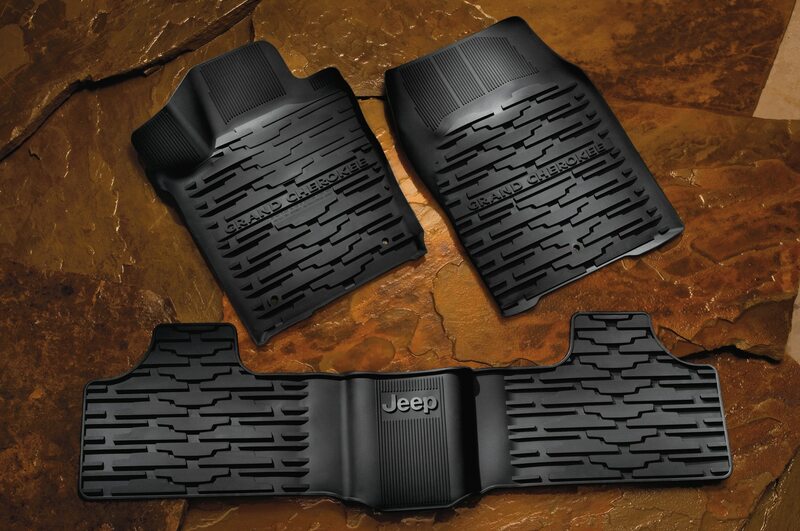 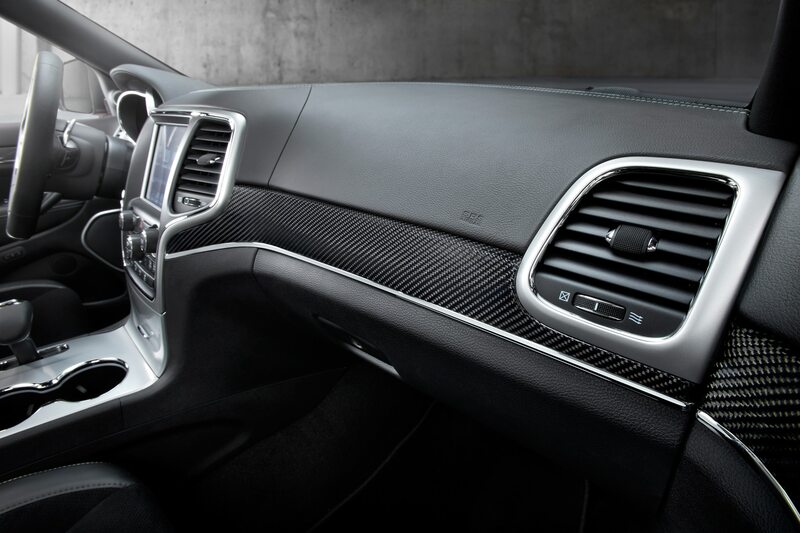 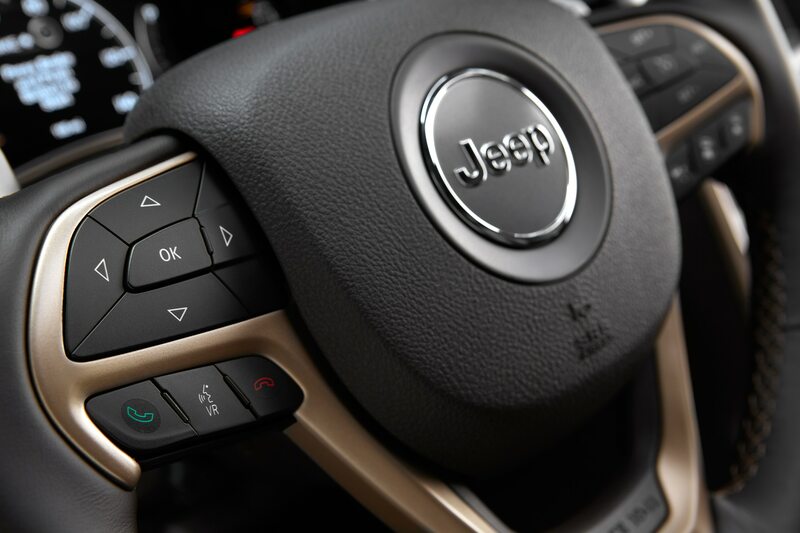 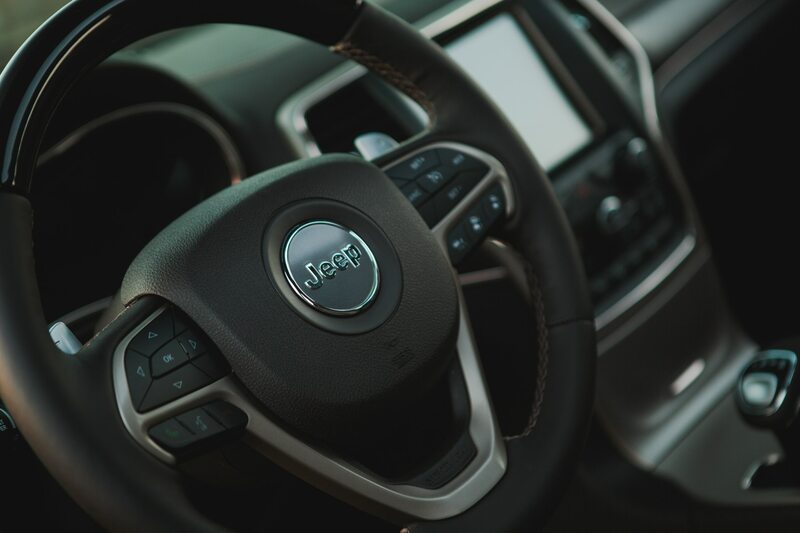 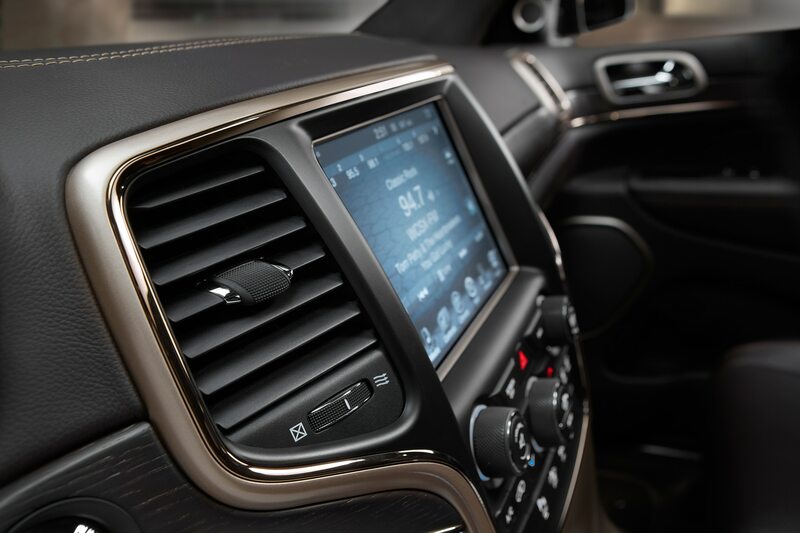 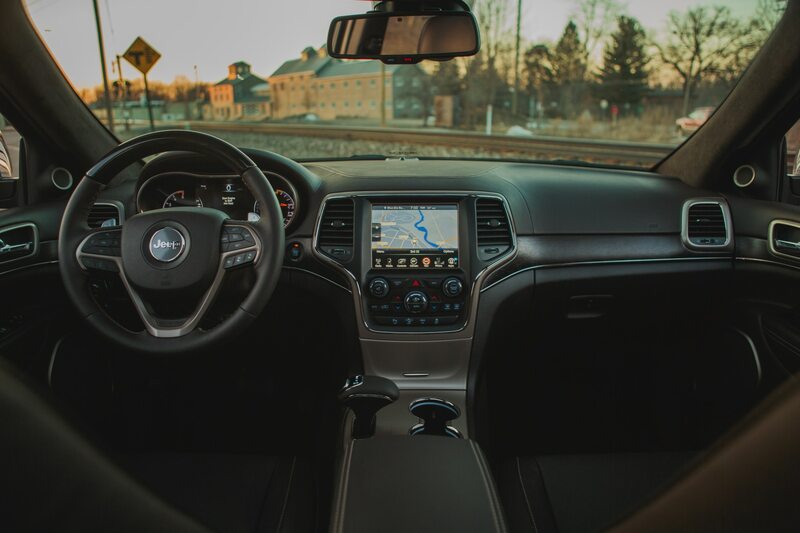 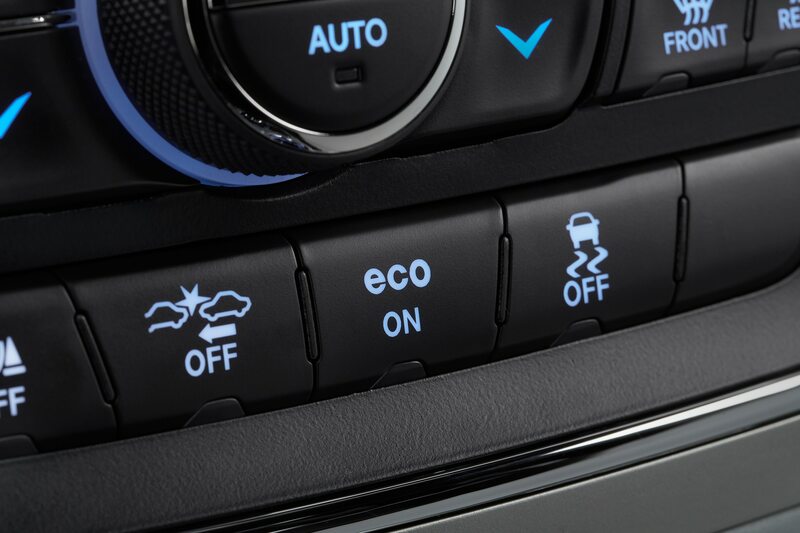 Our driving partner perceived some shortcomings with the UConnect infotainment system, but Jeep’s system is no less quirky or logical than most, only requiring diligent practice before it becomes second nature. 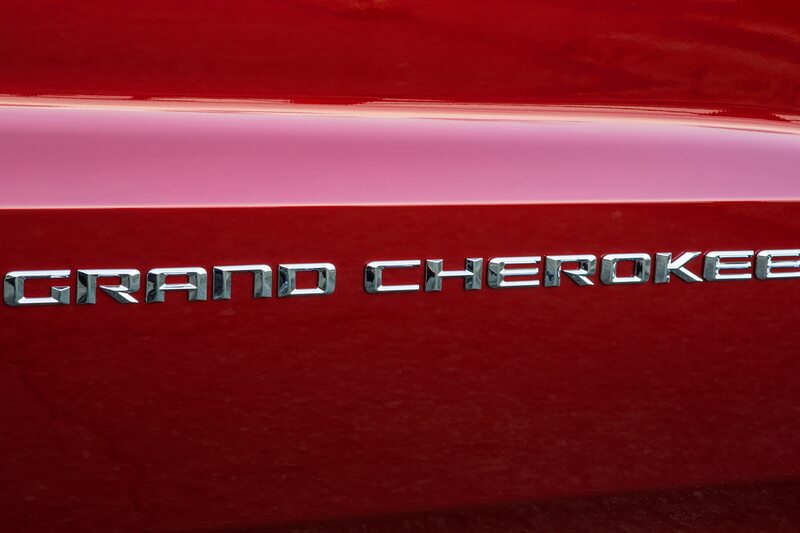 Beyond these trifles, we enjoyed cataloging the division of labor within the family. 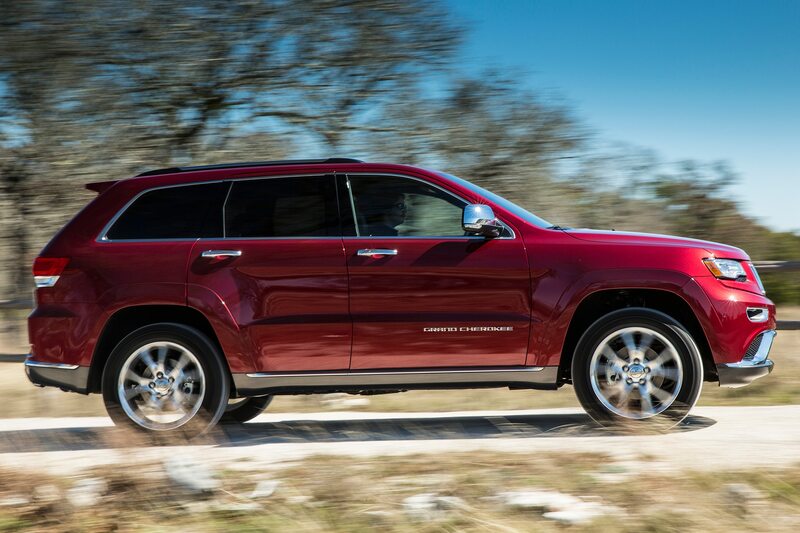 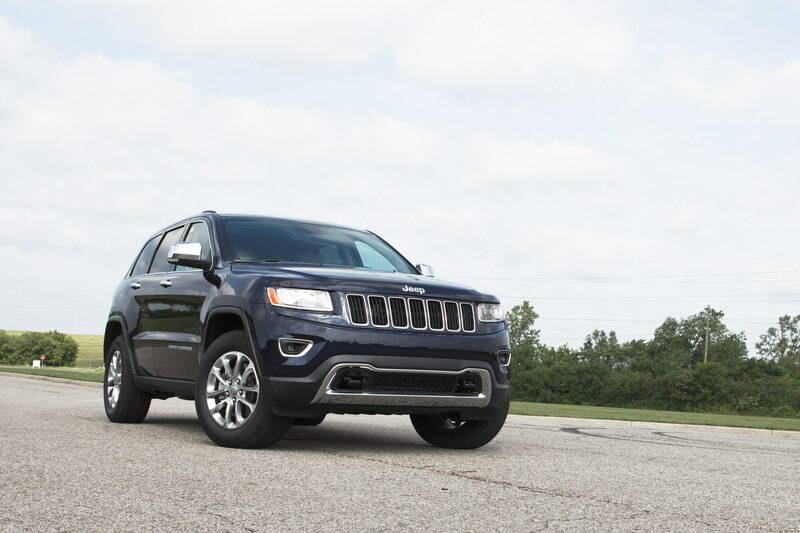 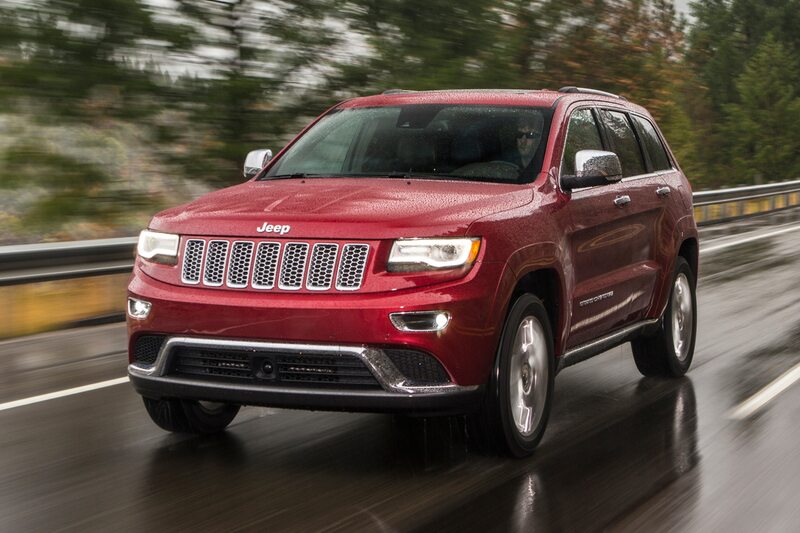 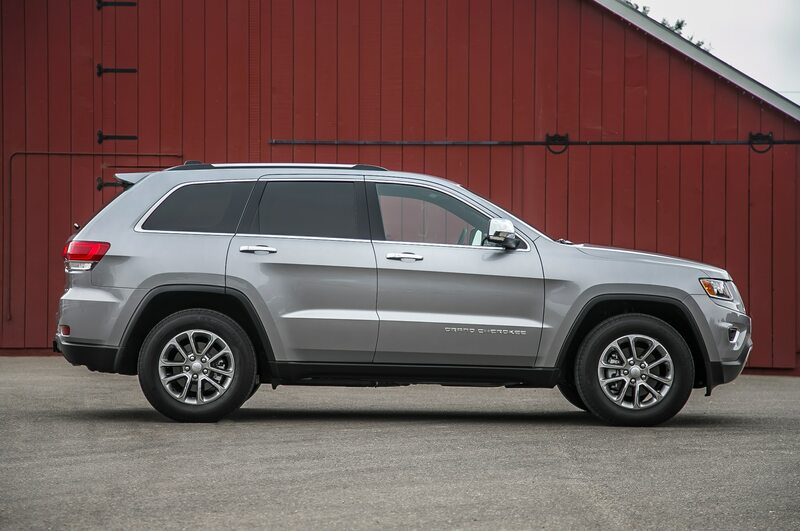 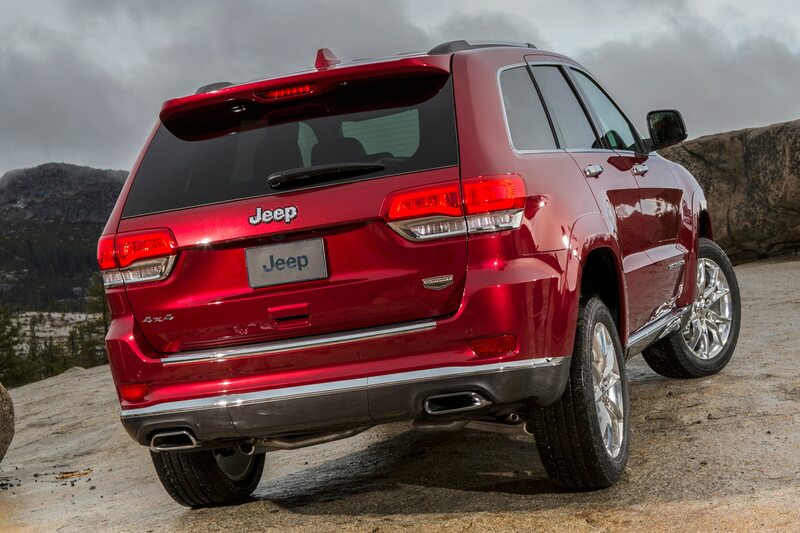 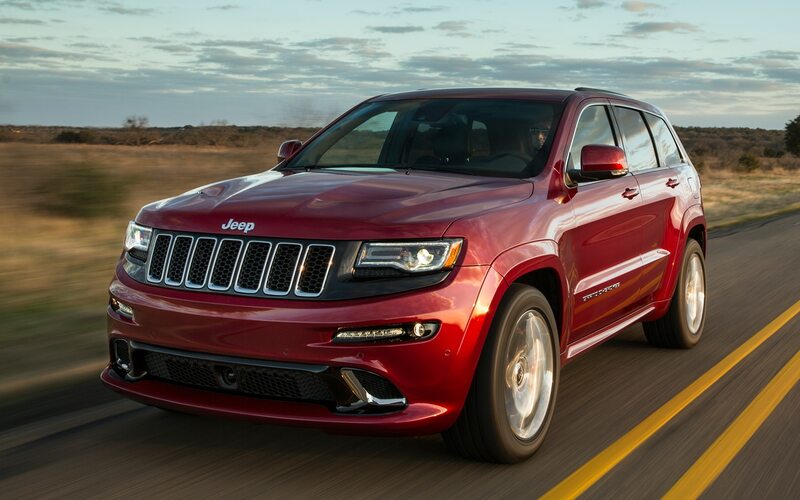 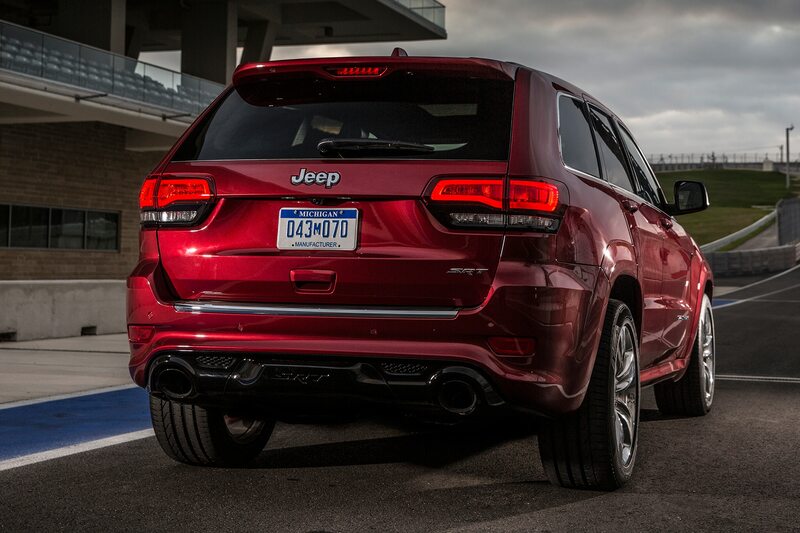 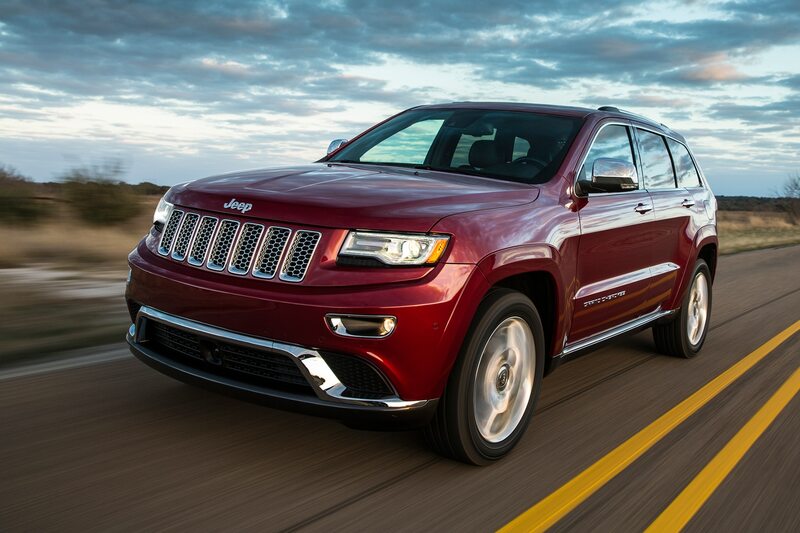 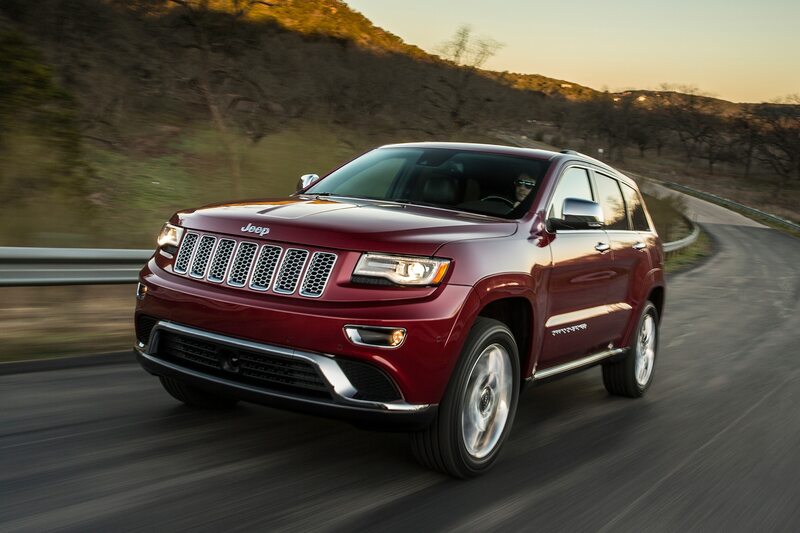 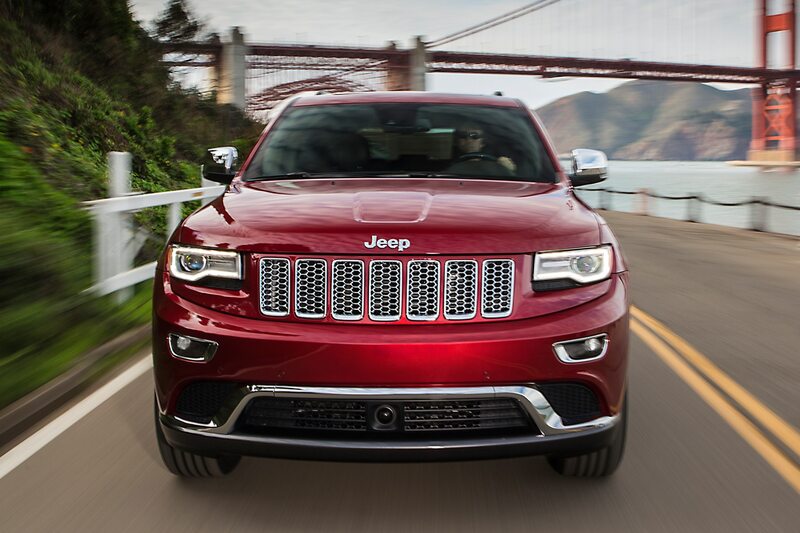 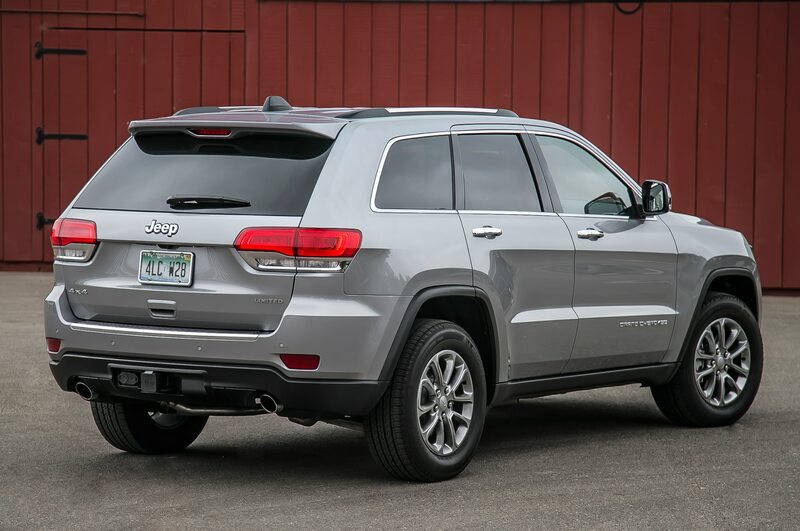 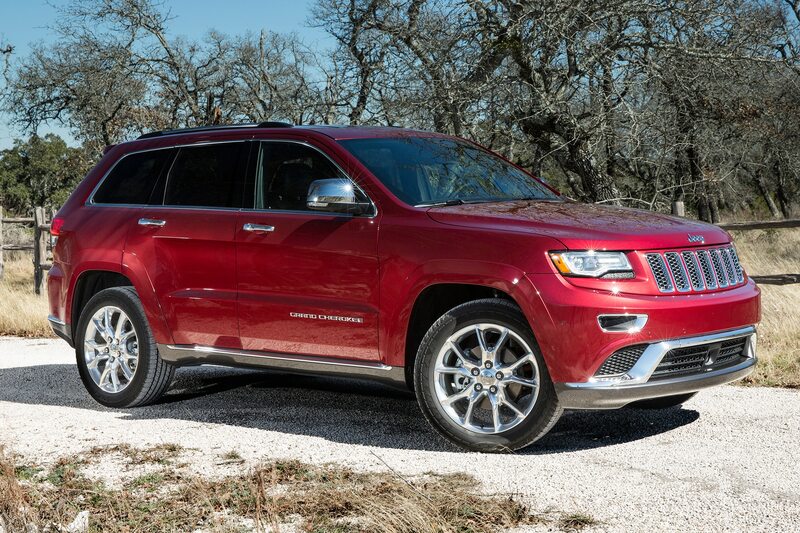 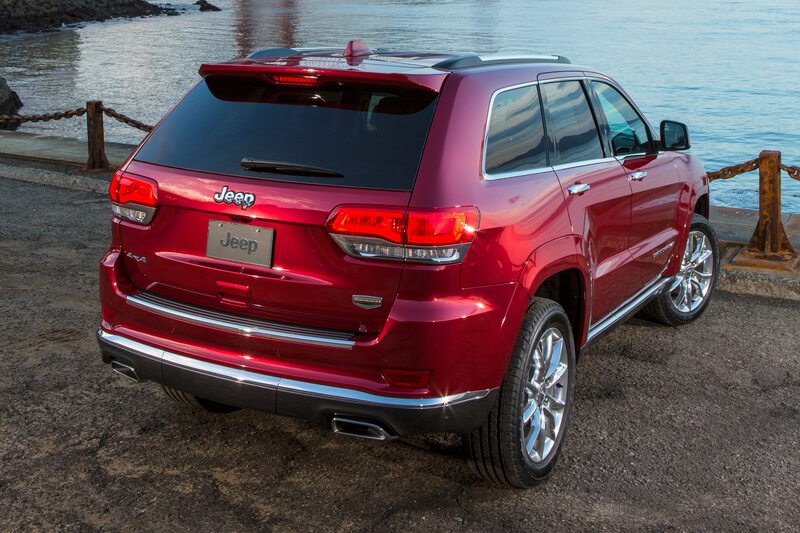 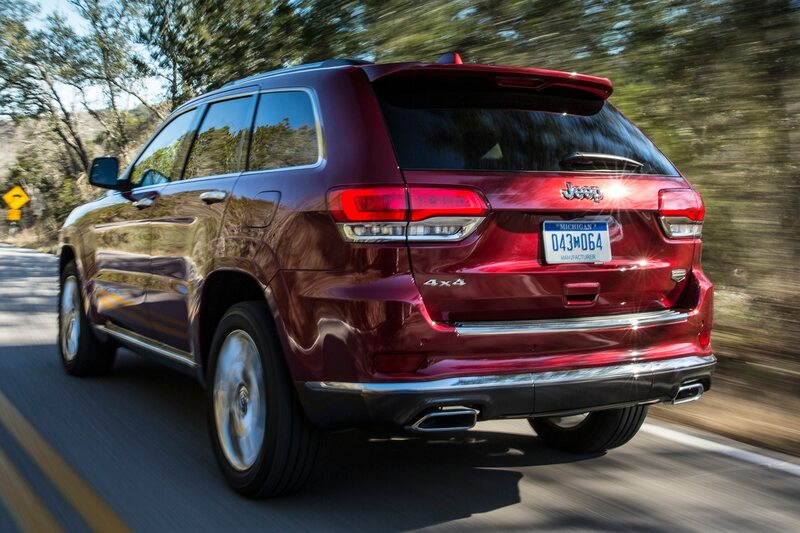 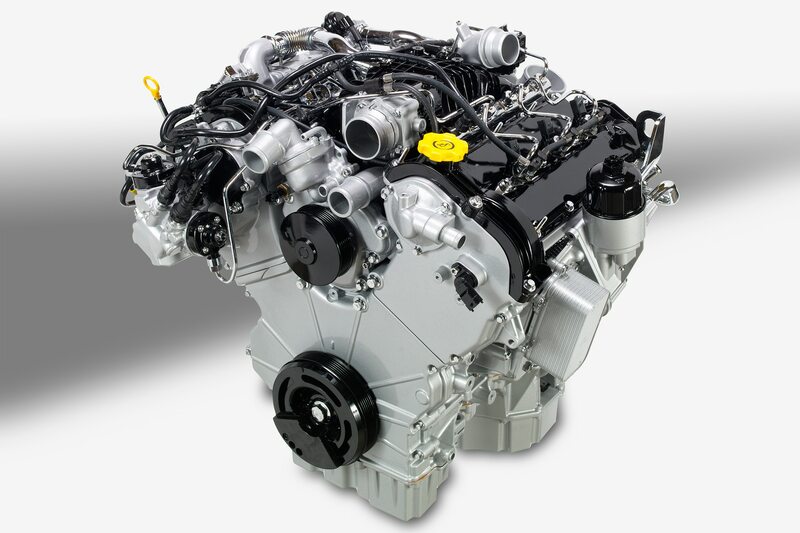 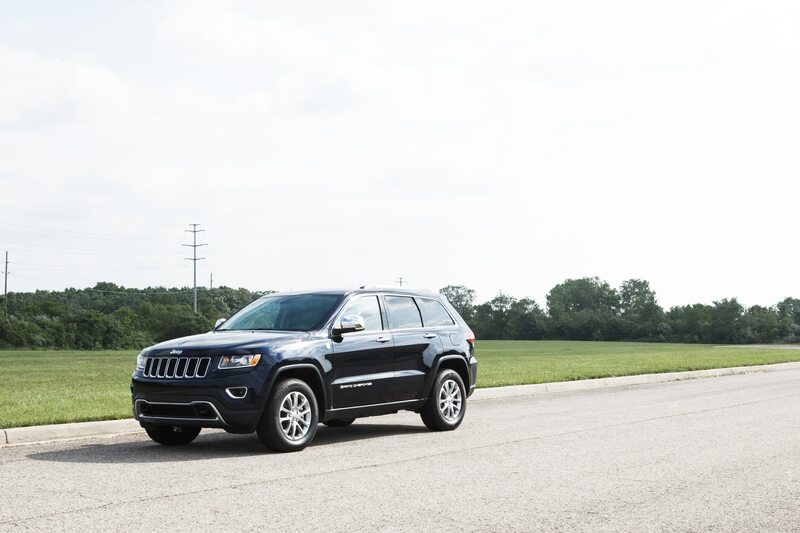 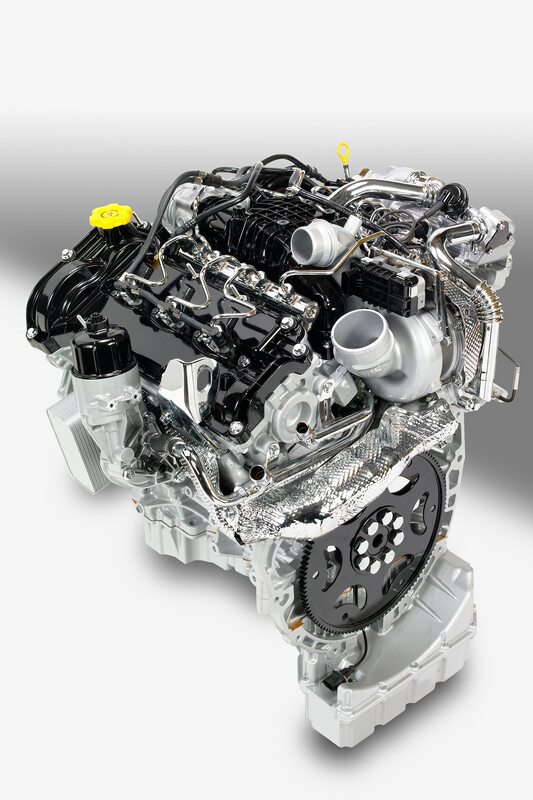 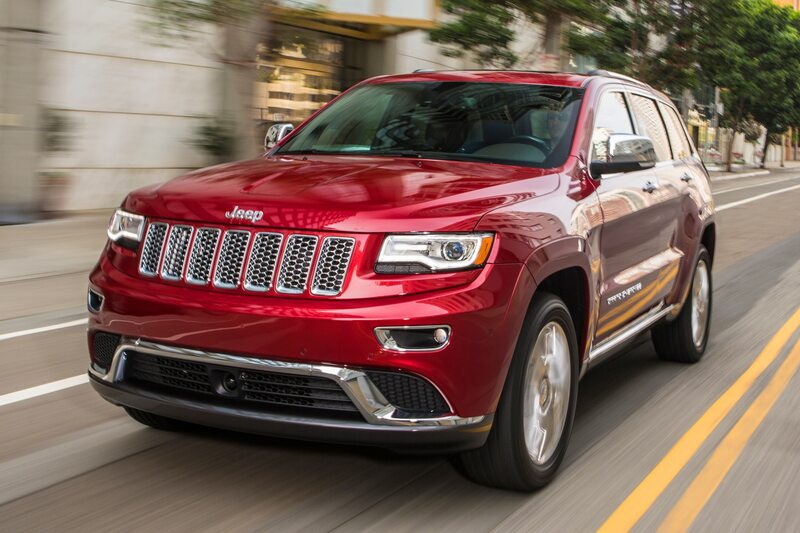 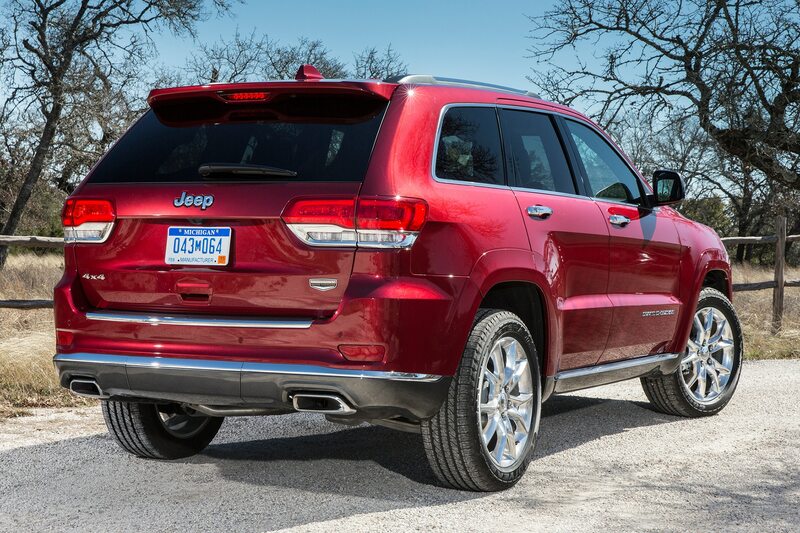 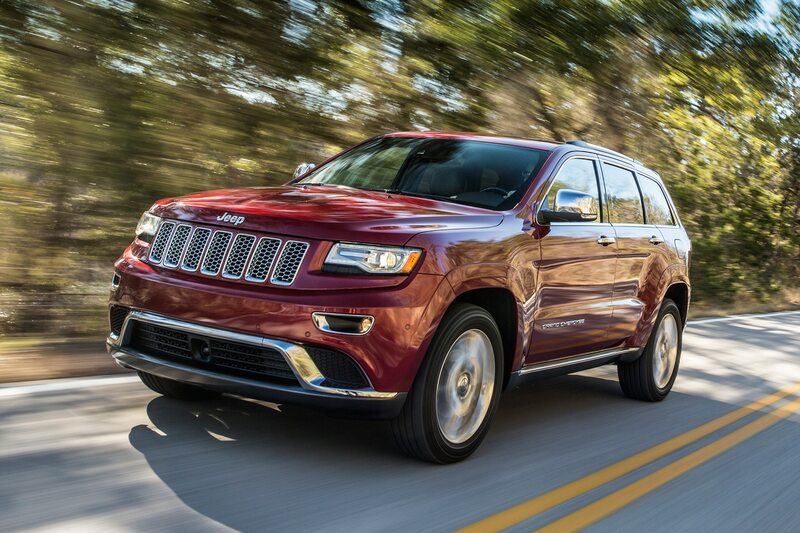 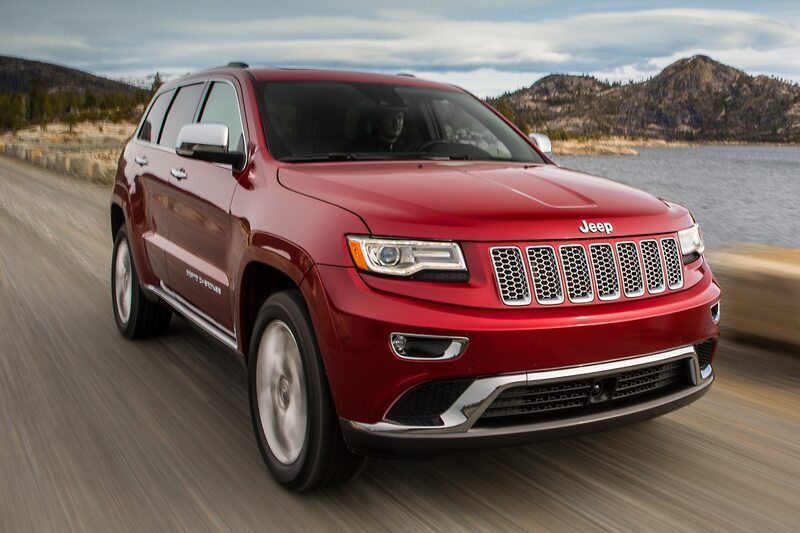 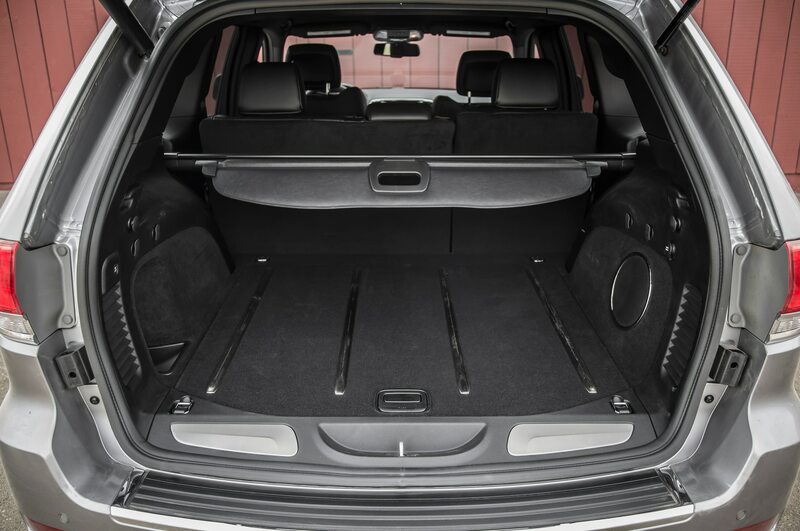 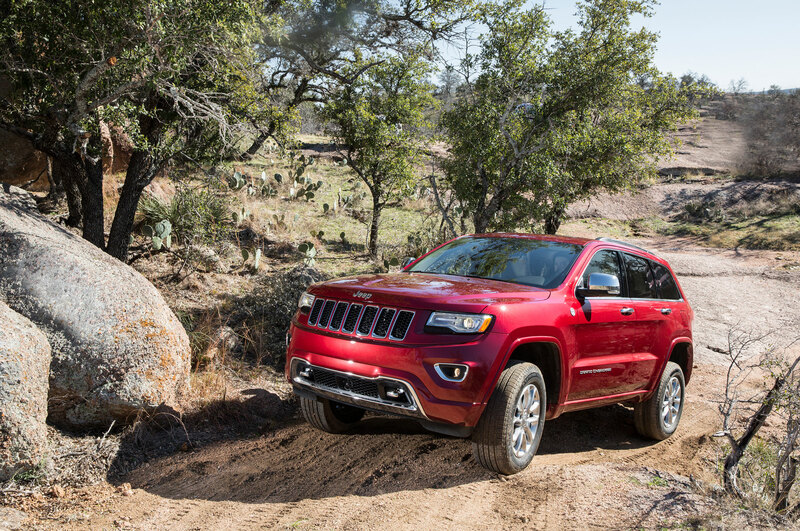 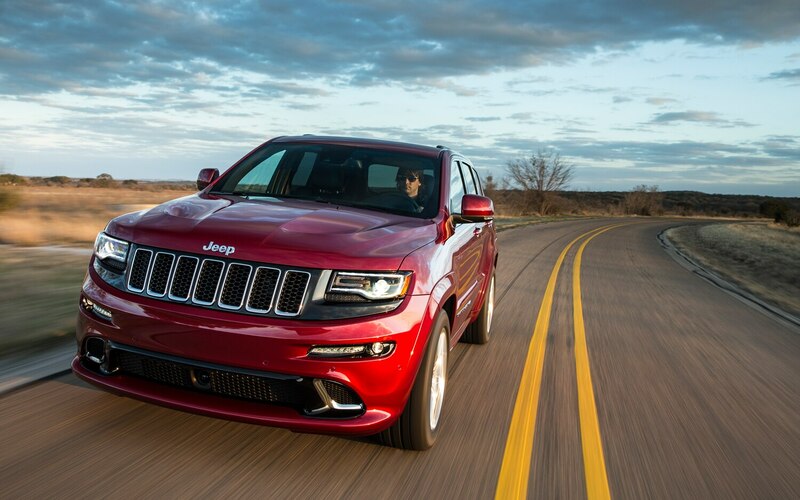 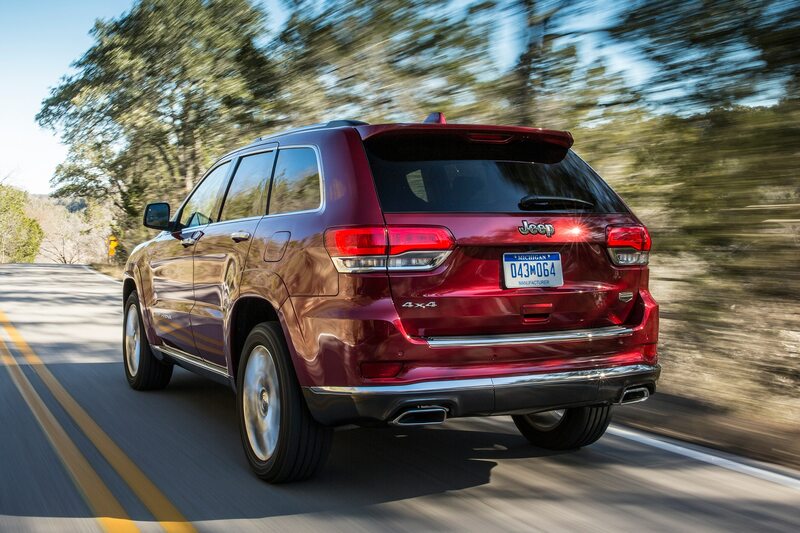 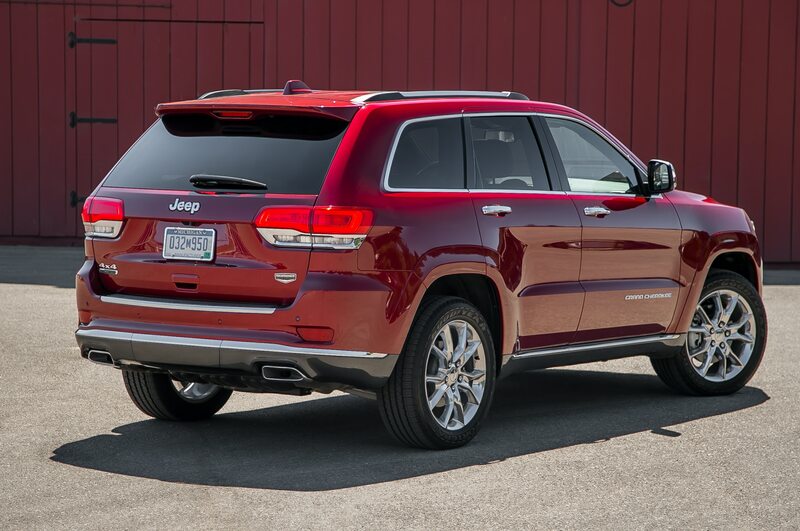 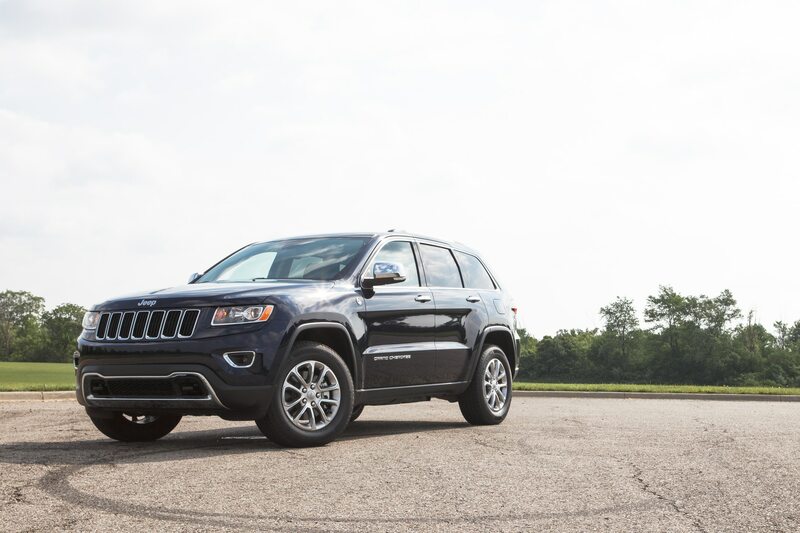 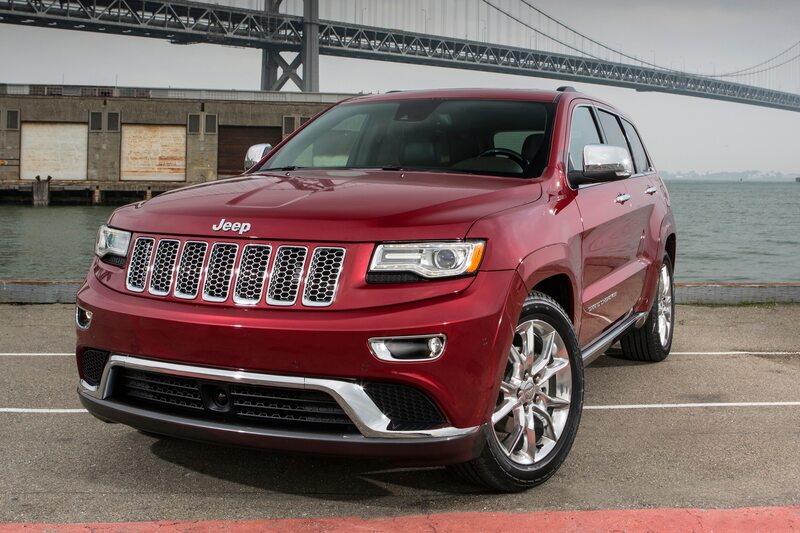 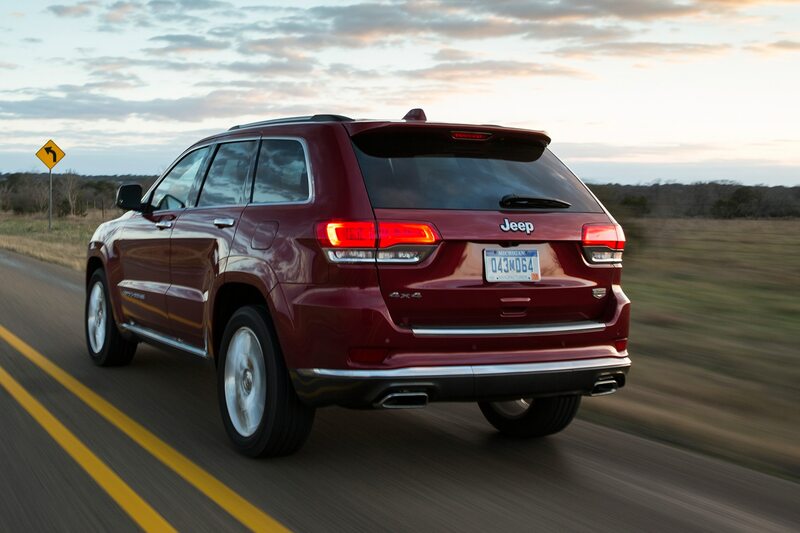 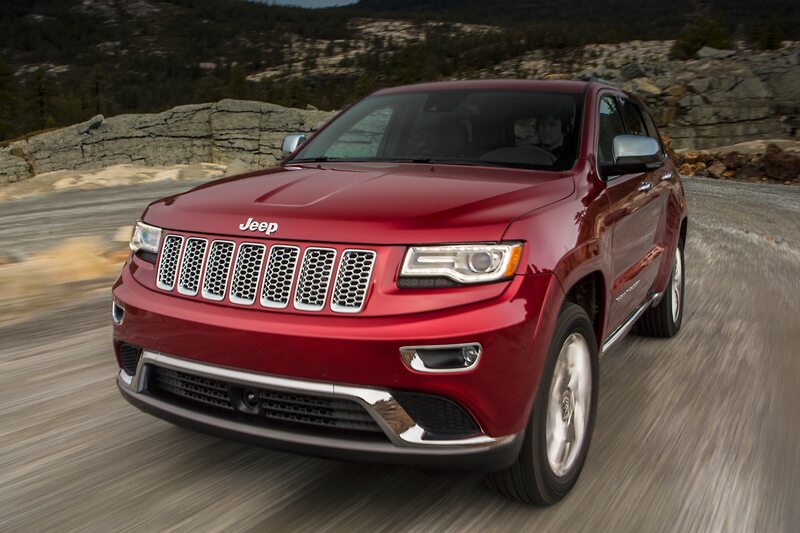 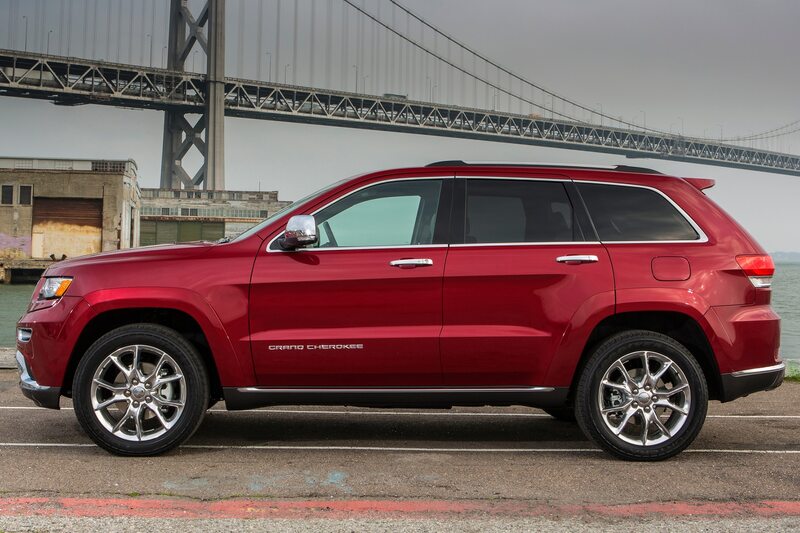 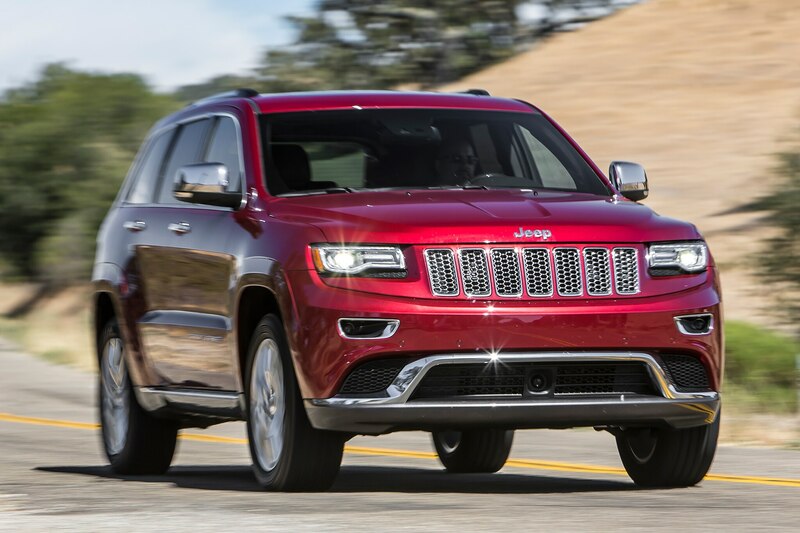 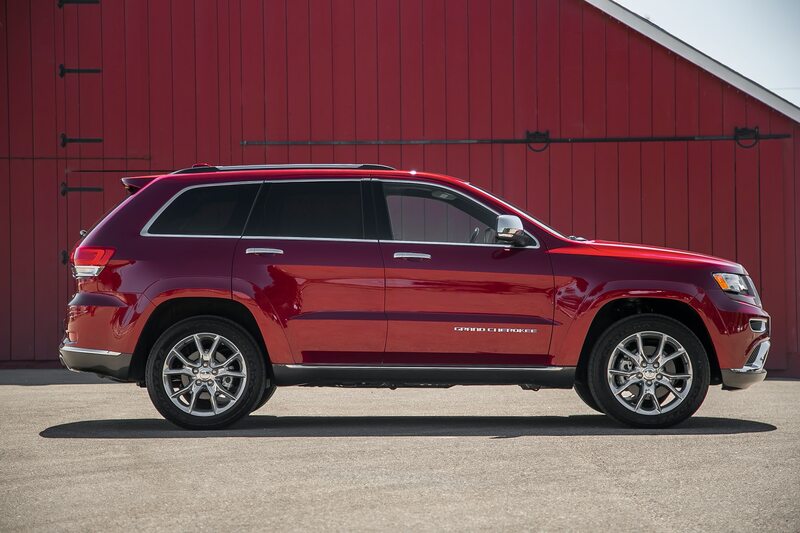 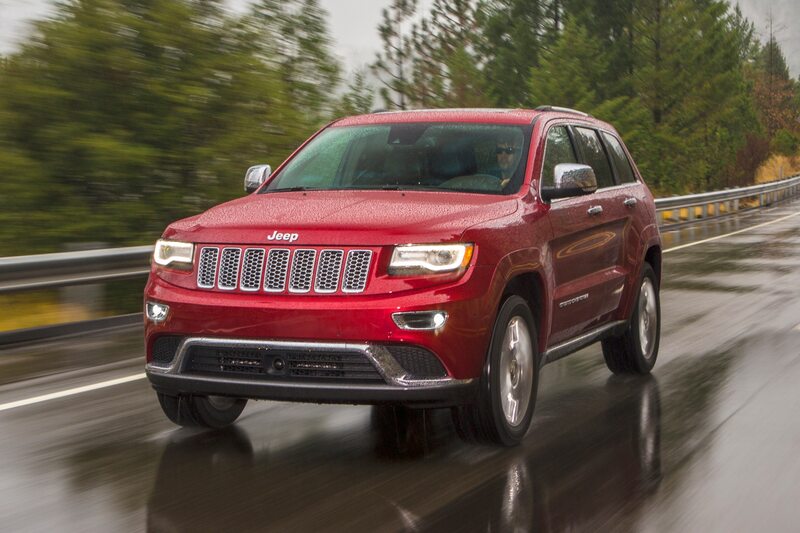 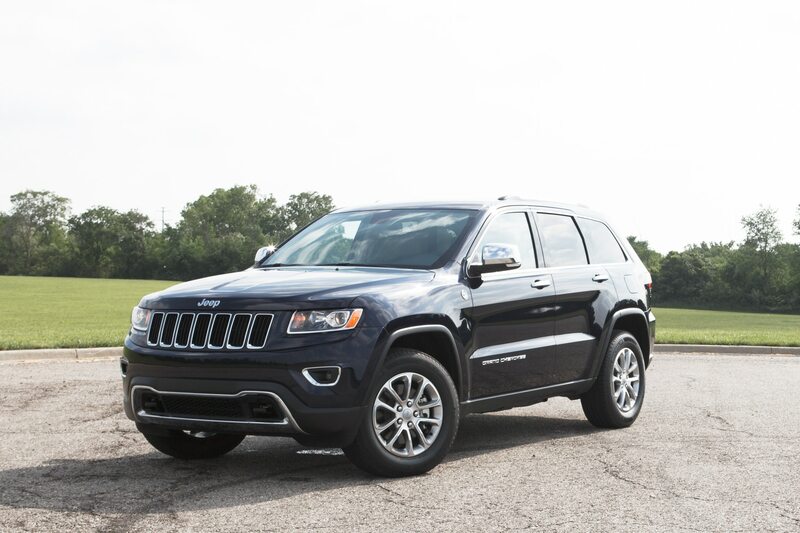 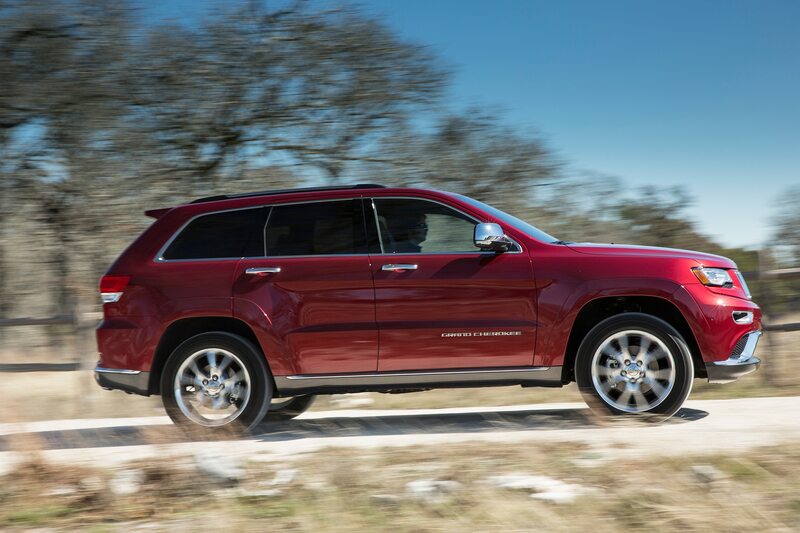 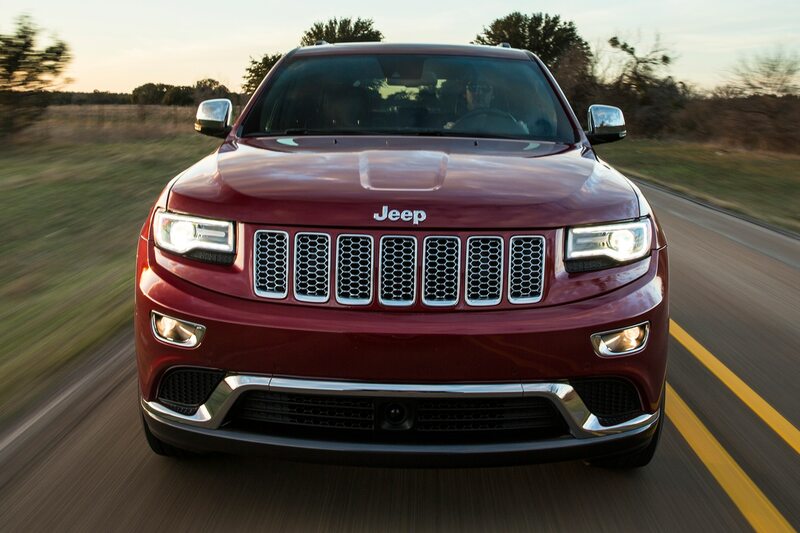 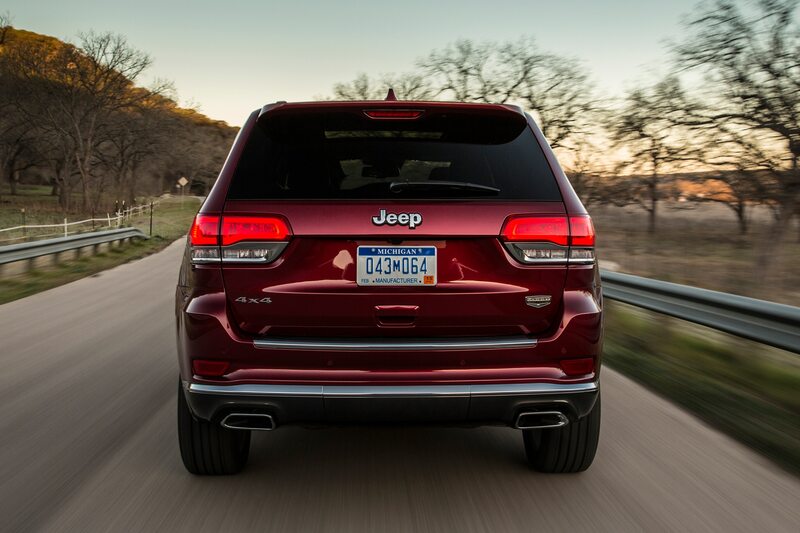 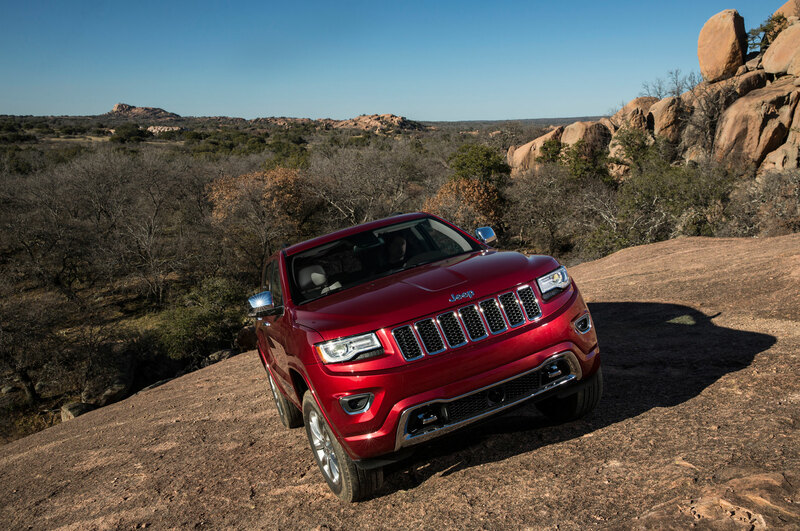 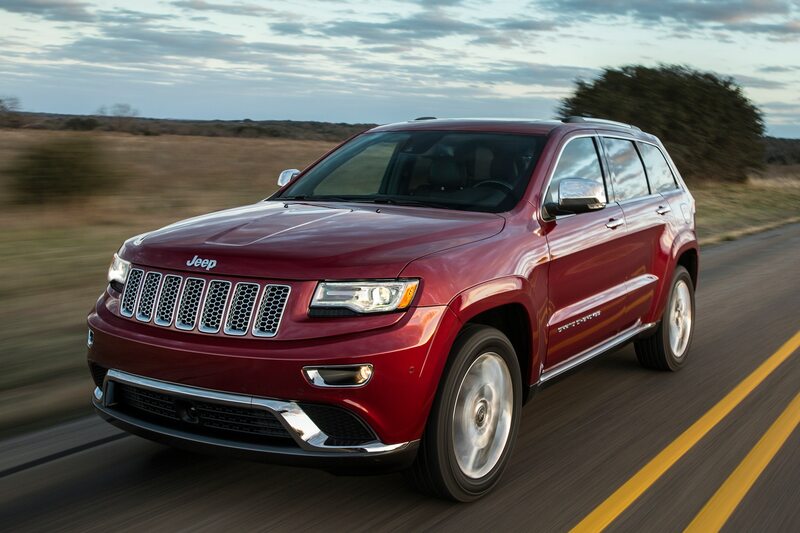 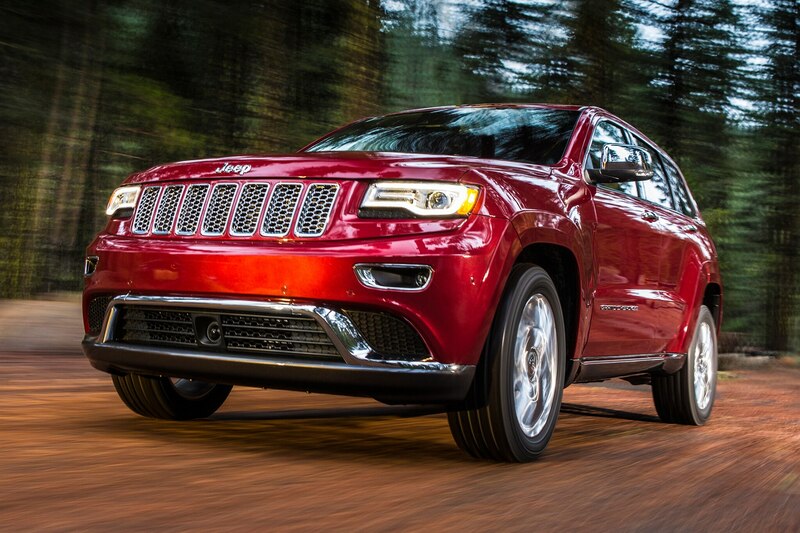 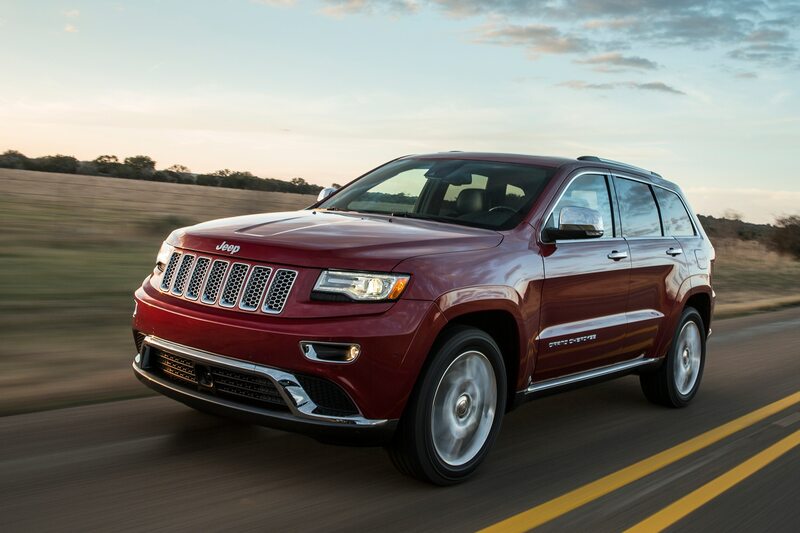 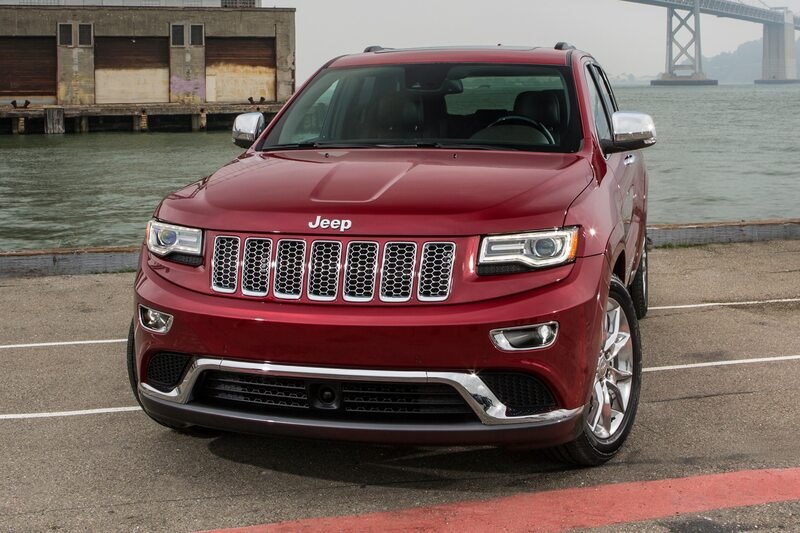 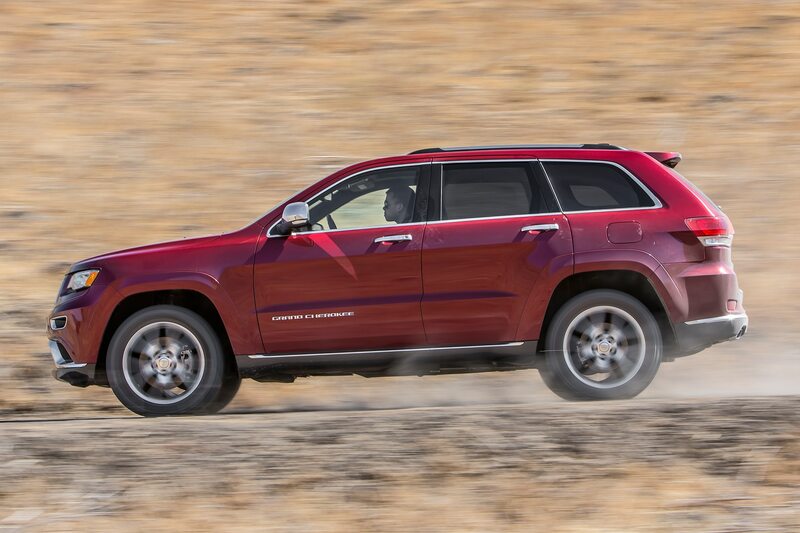 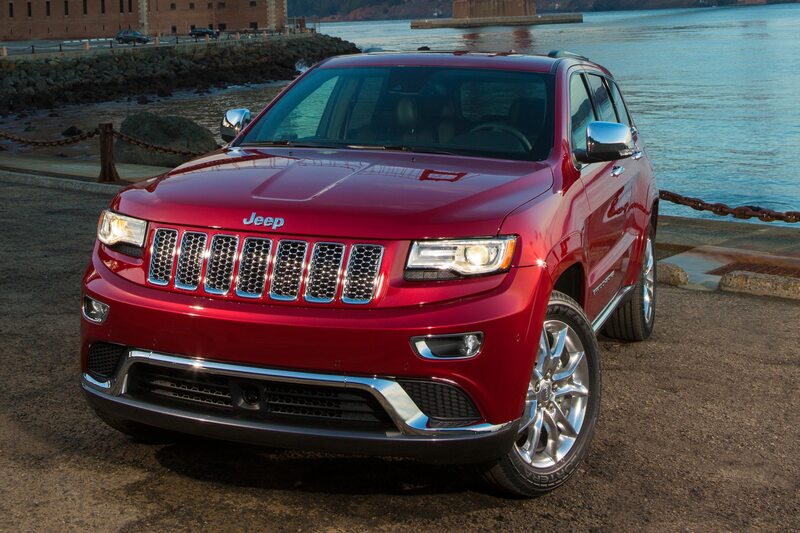 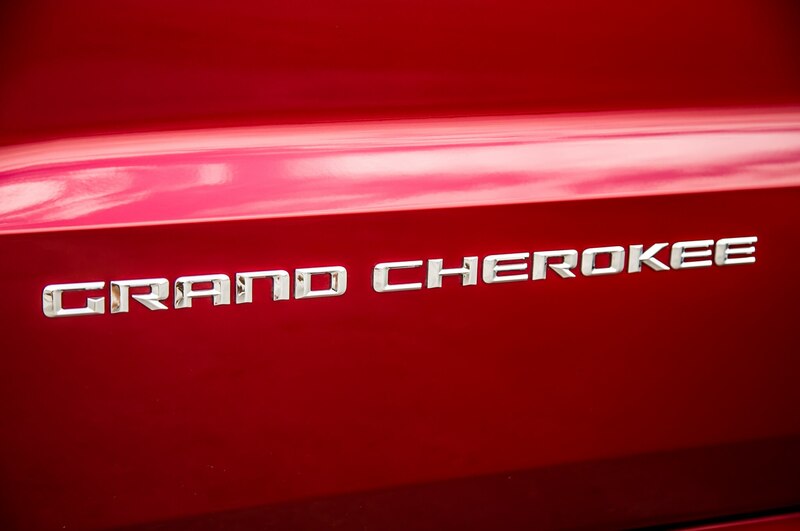 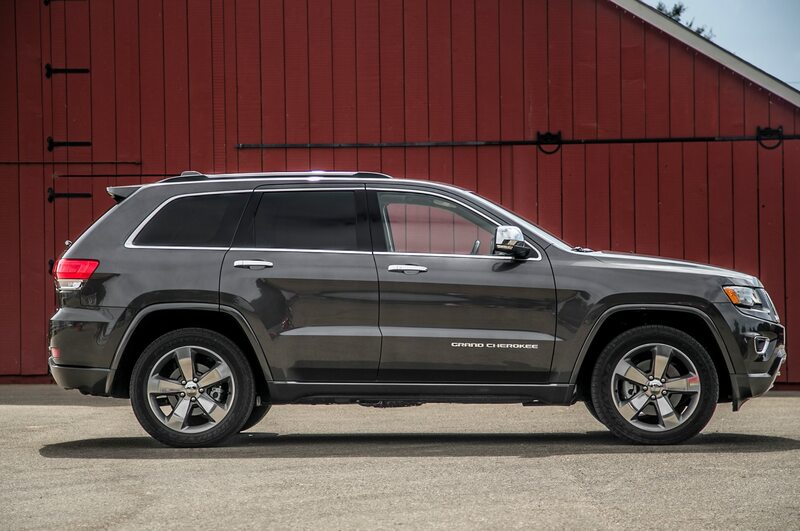 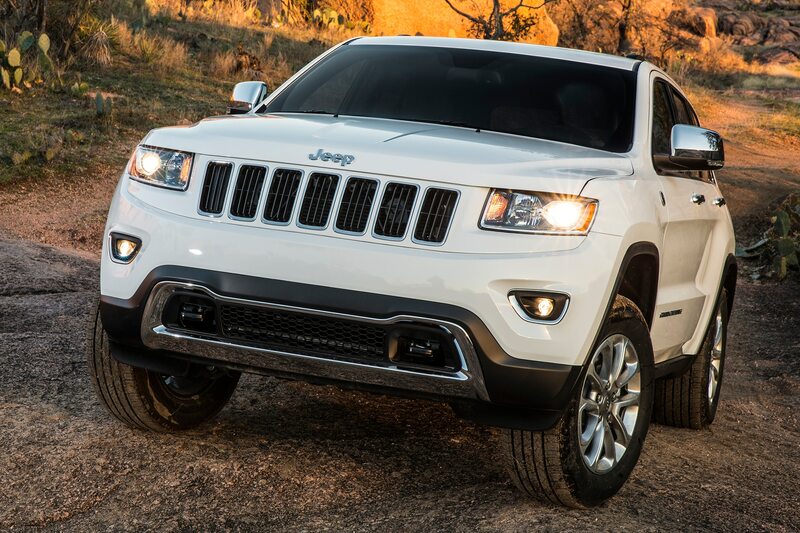 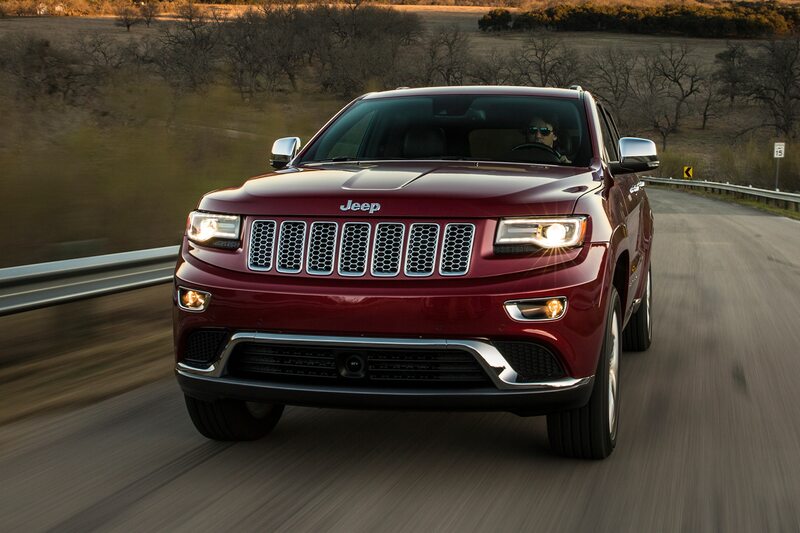 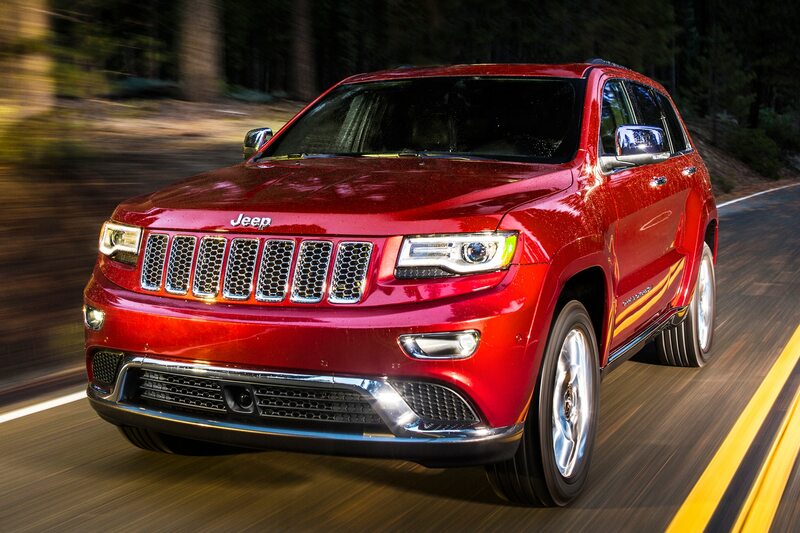 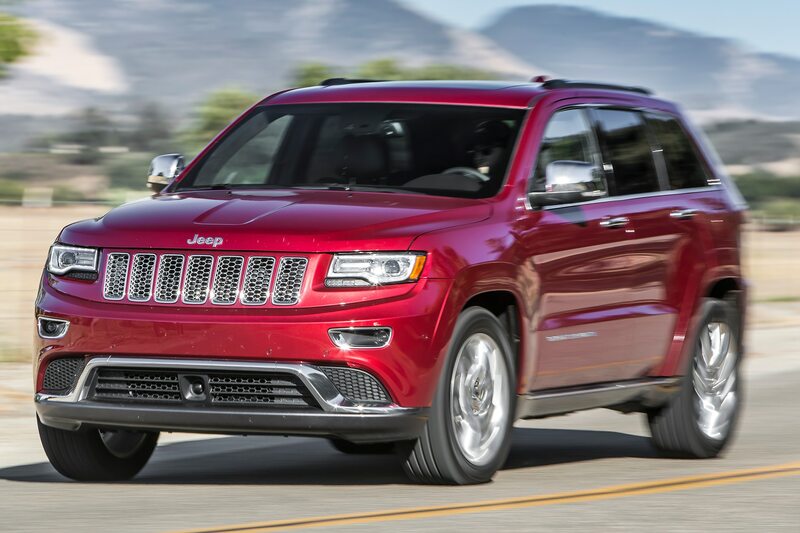 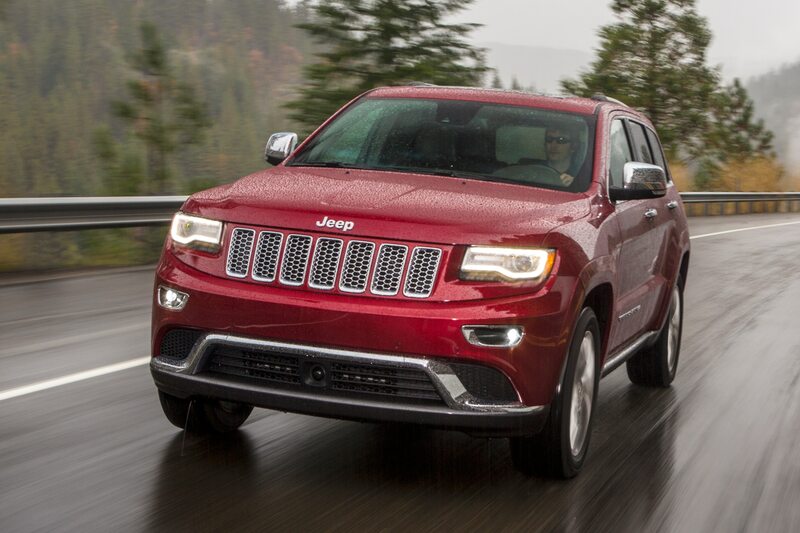 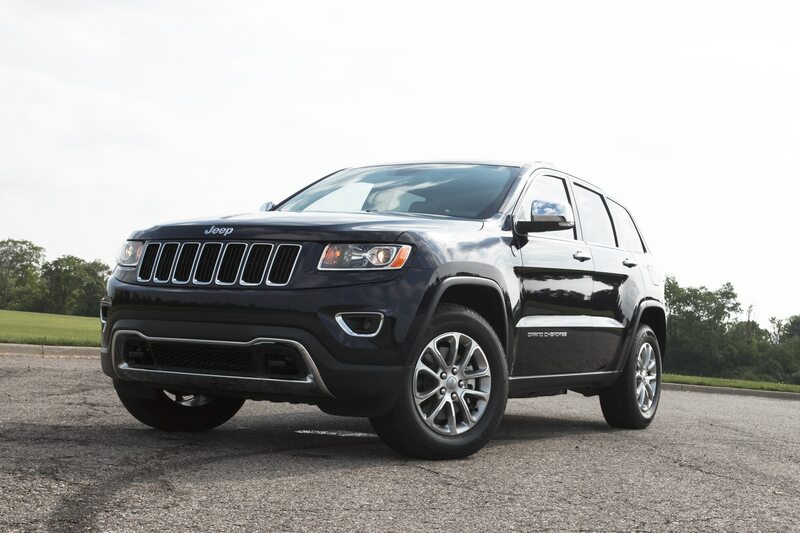 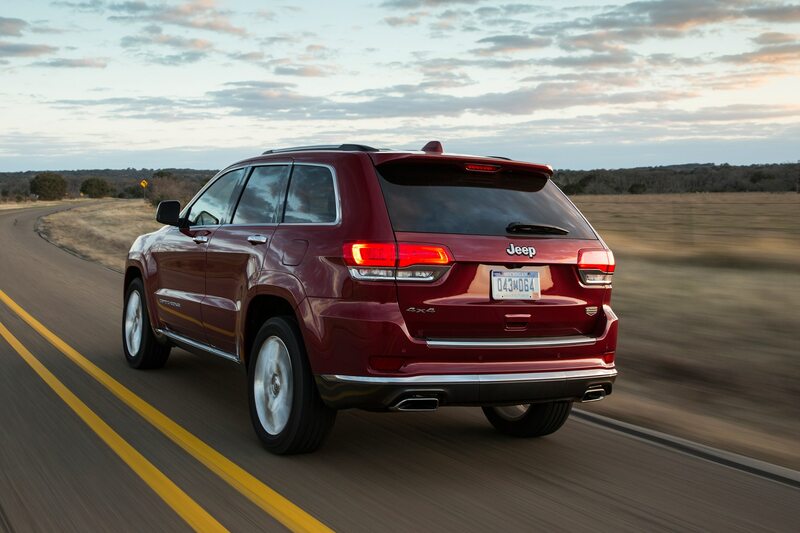 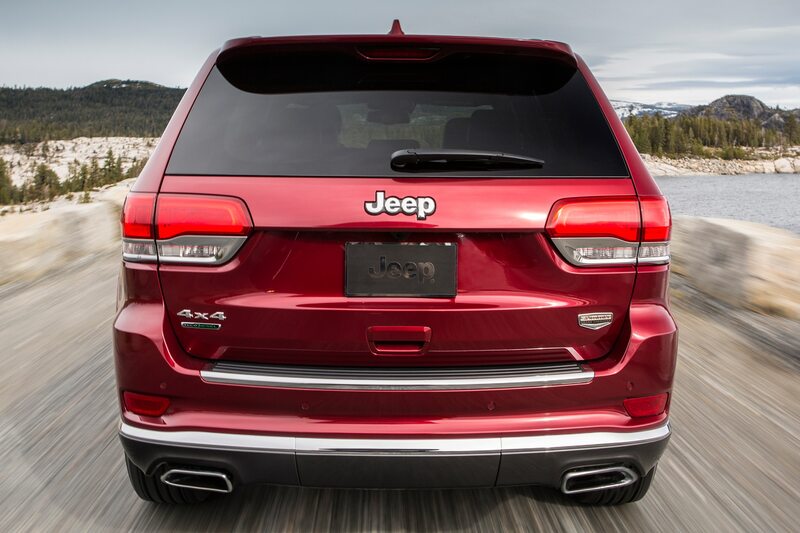 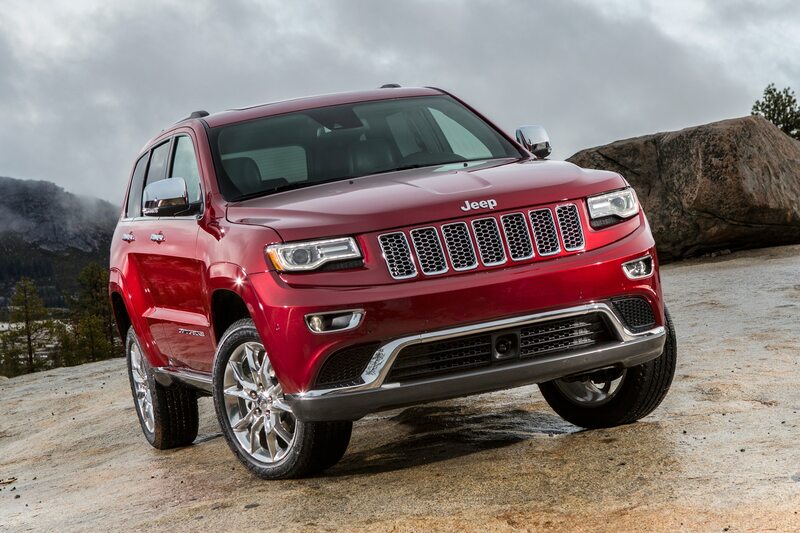 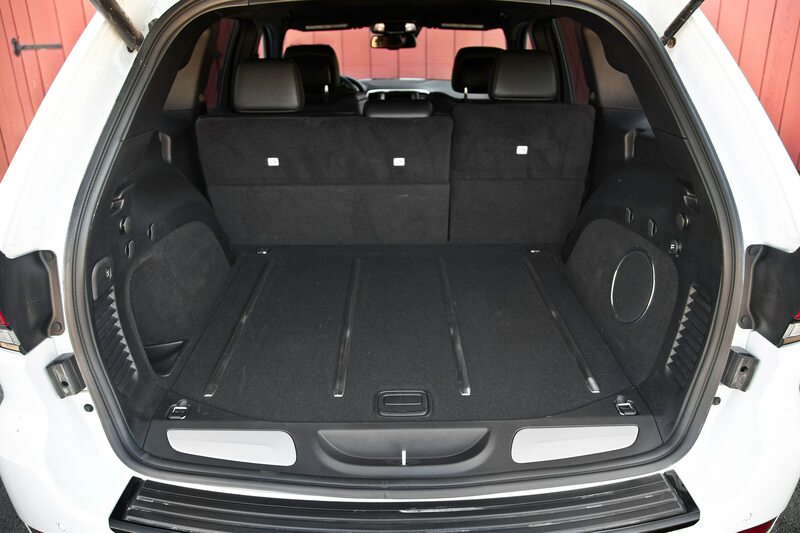 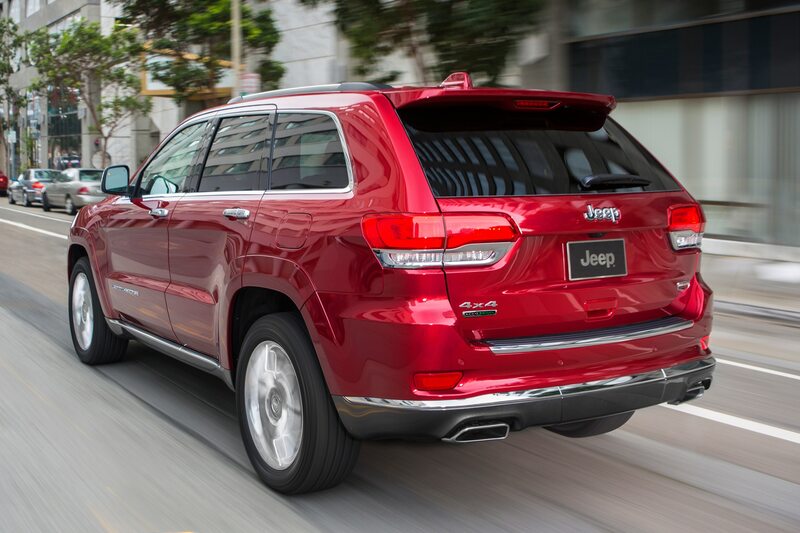 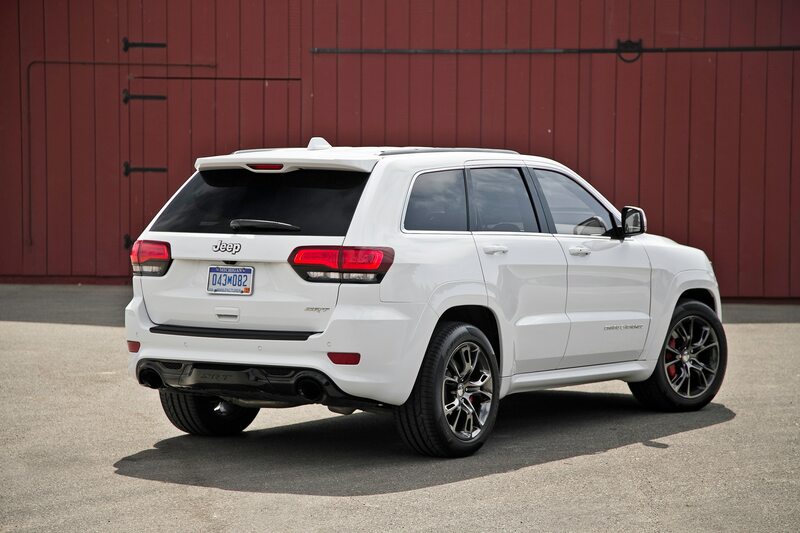 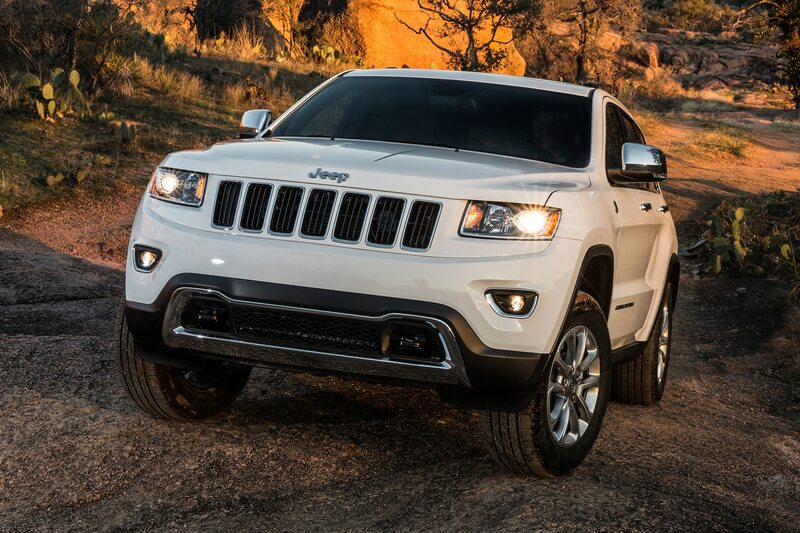 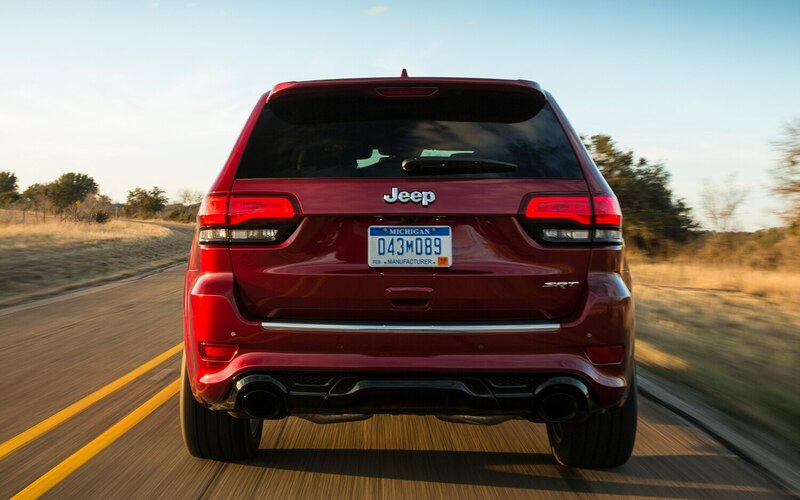 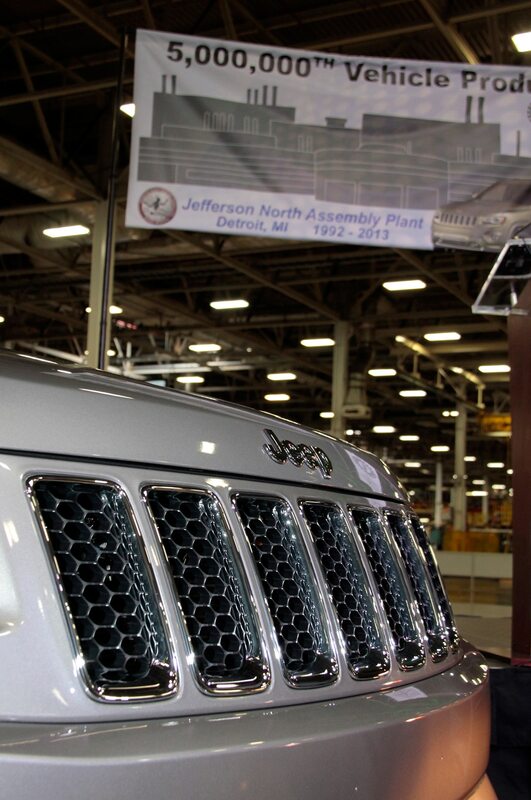 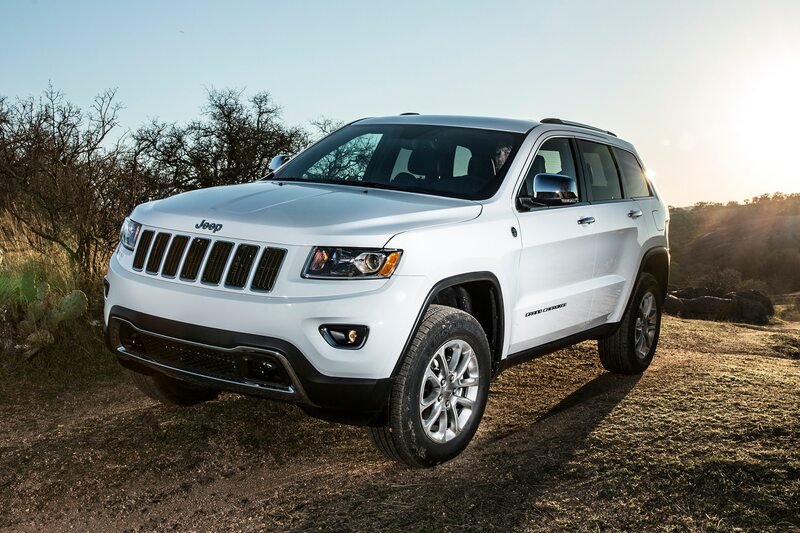 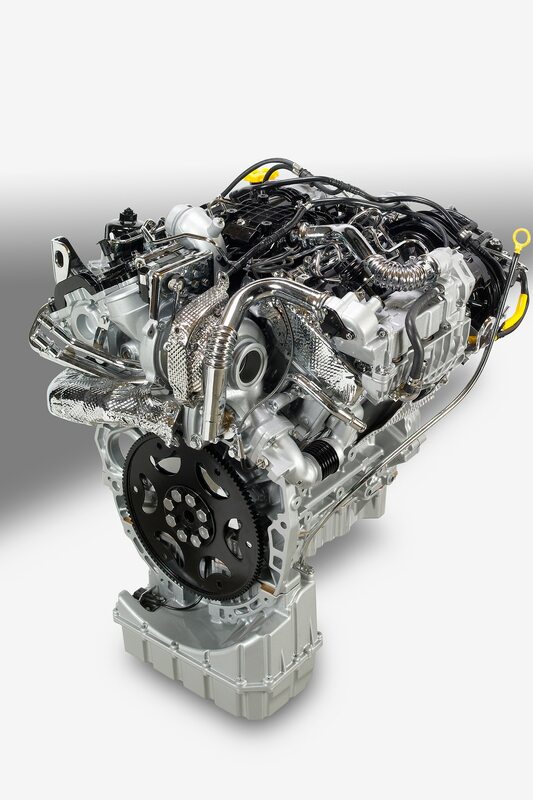 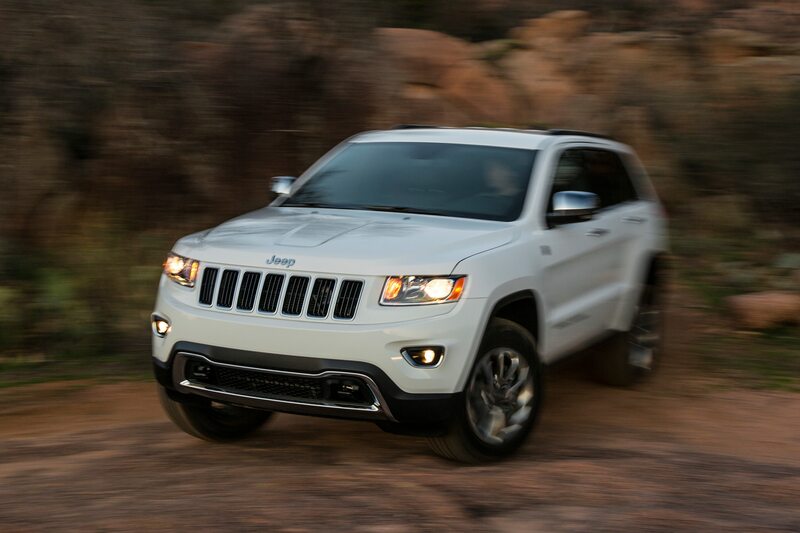 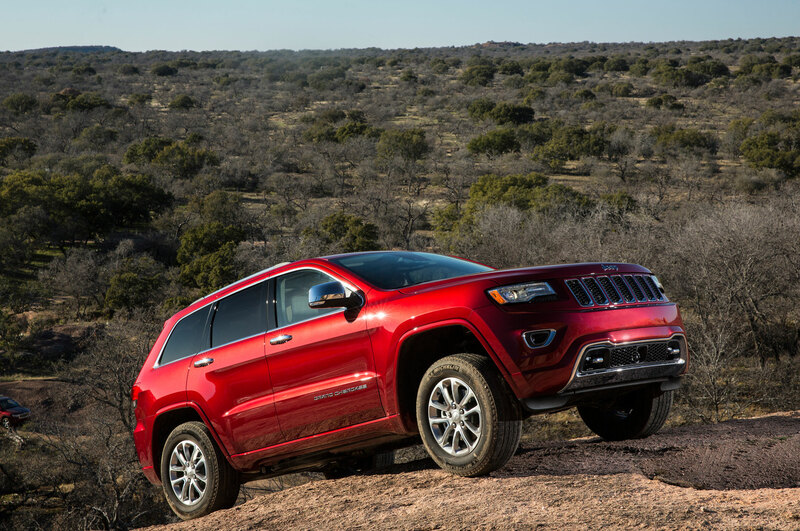 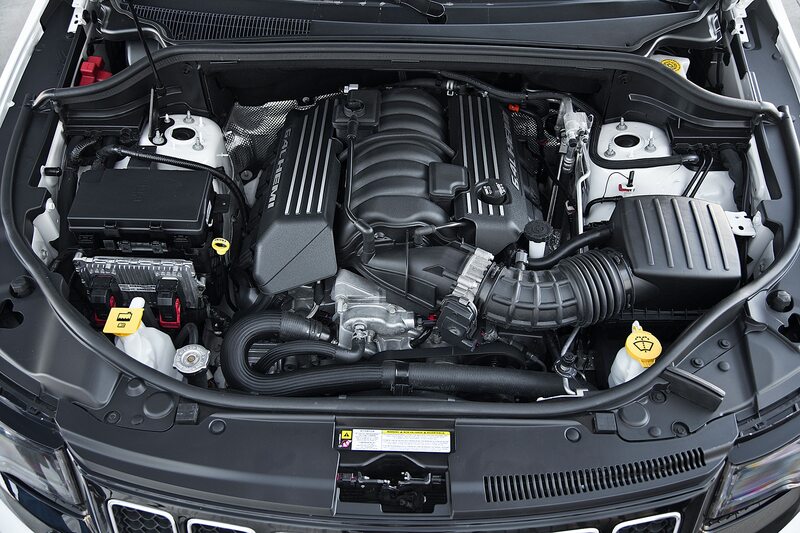 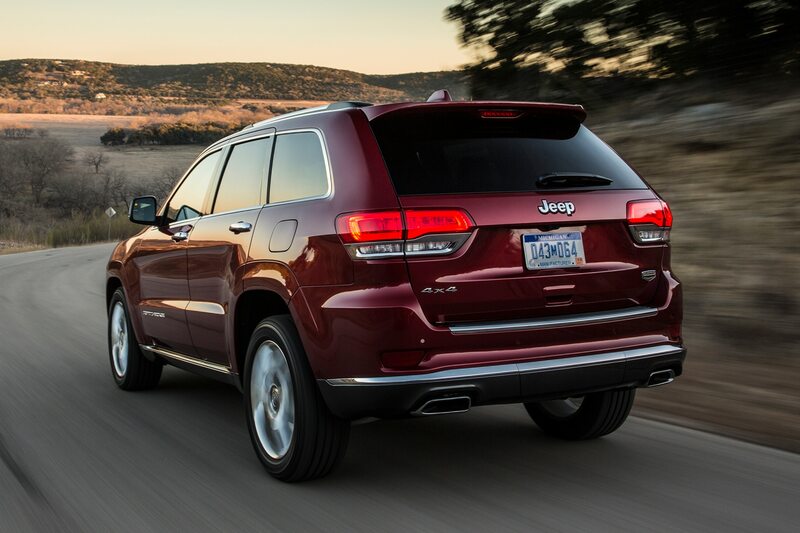 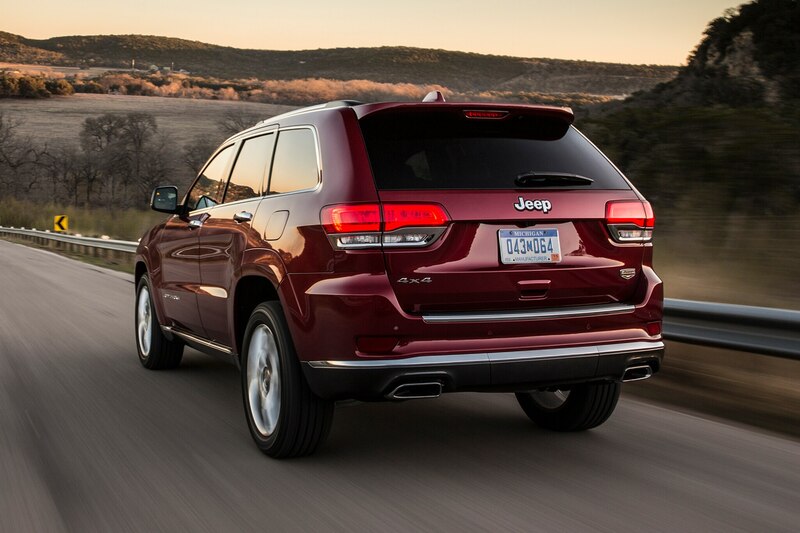 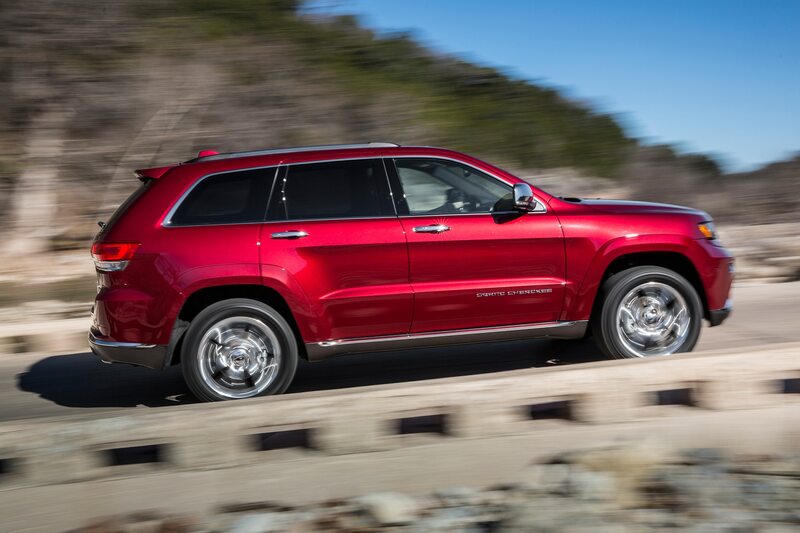 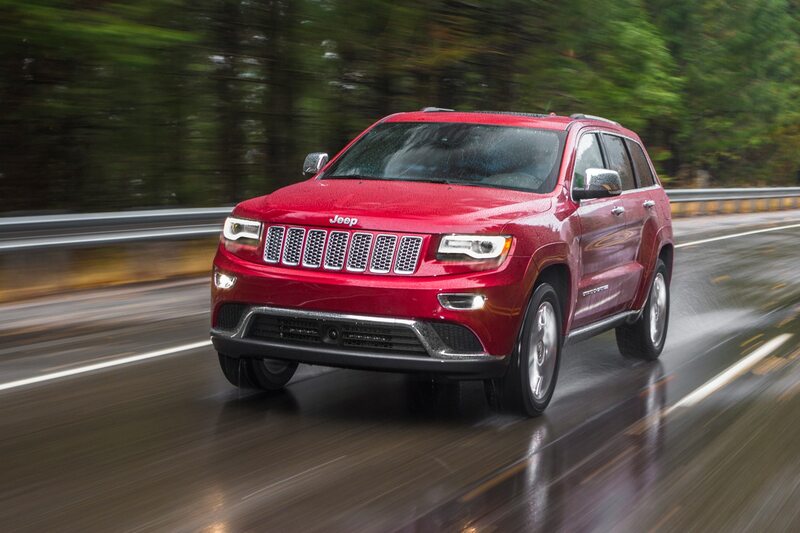 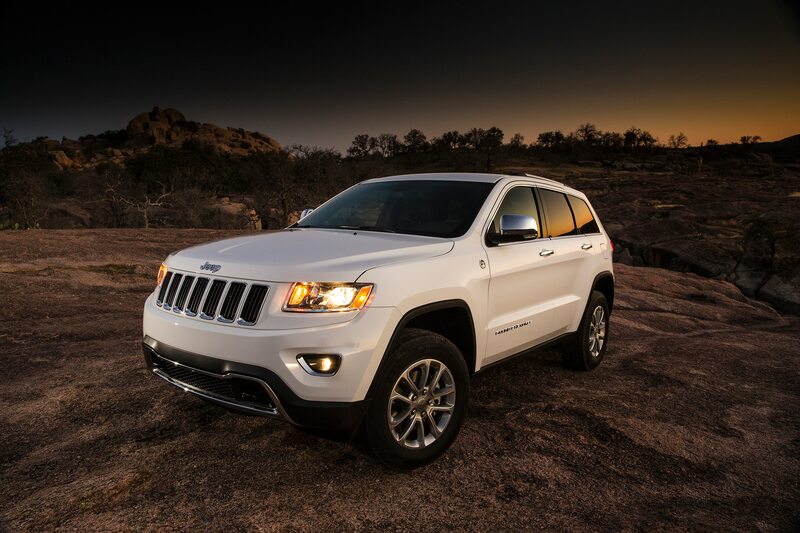 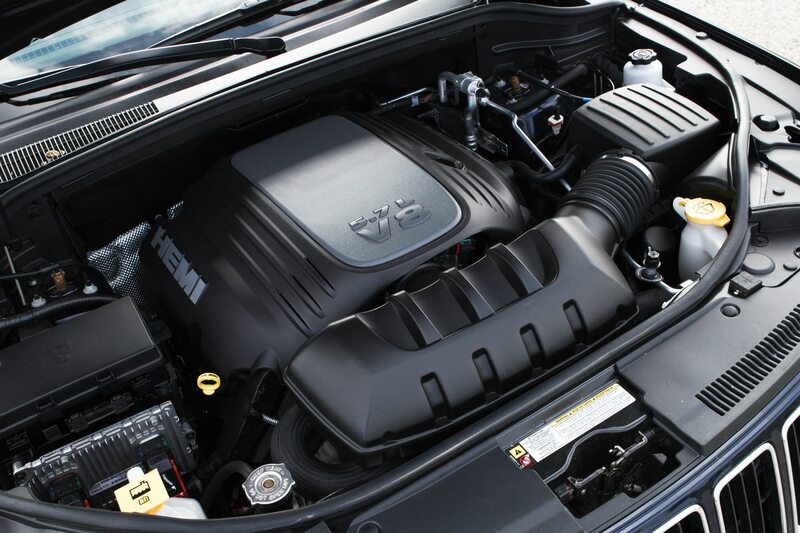 The diesel engine improves the Grand Cherokee’s capability as a worker. 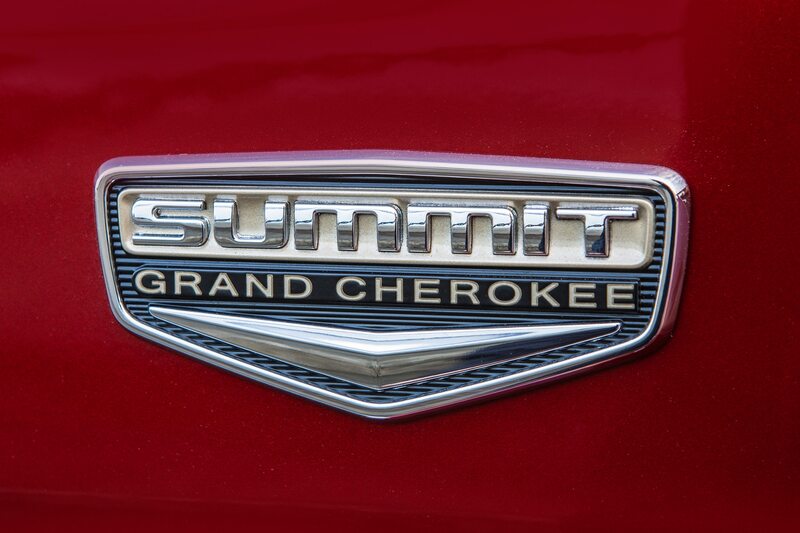 And from the Laredo to the Summit, the lineup shows it can transfer between tasks as needed, like any successful ant species. 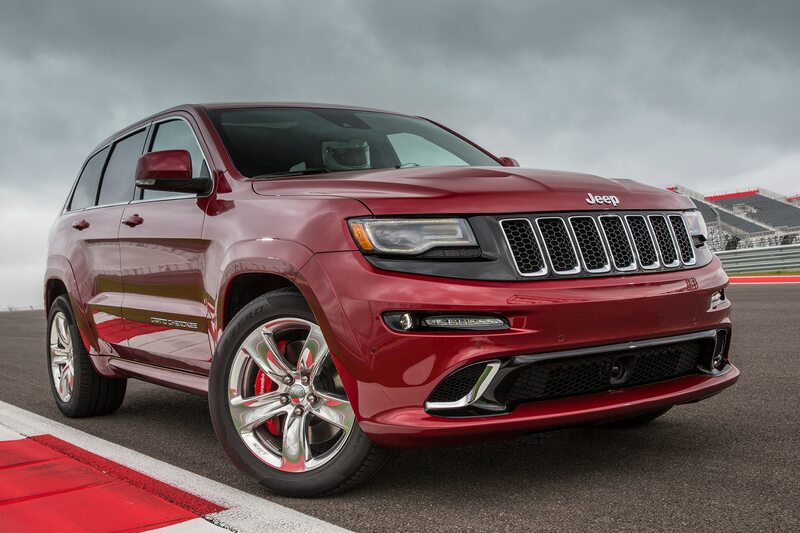 The SRT, though, reminds us that some ants can fly. 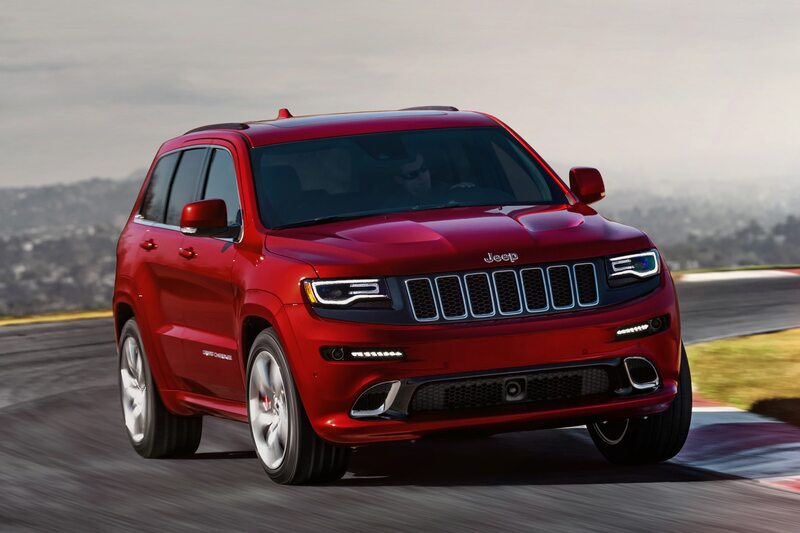 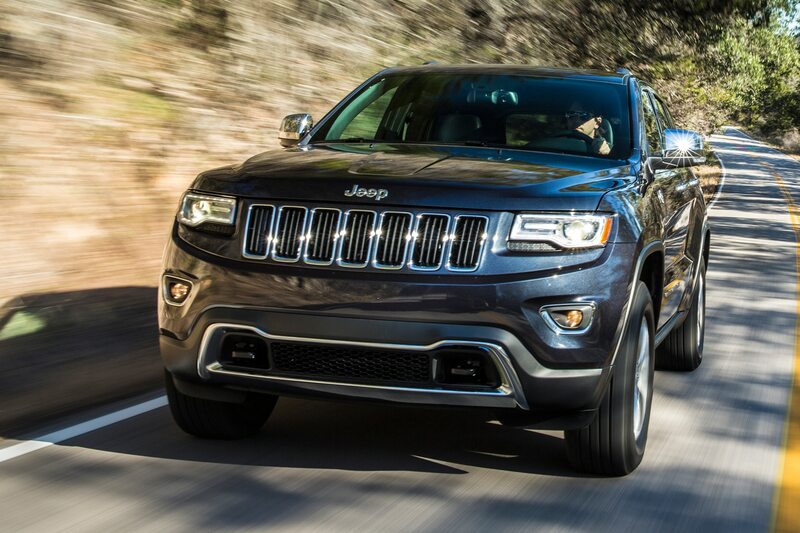 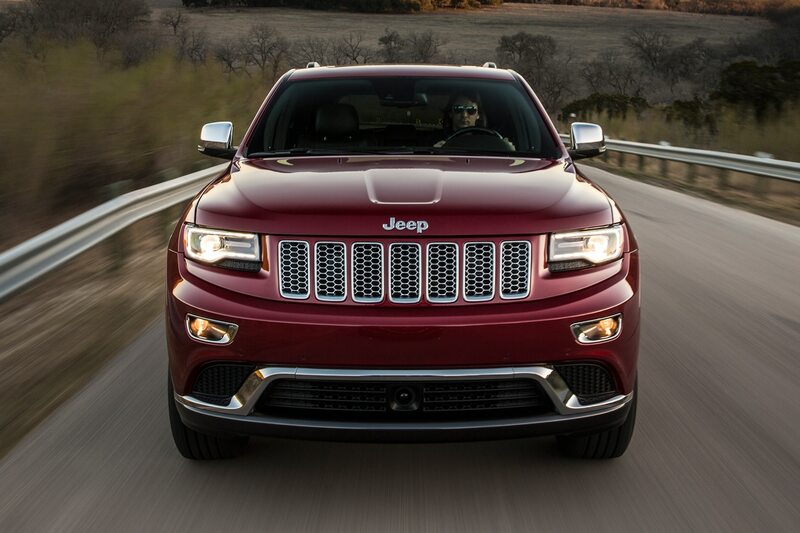 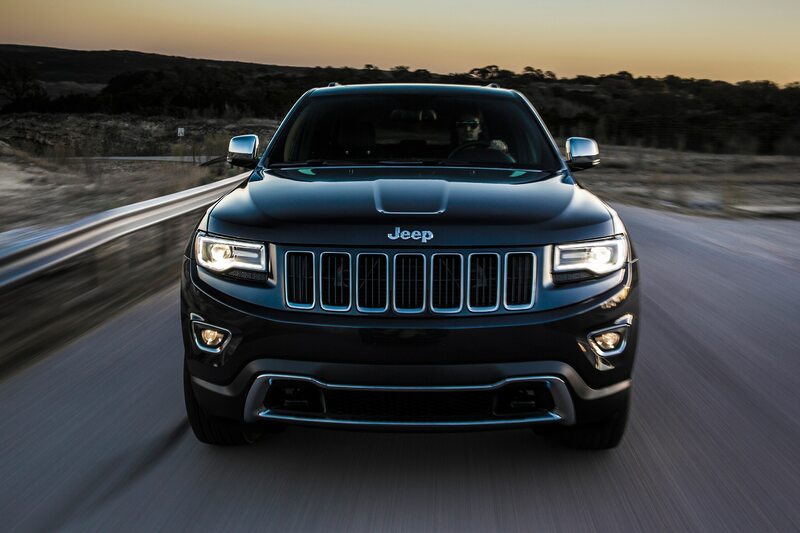 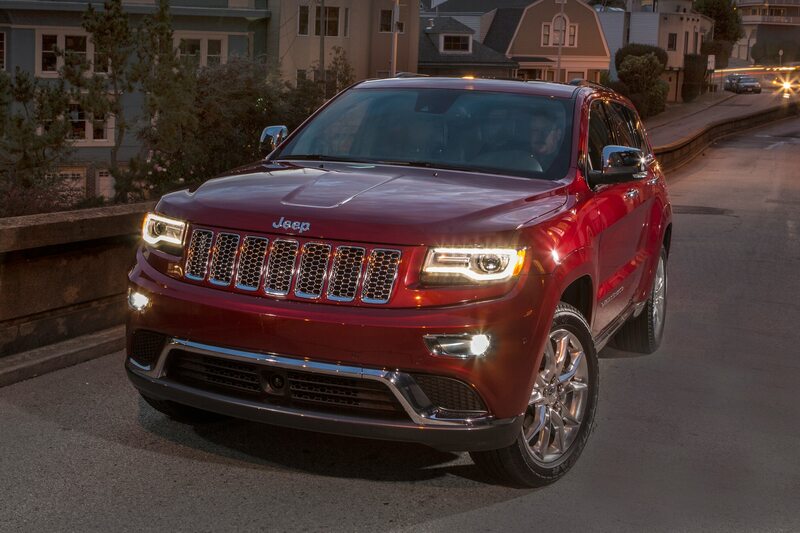 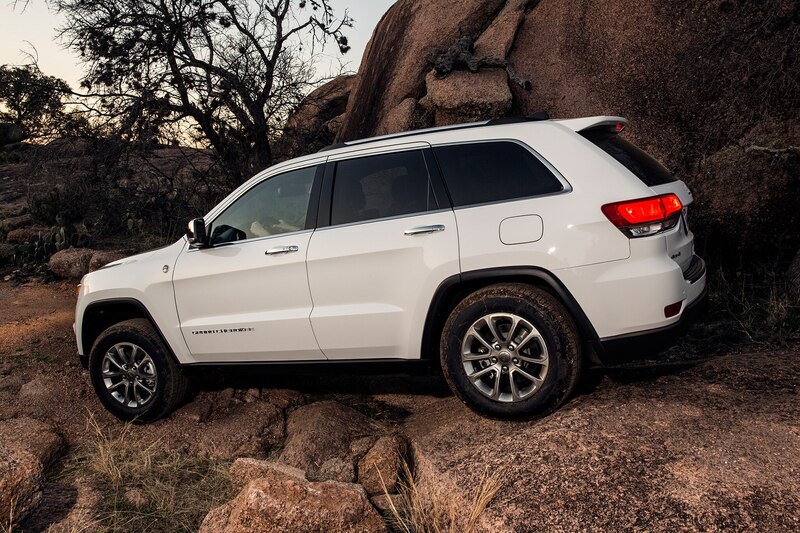 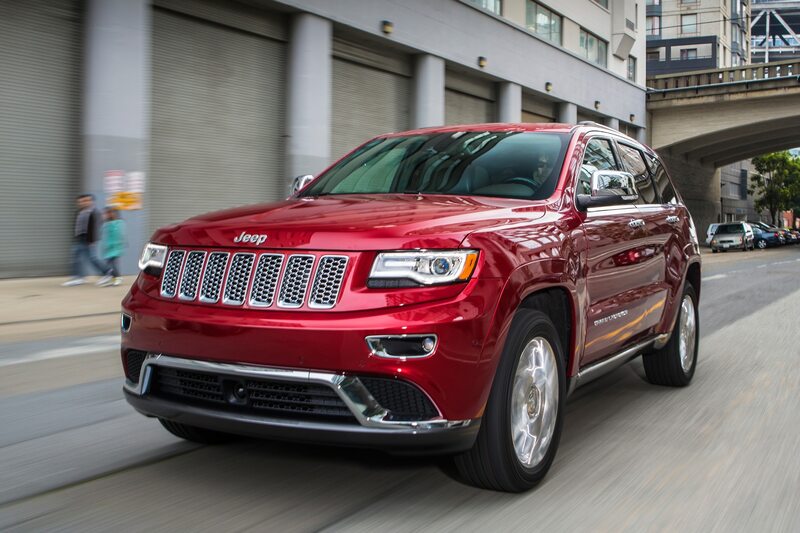 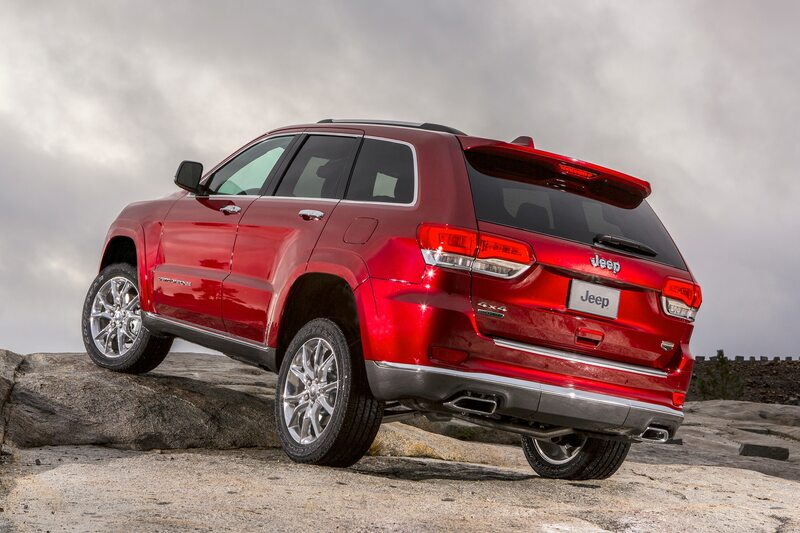 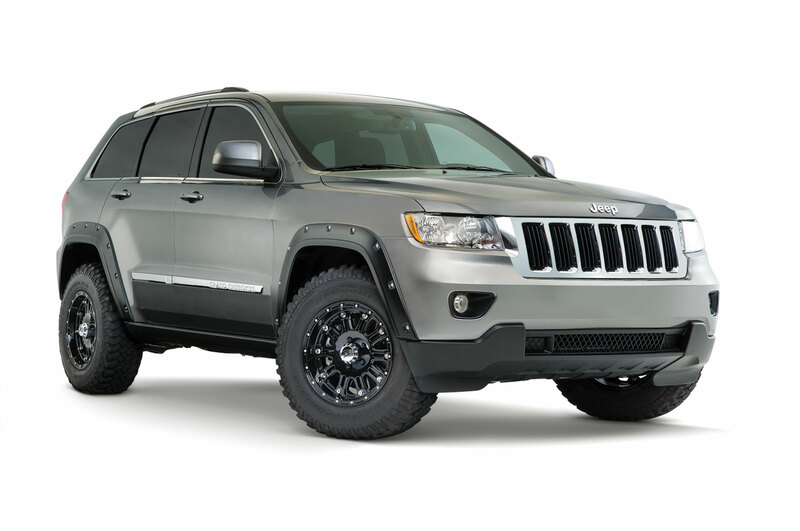 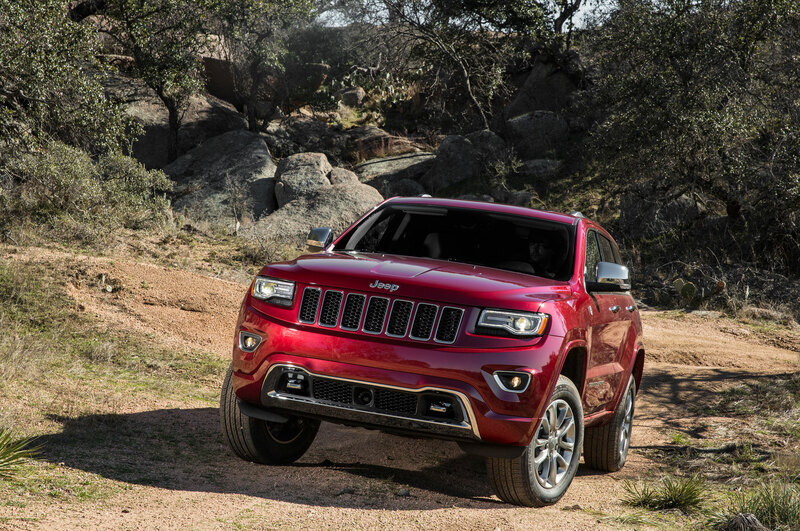 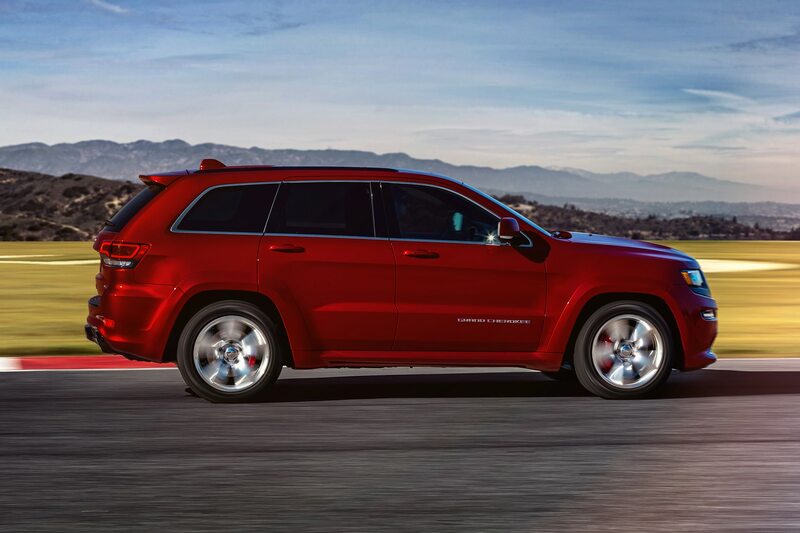 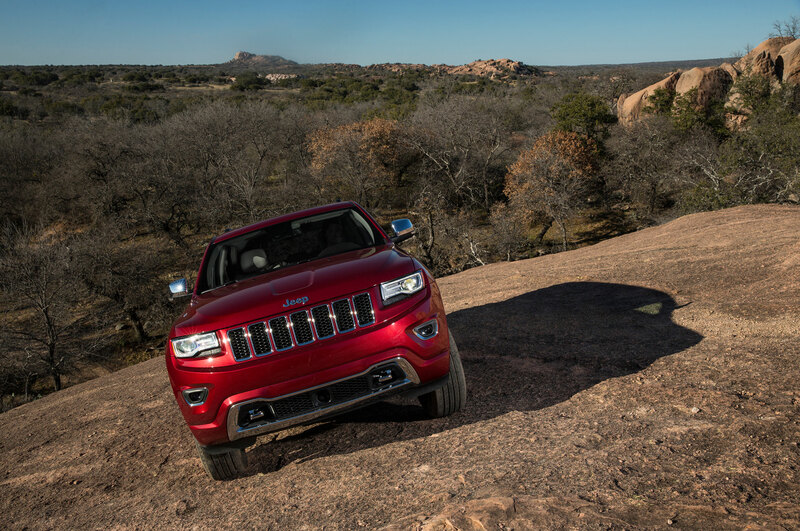 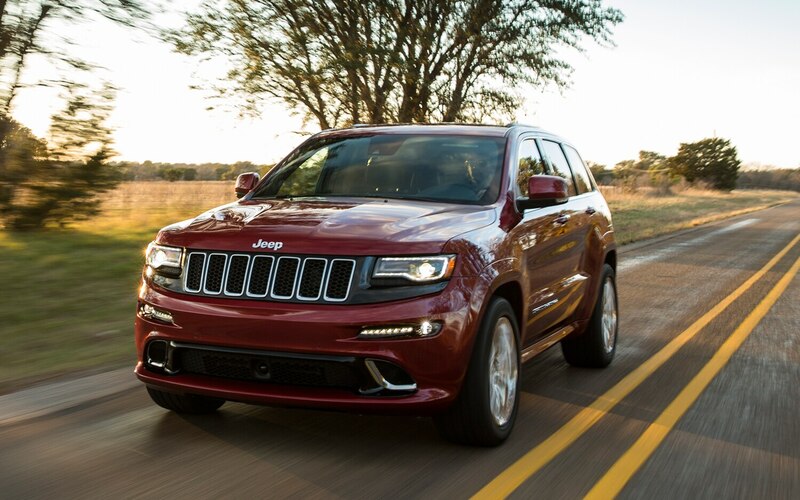 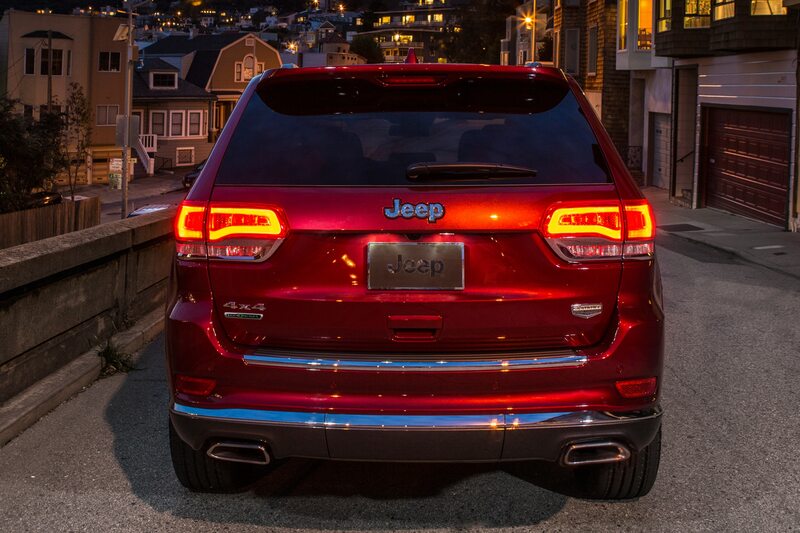 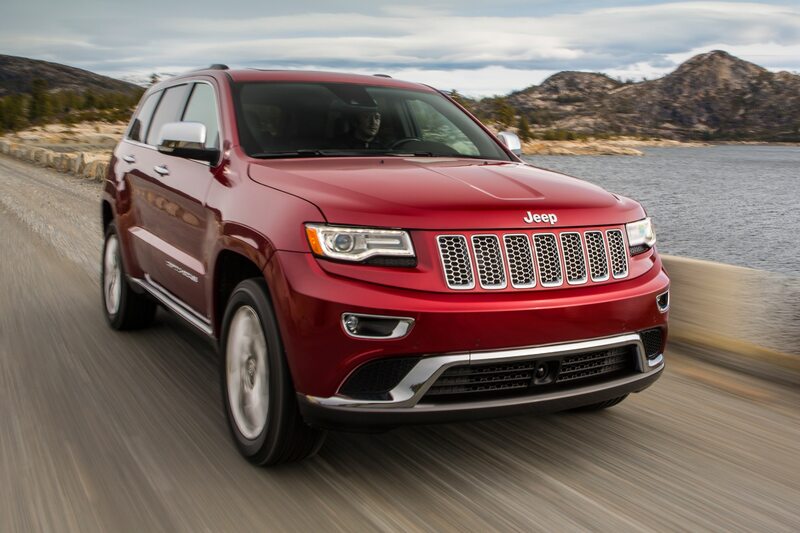 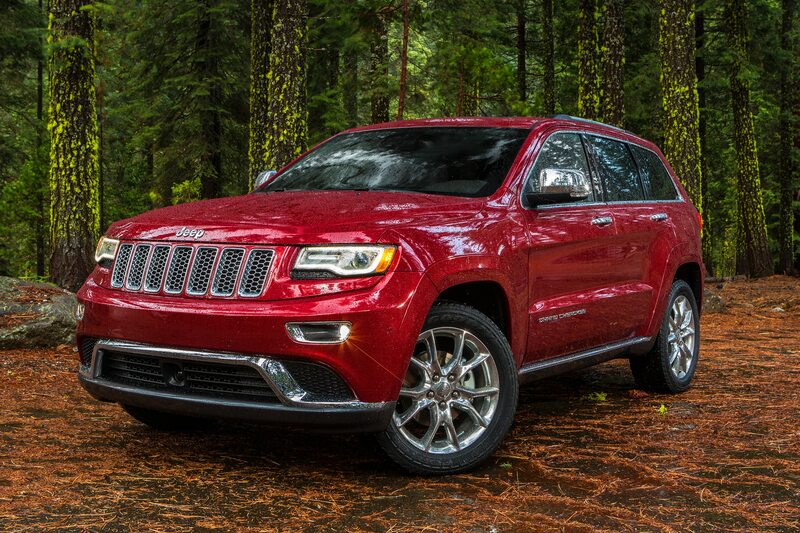 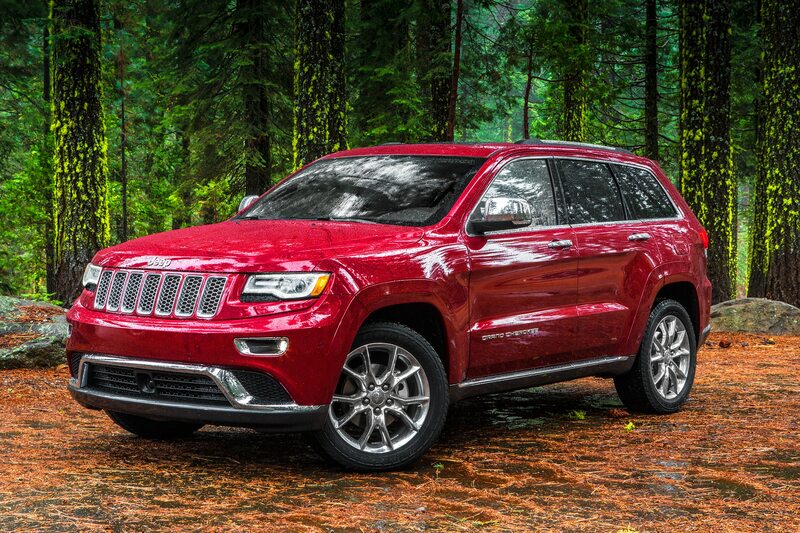 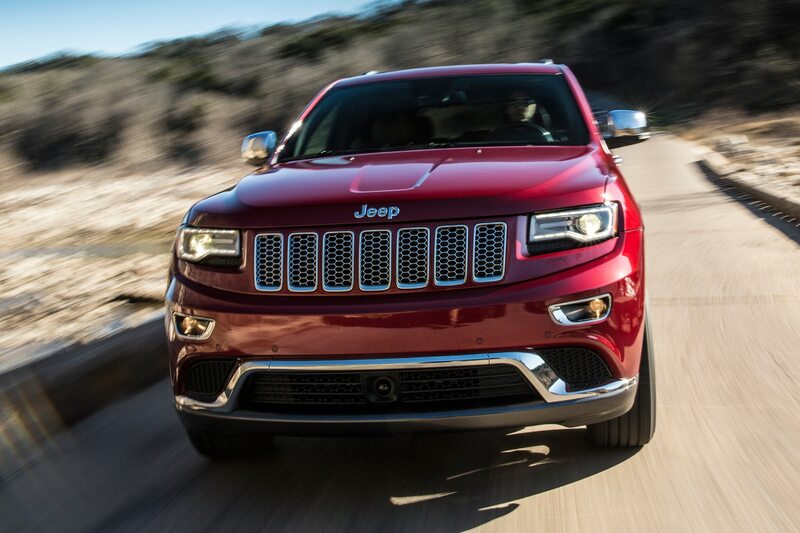 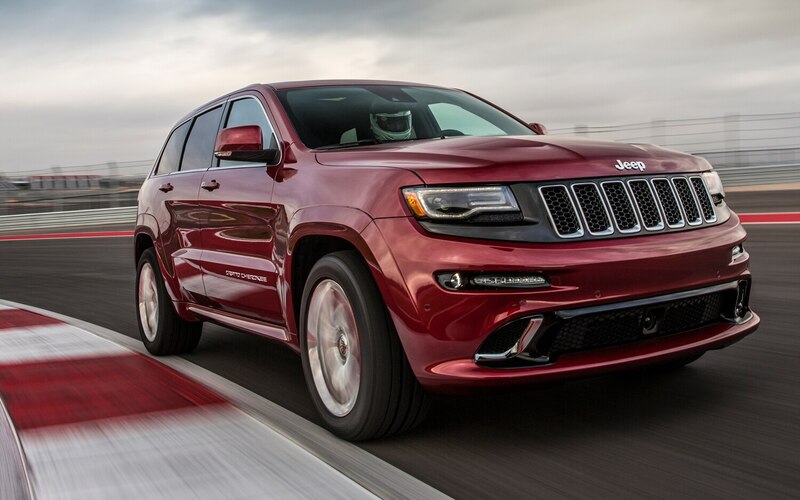 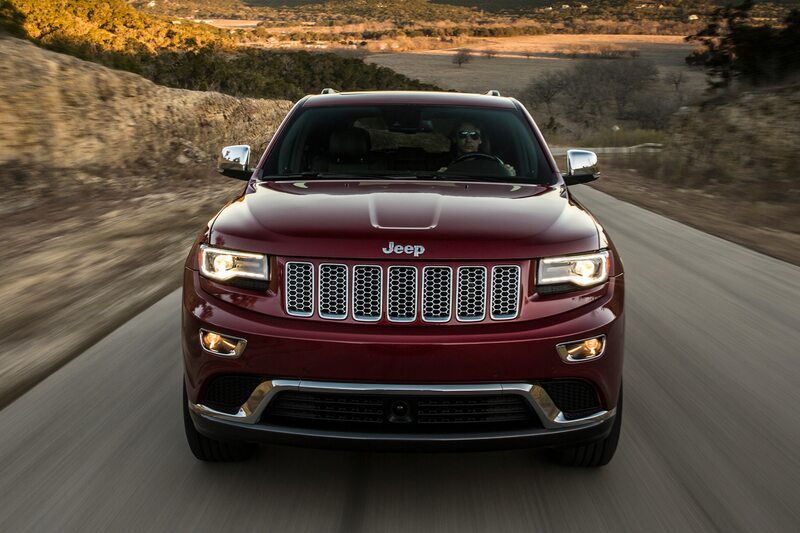 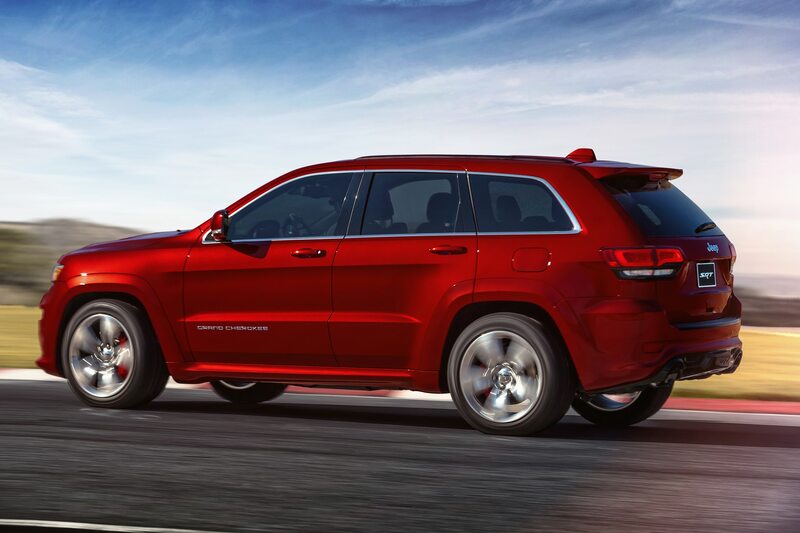 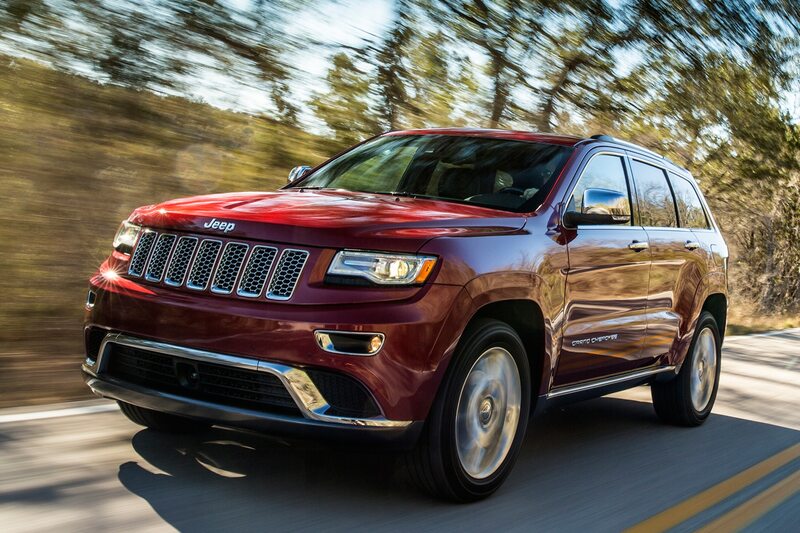 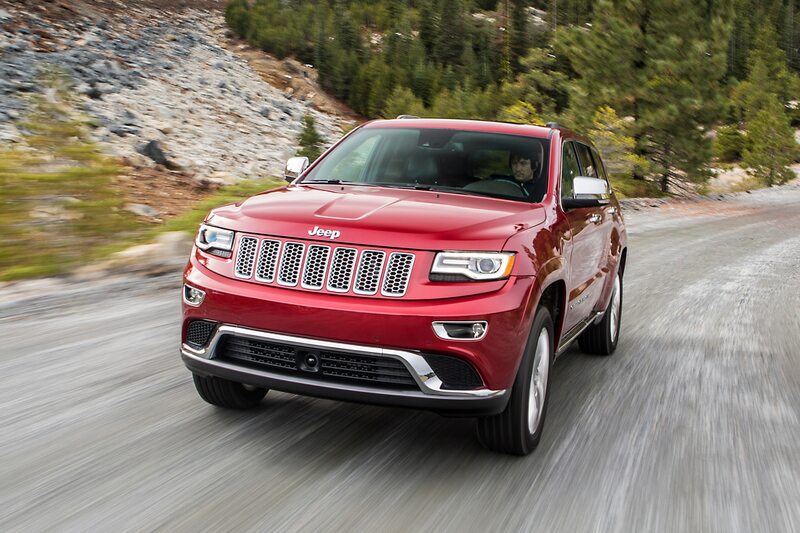 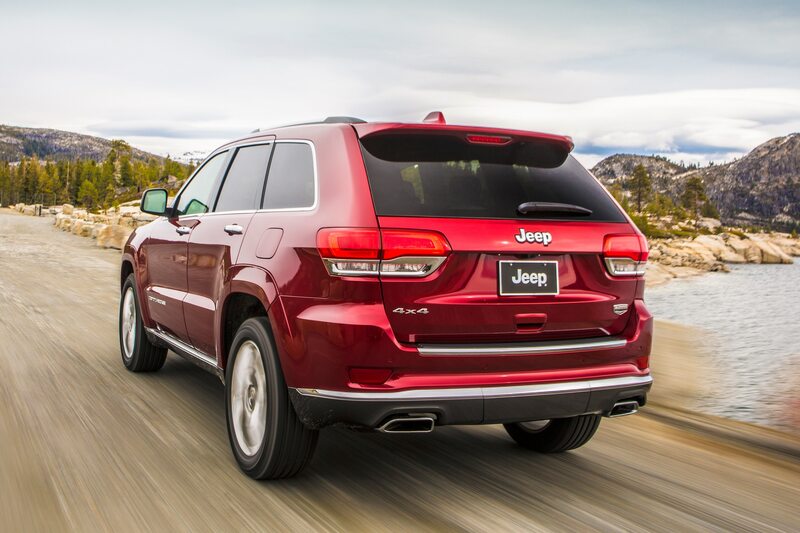 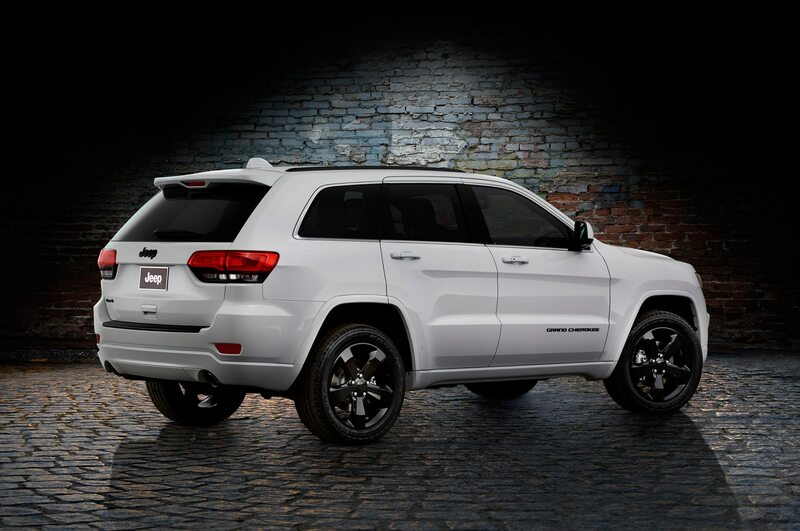 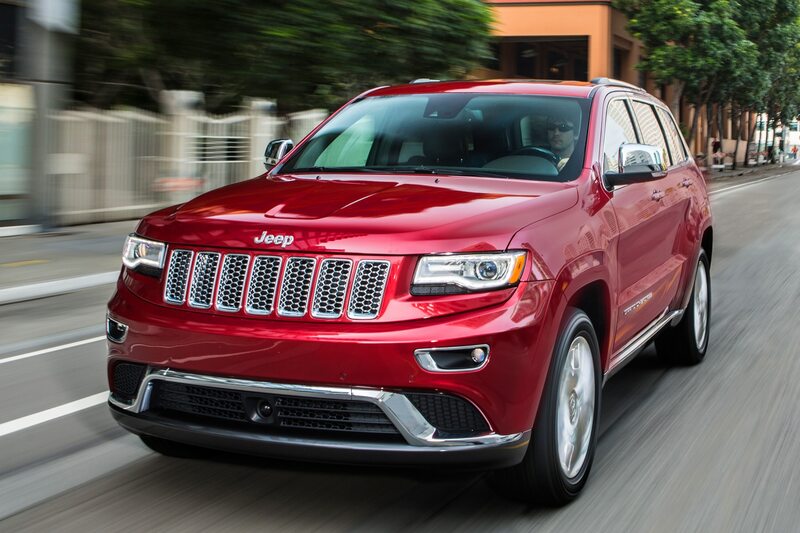 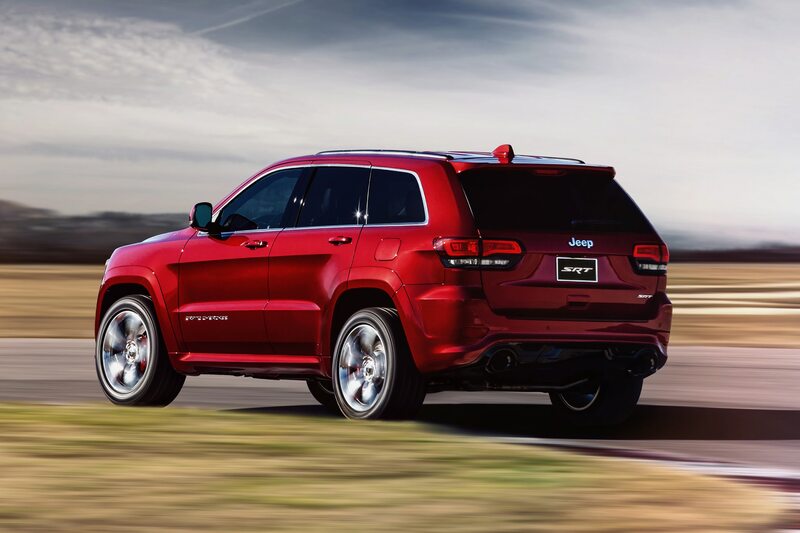 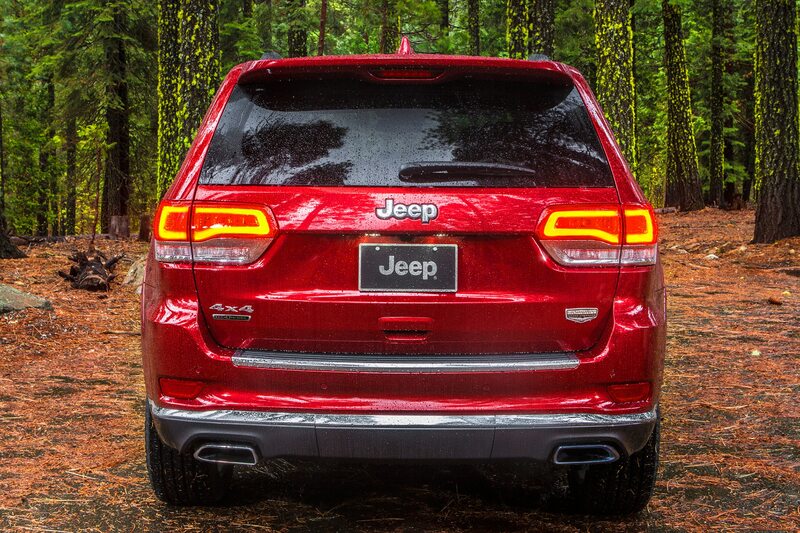 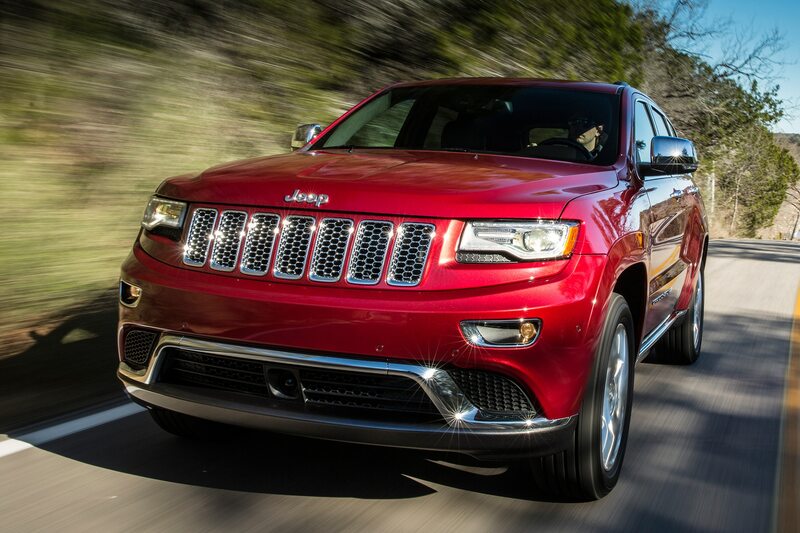 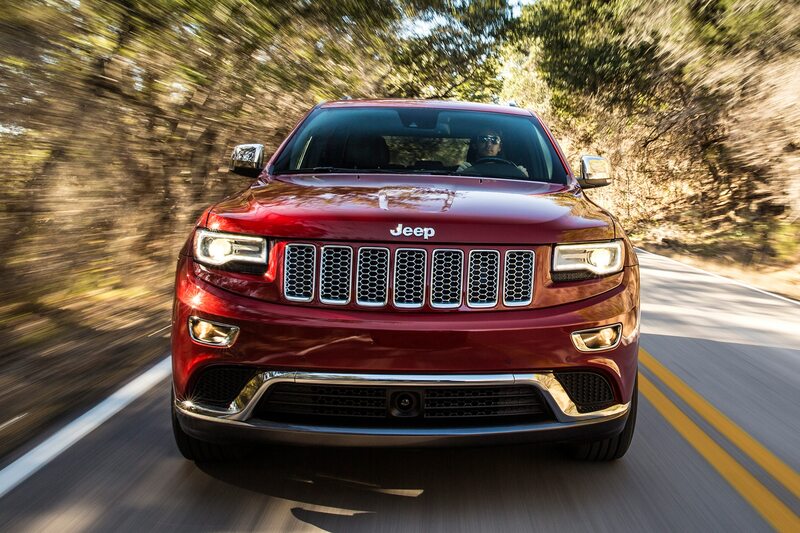 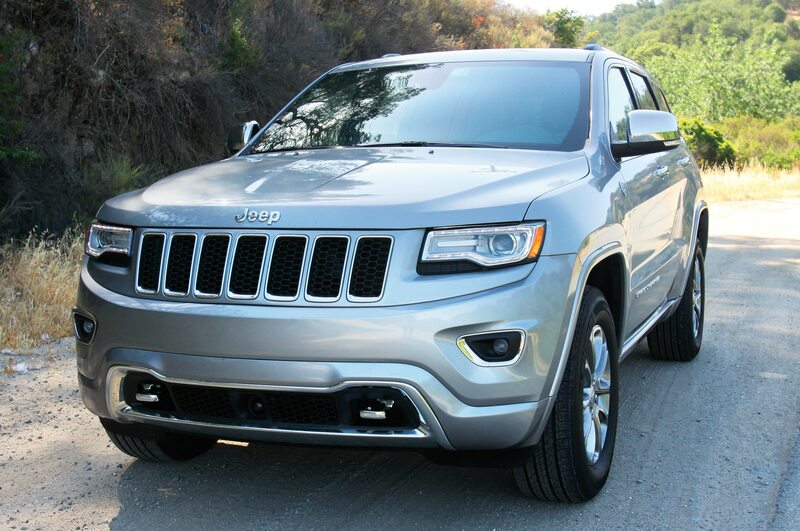 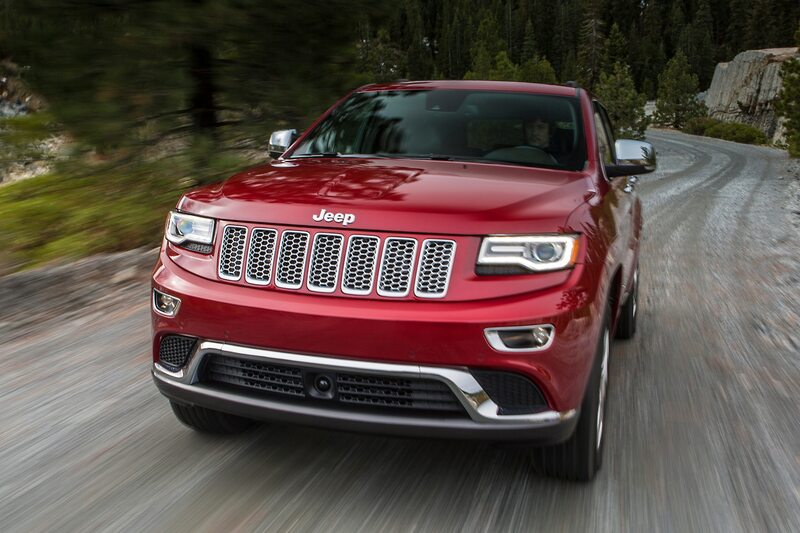 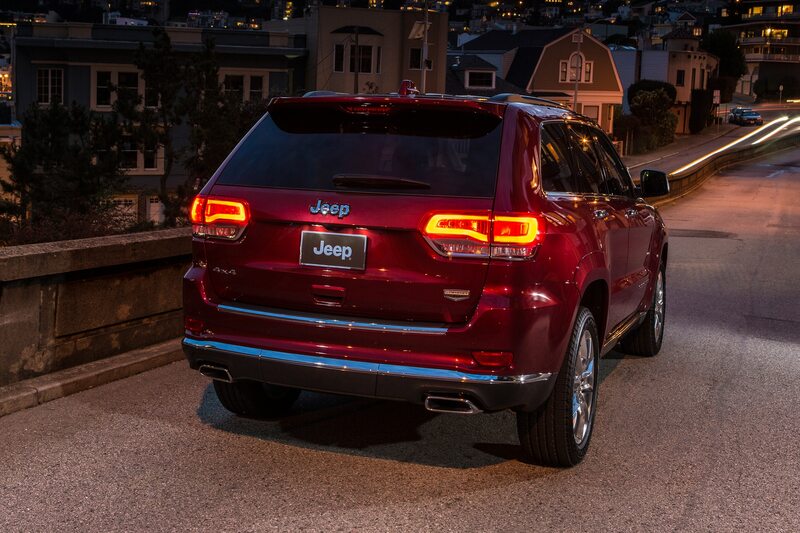 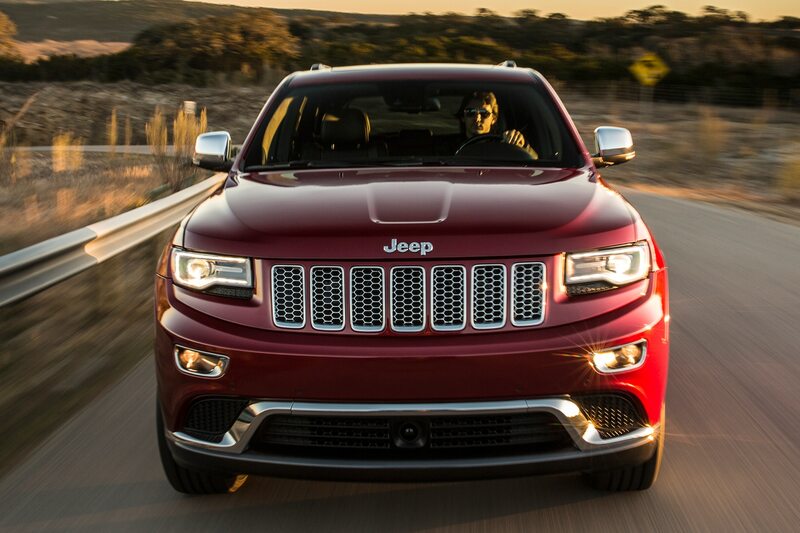 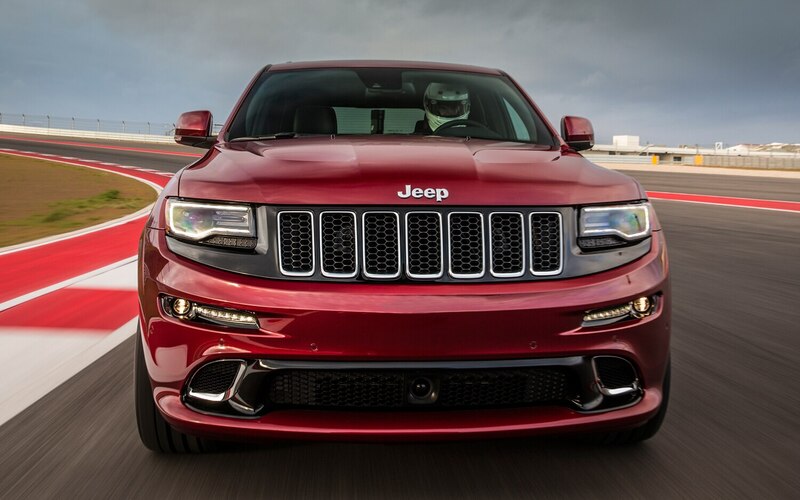 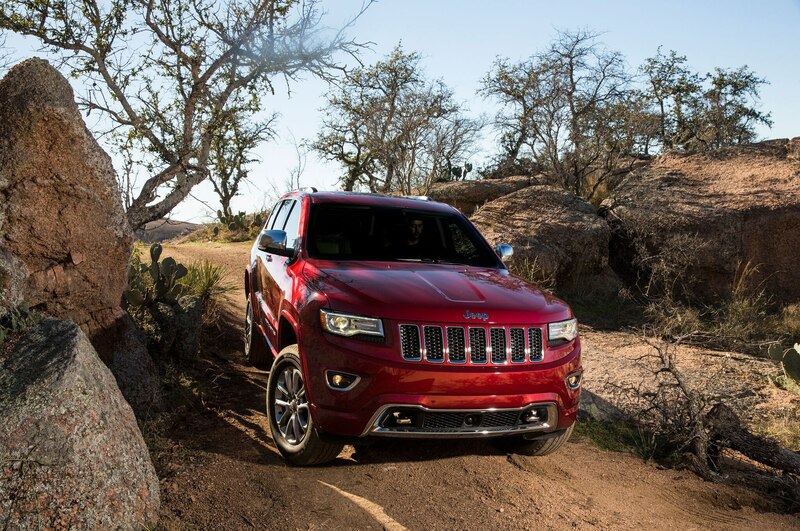 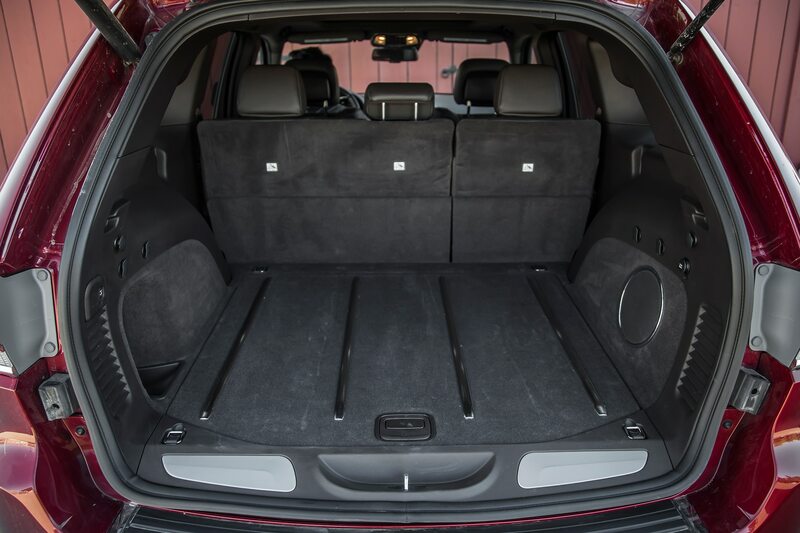 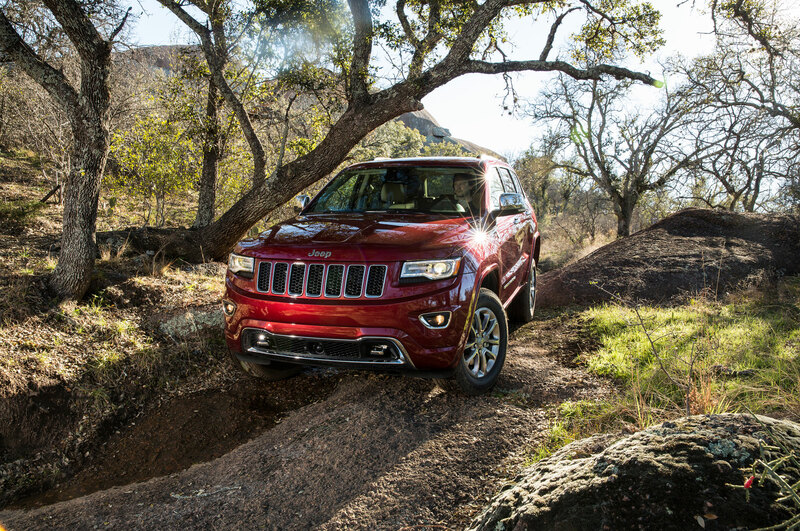 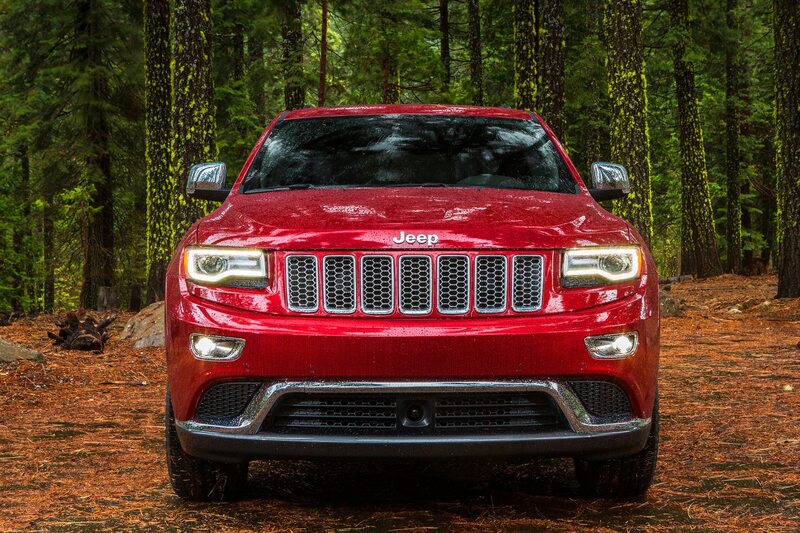 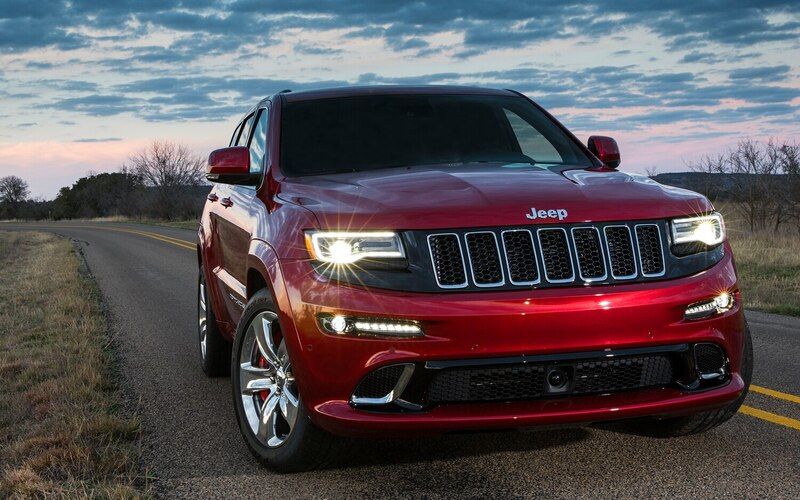 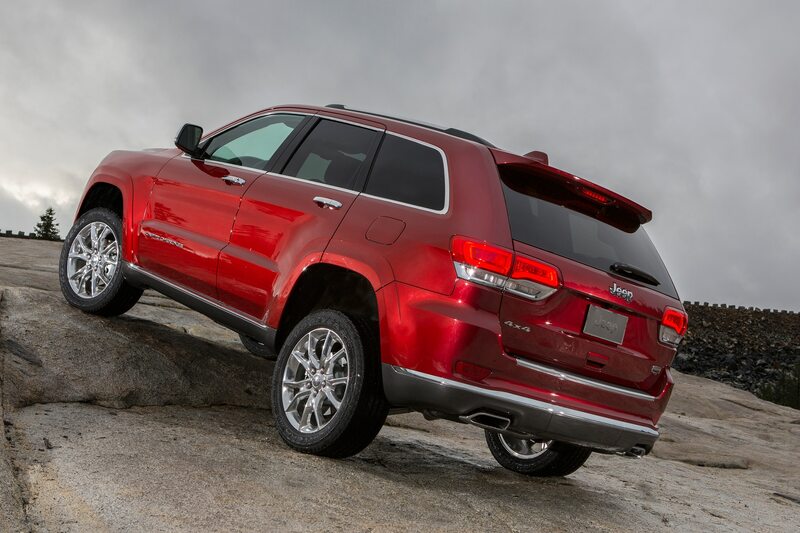 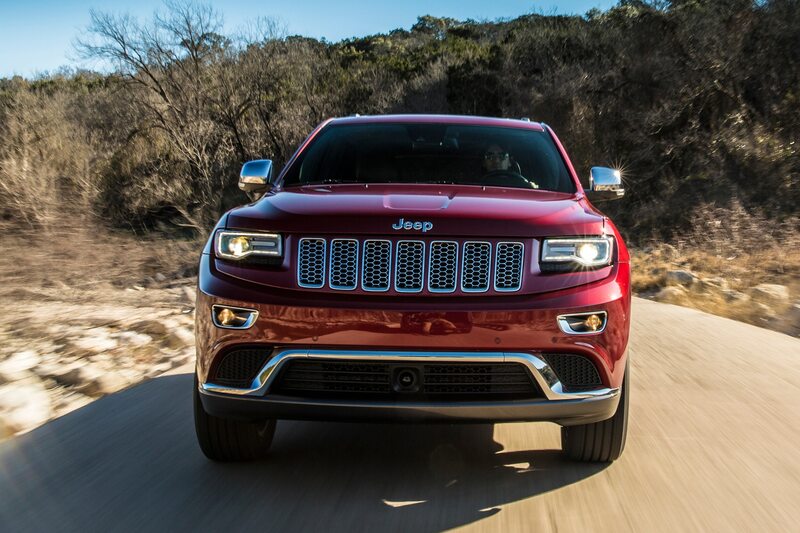 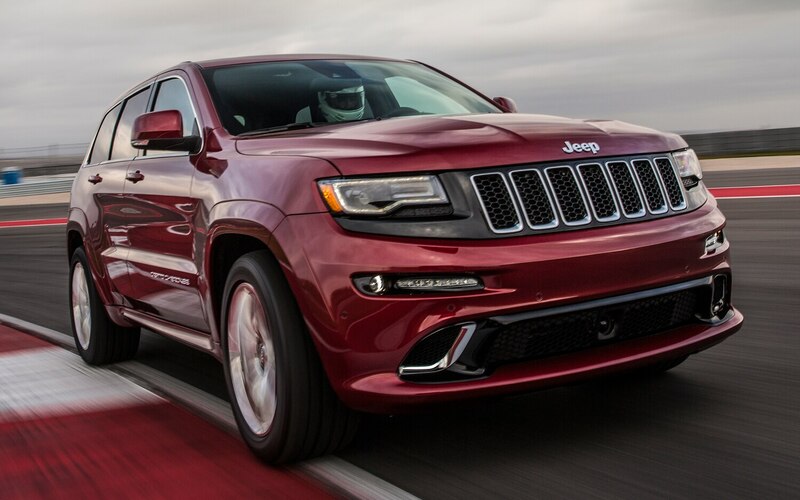 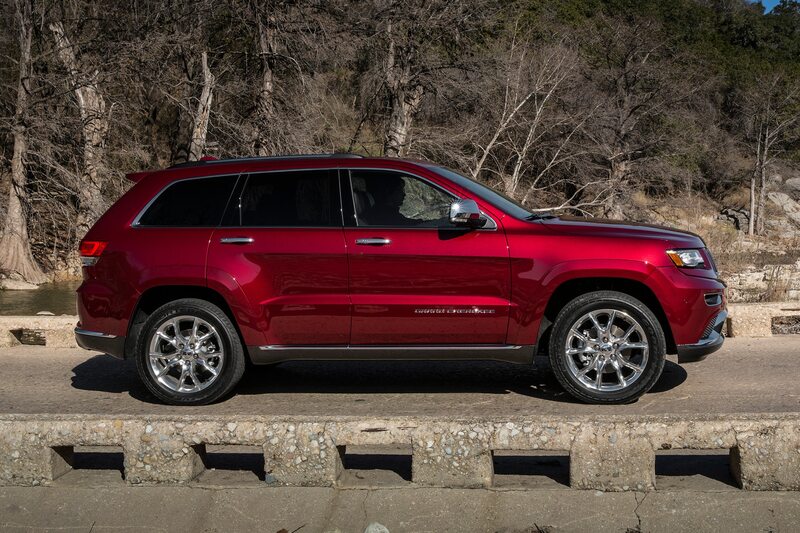 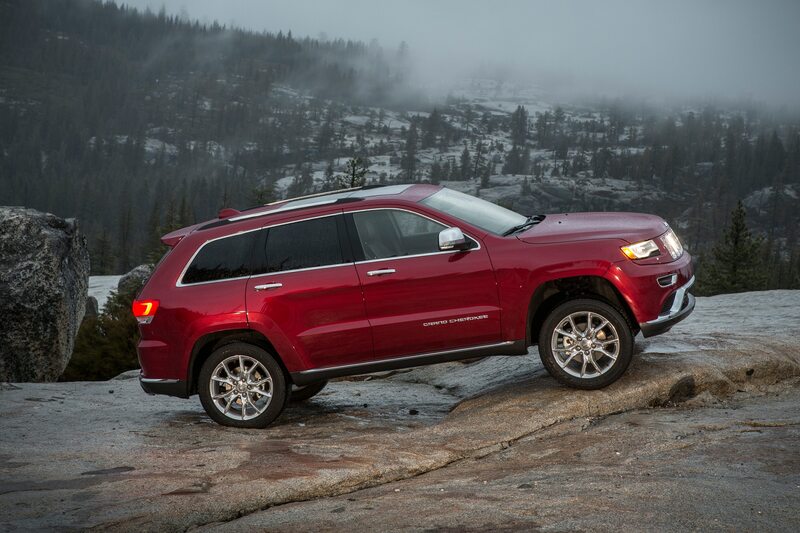 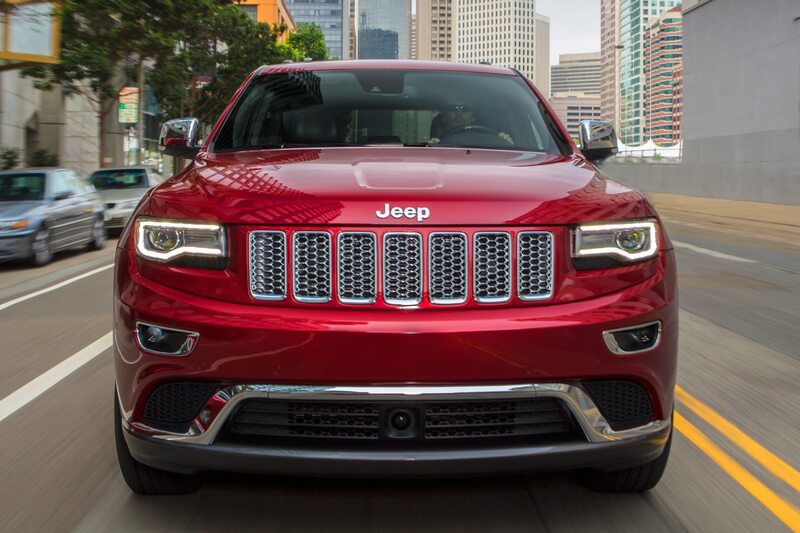 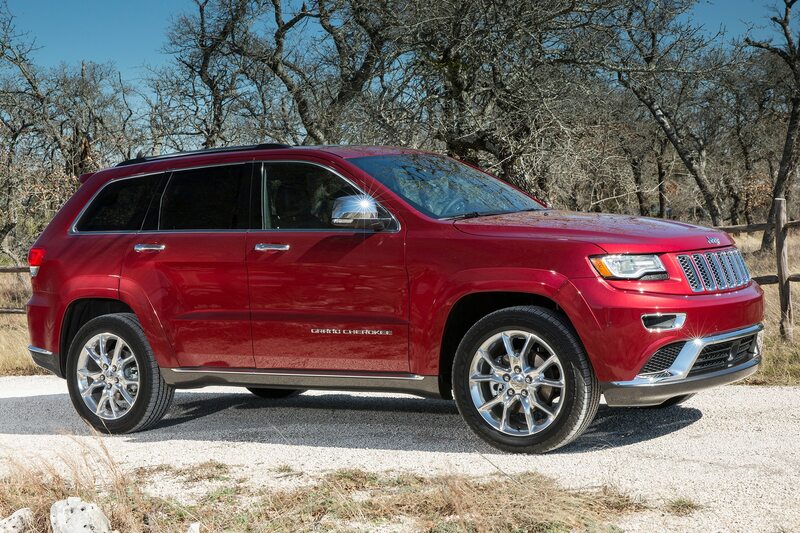 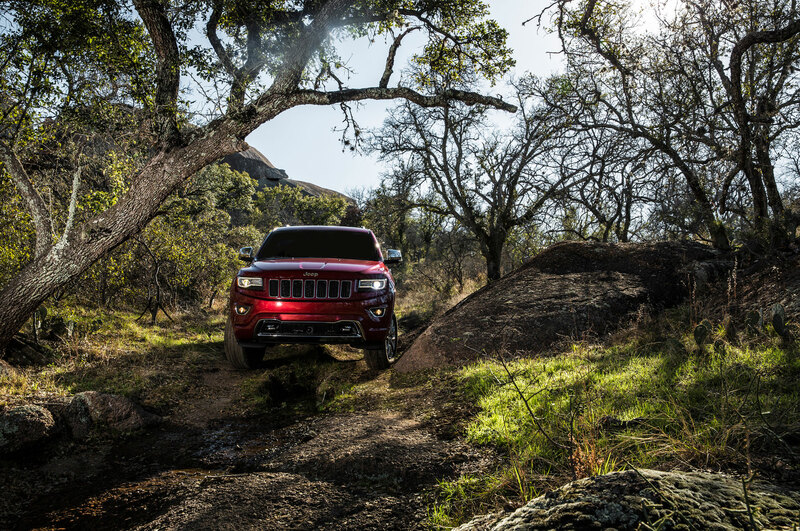 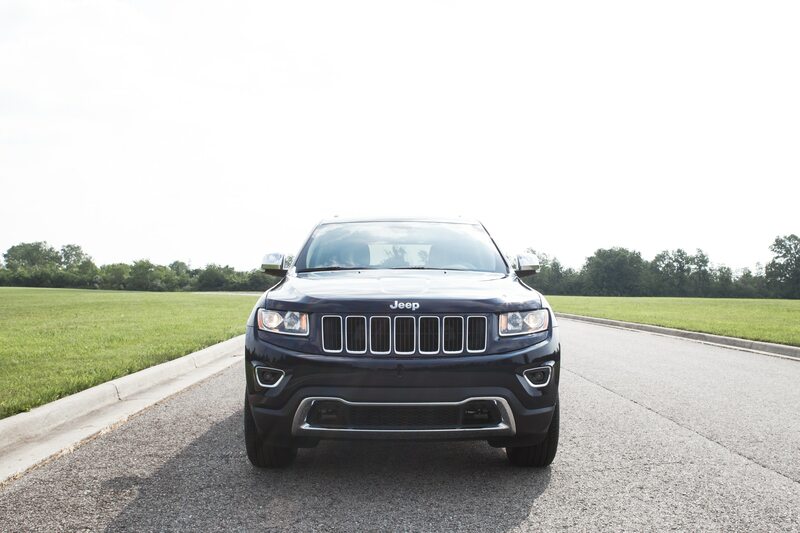 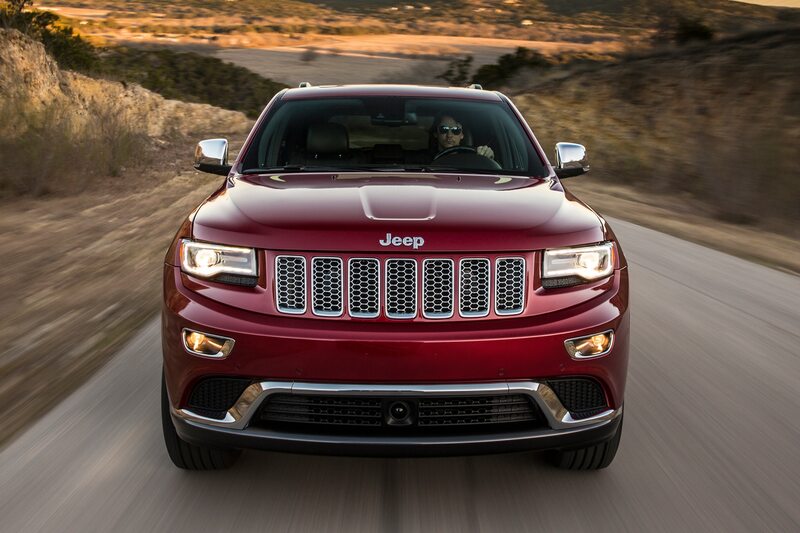 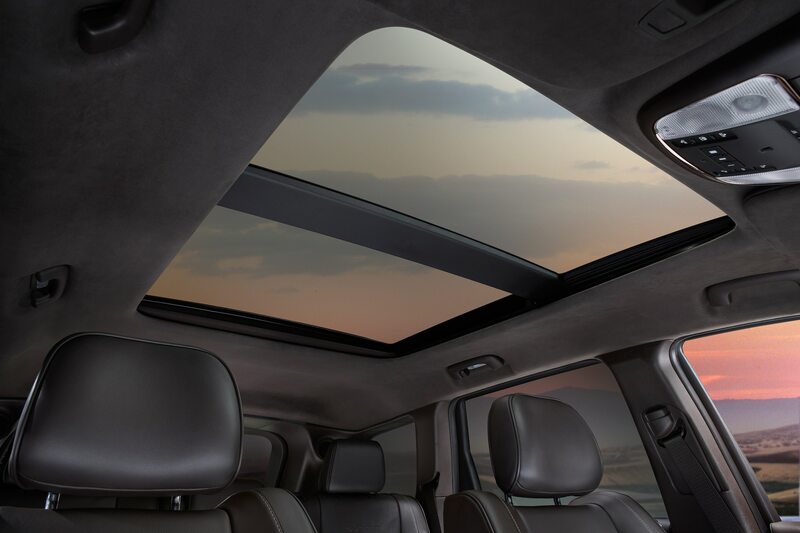 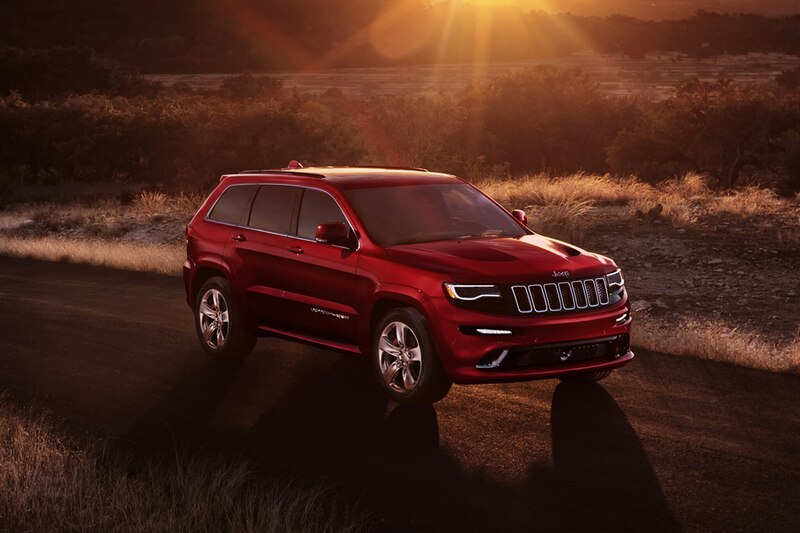 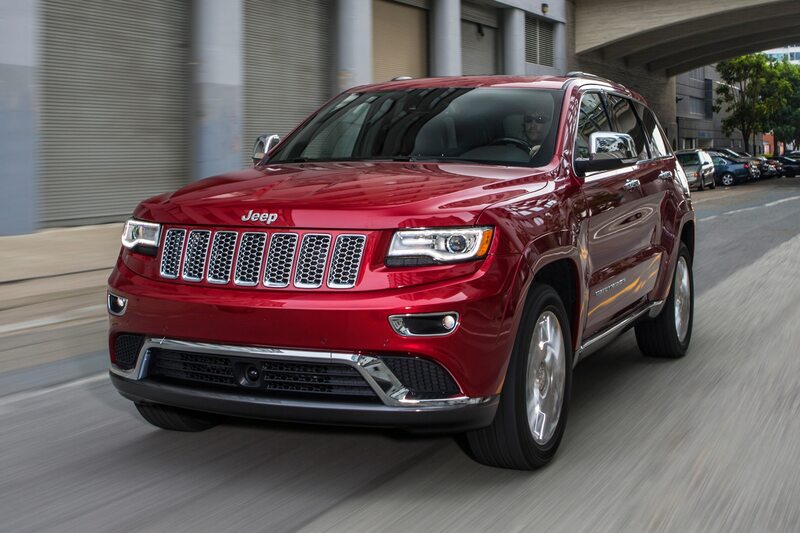 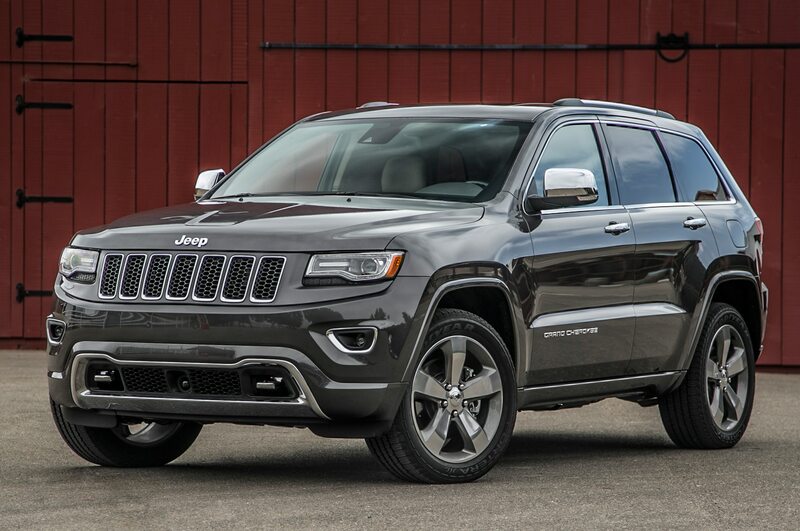 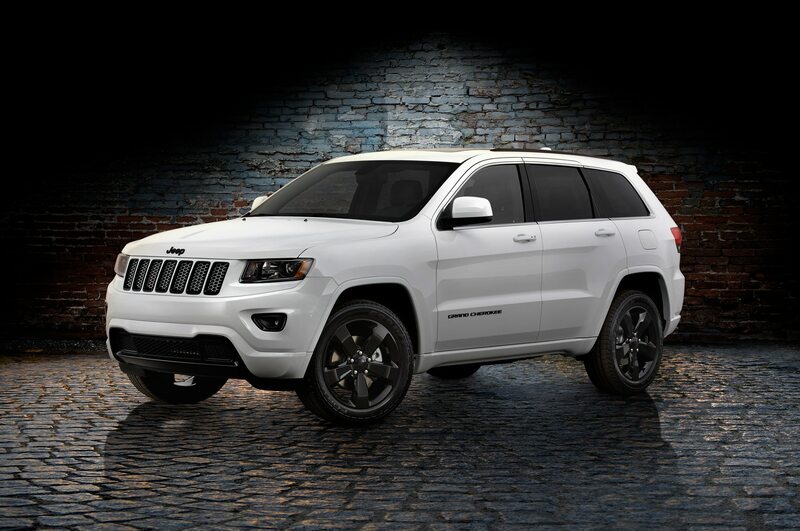 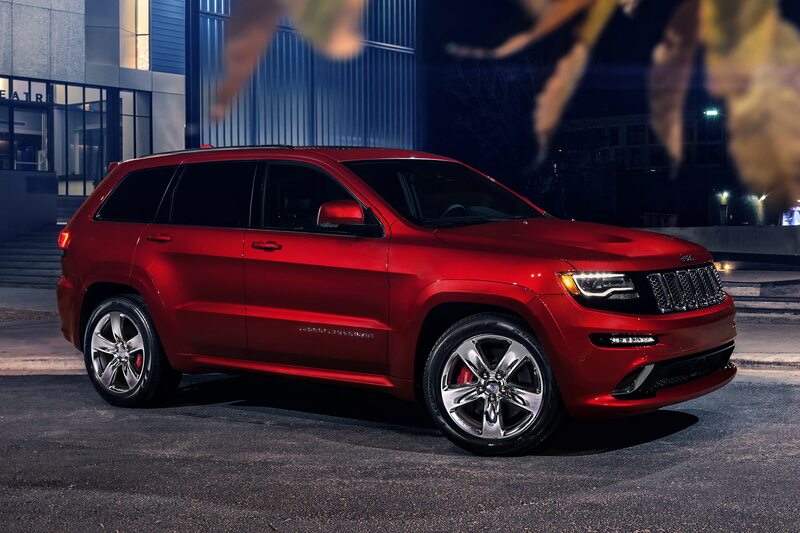 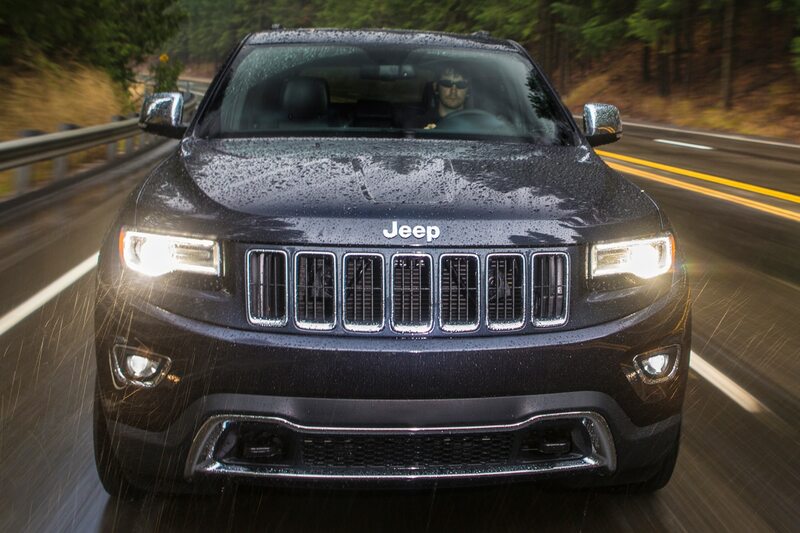 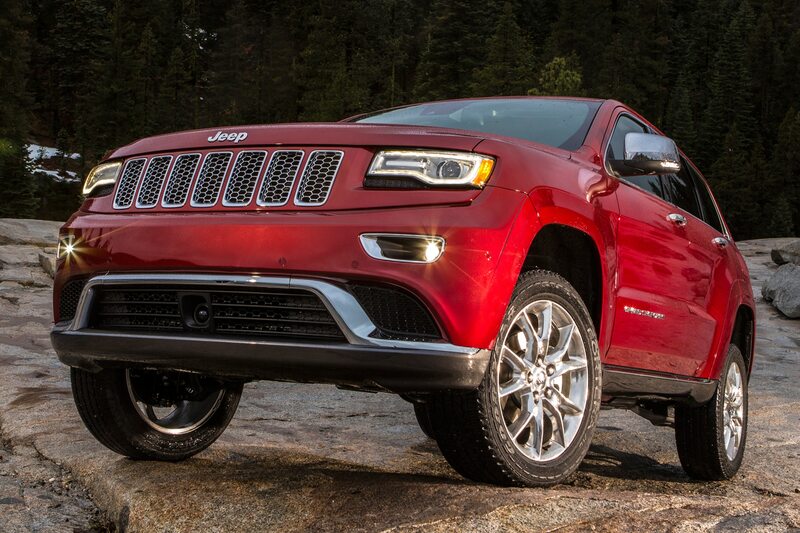 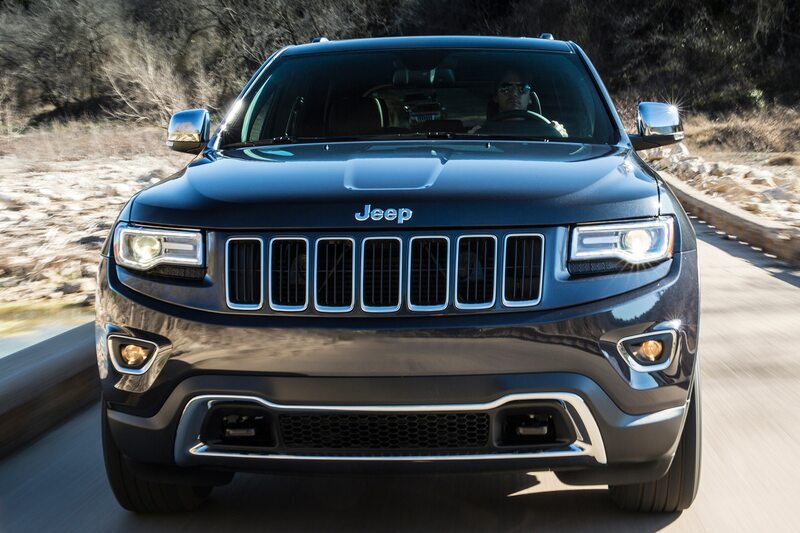 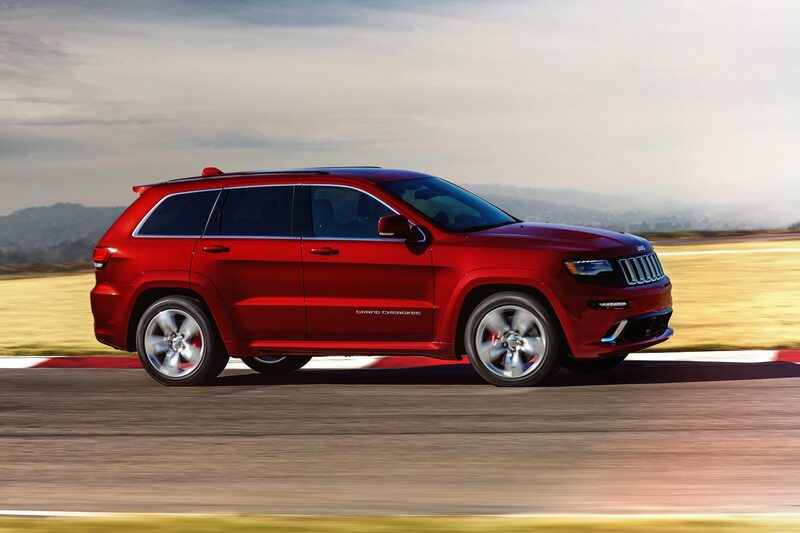 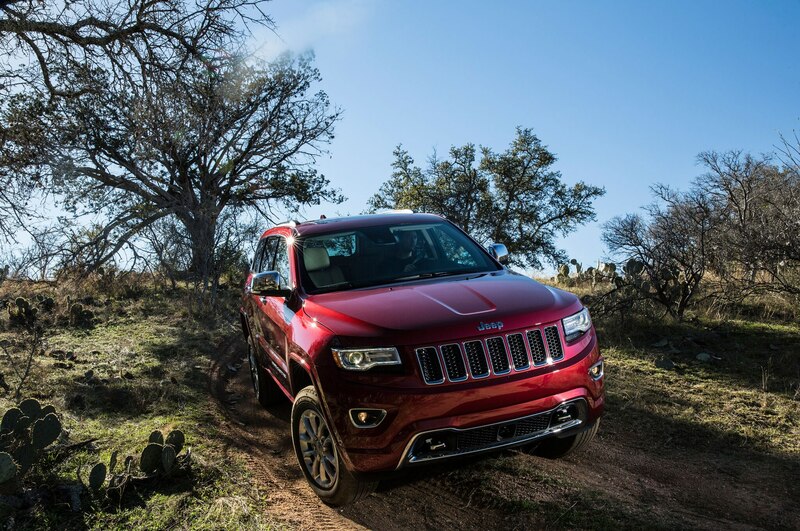 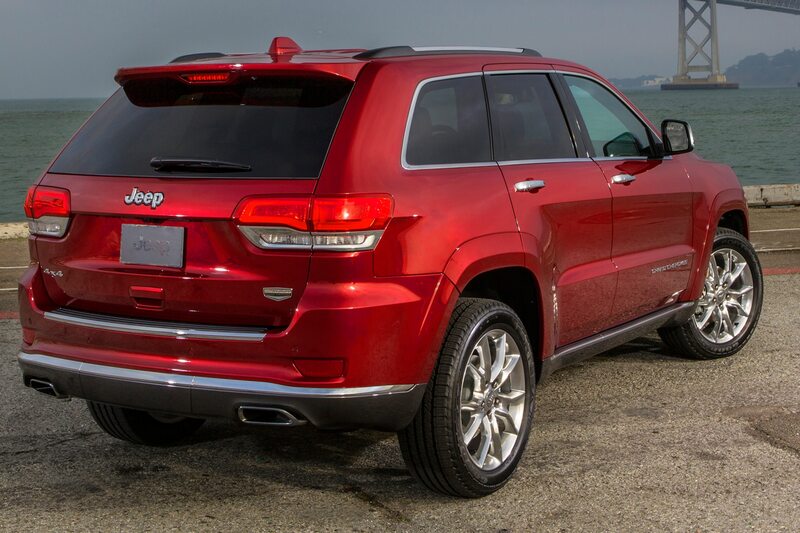 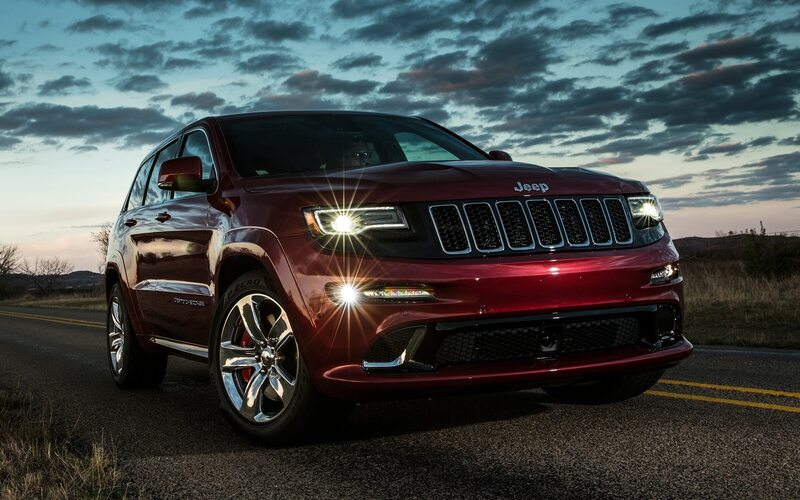 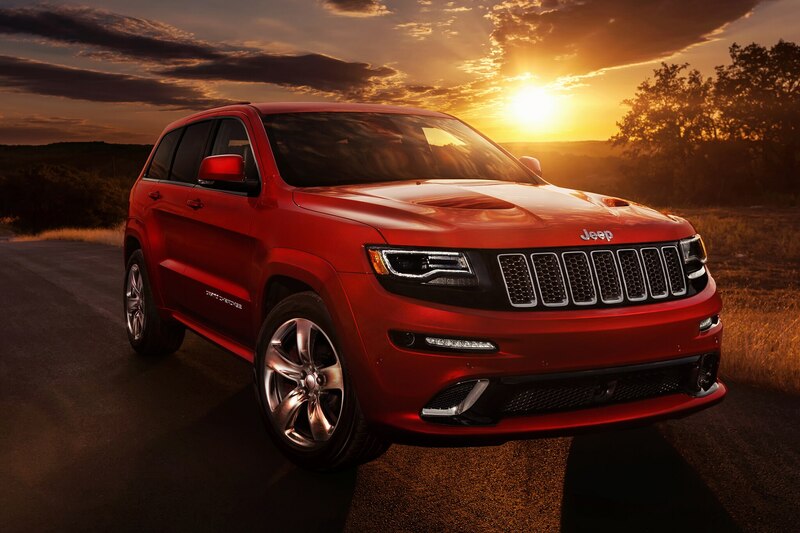 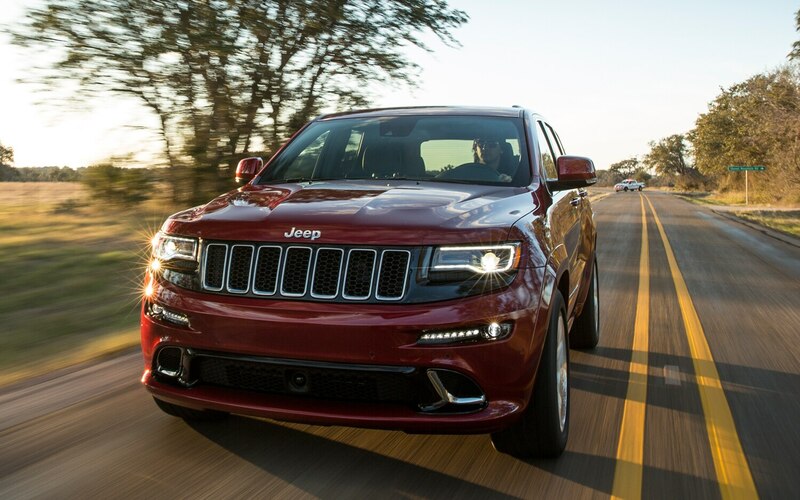 Being several superb vehicles in one, the Grand Cherokee proves that adaptivity is the key to dominating SUV ecology.